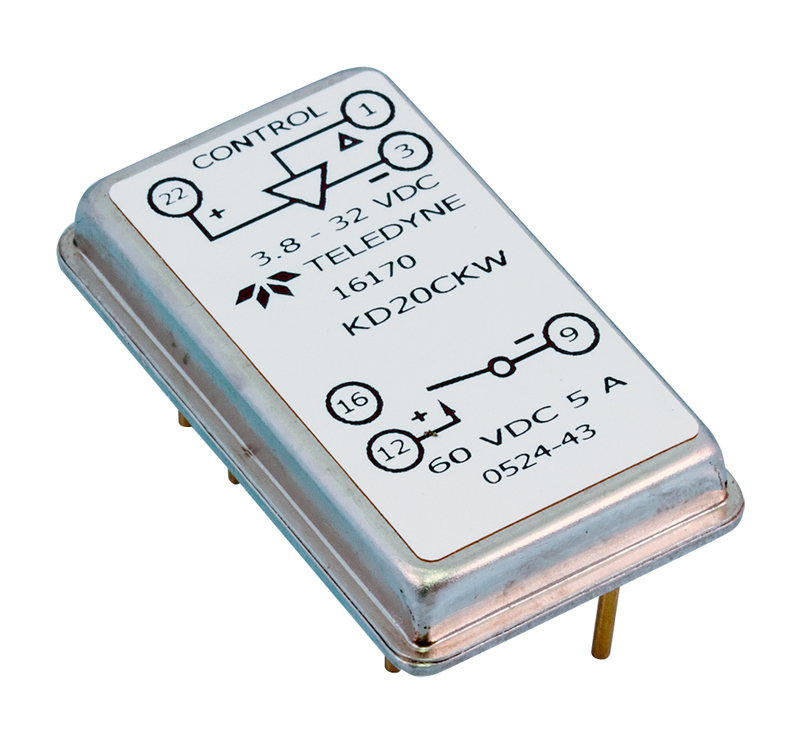 Control Dynamics "Dyna-Mite" electromagnetic relay. 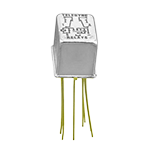 7 mA, 2000 ohms, 18 - 30v DC, 1/4 amp, SPDT. 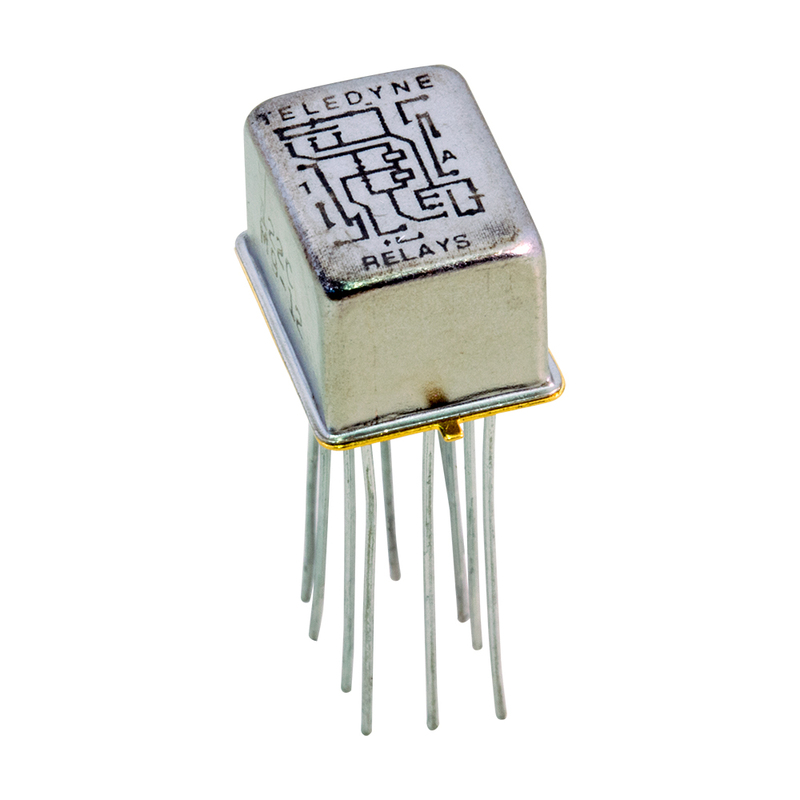 Hermetic case. Continous duty. 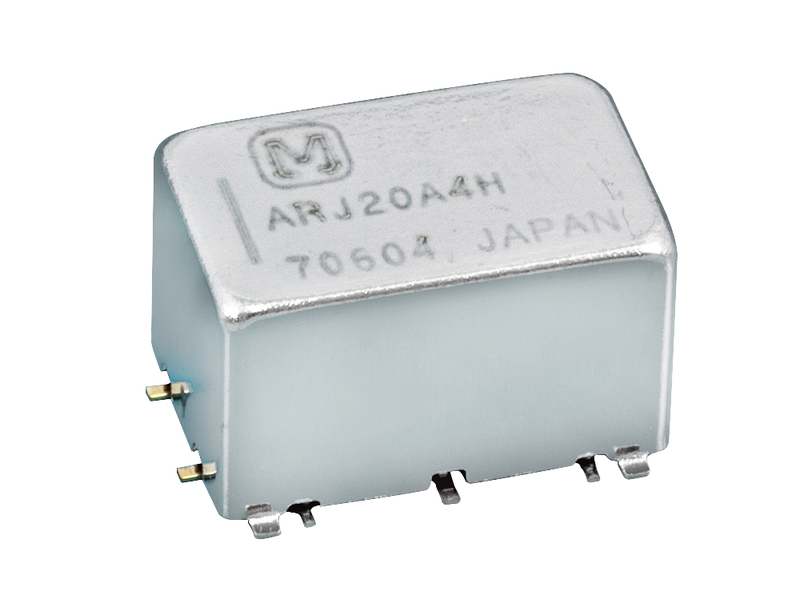 250 mA DC inductive load. 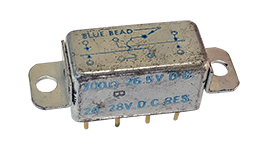 1.5" leads. 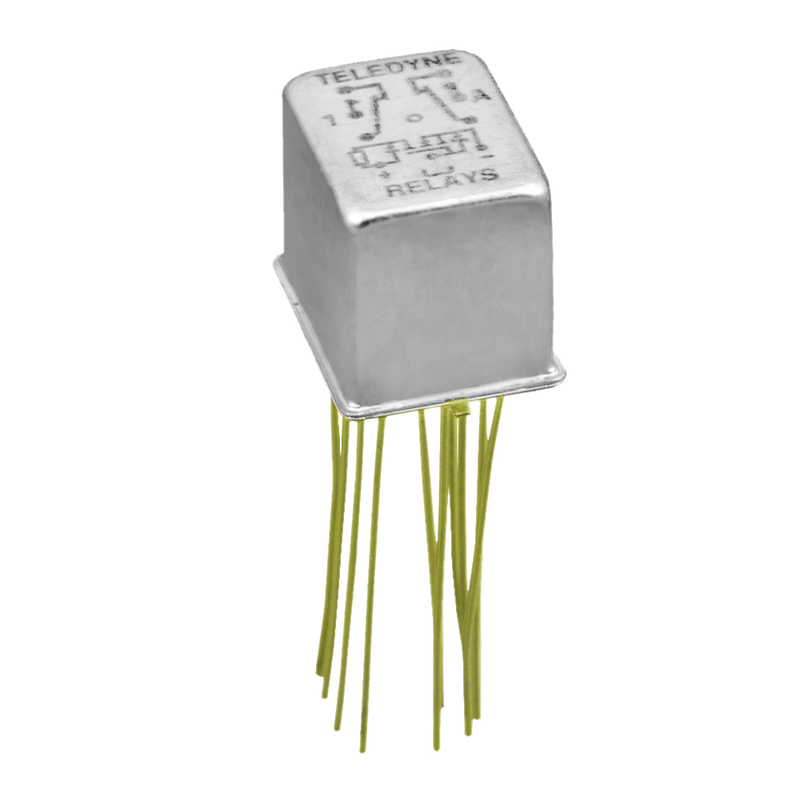 0.4"L x 0.6"H x 0.2" diameter. Alt. P/N: 455-0017-010. 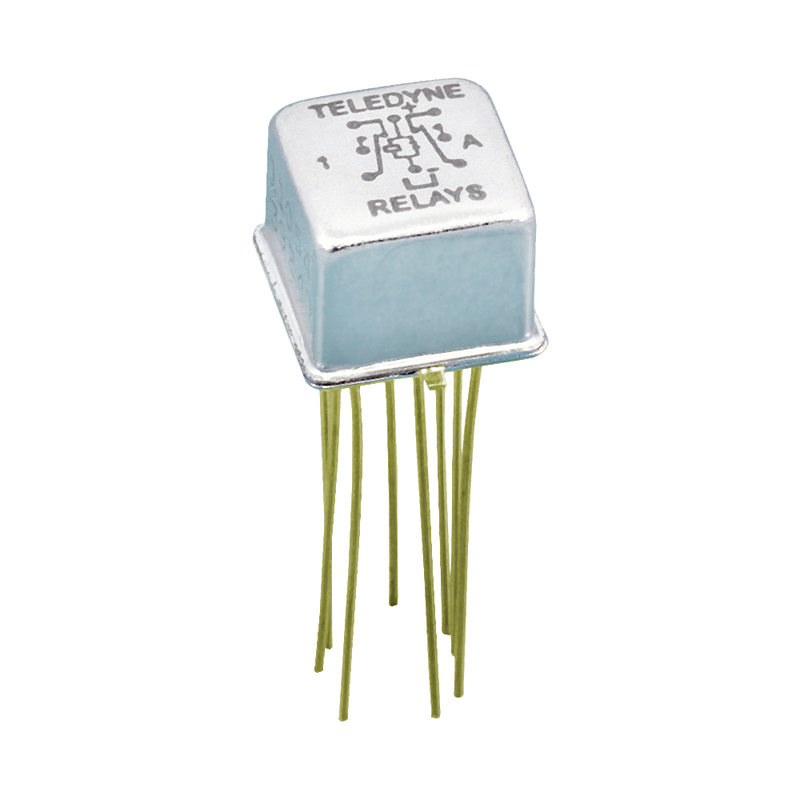 ES Portland sealed relay armature. 3.1v DC, 7.3 ohm coil. 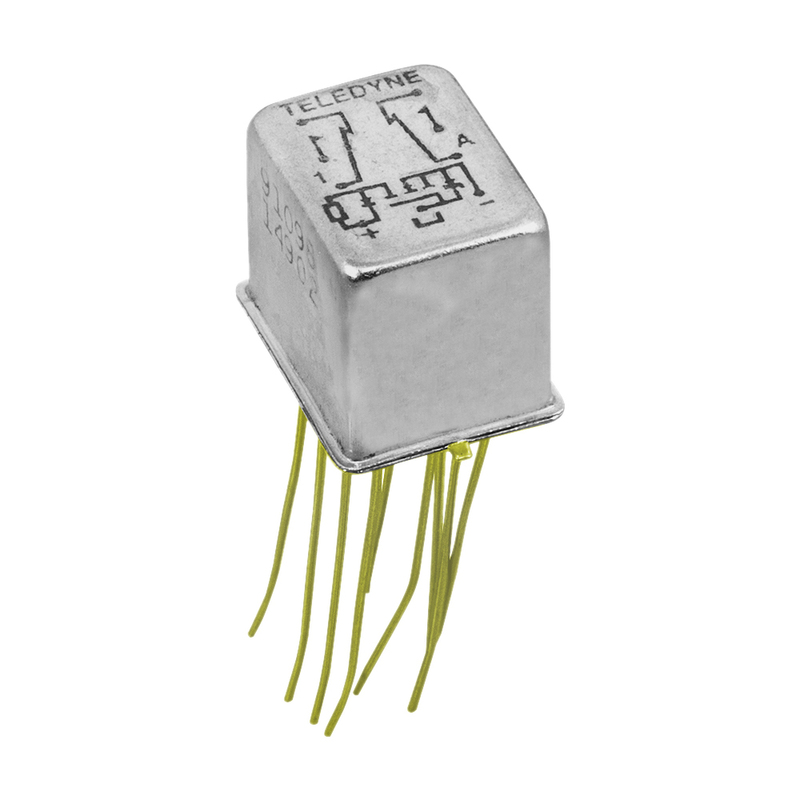 DPDT. 2A contacts. 8 solder hooks. 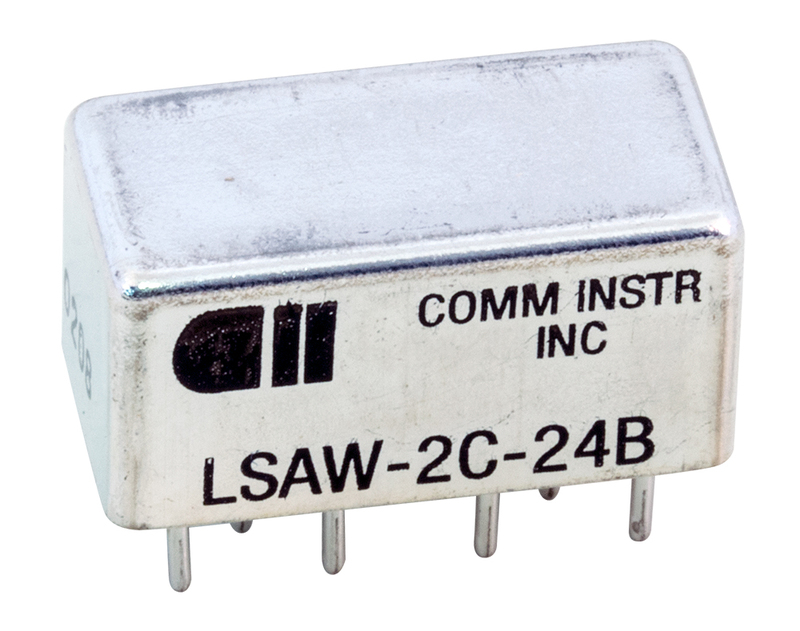 1" c-c mount holes. 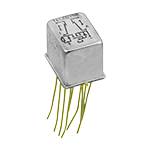 0.382" x 0.791" x 1.04"H. DSA900-68-M-EQ13. 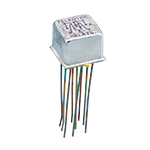 NSN: 5945-00-089-2529. 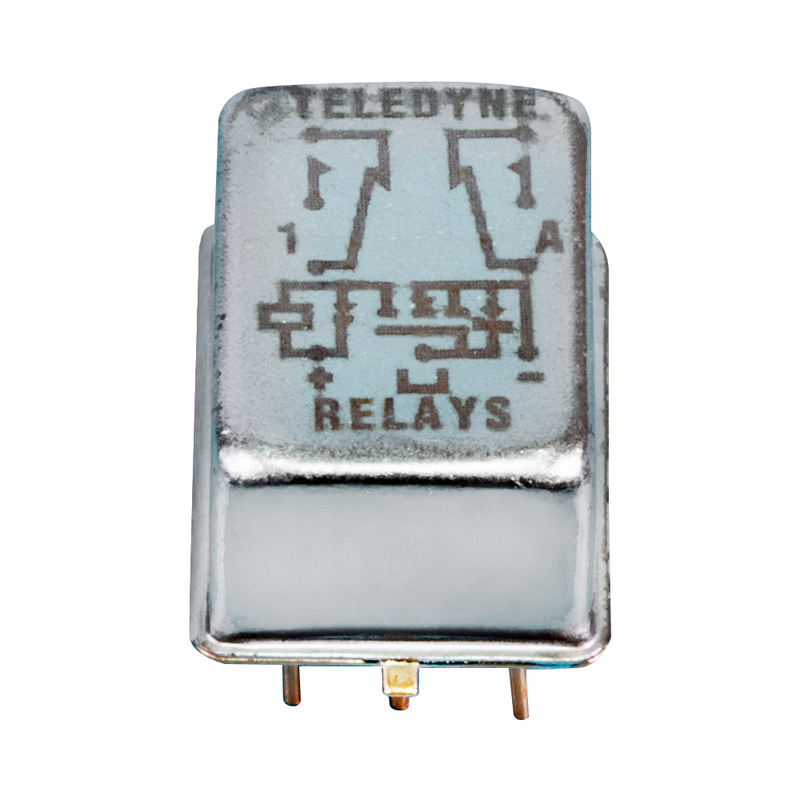 Leach Corp. time delay relay. Single pole. Hermetically sealed. 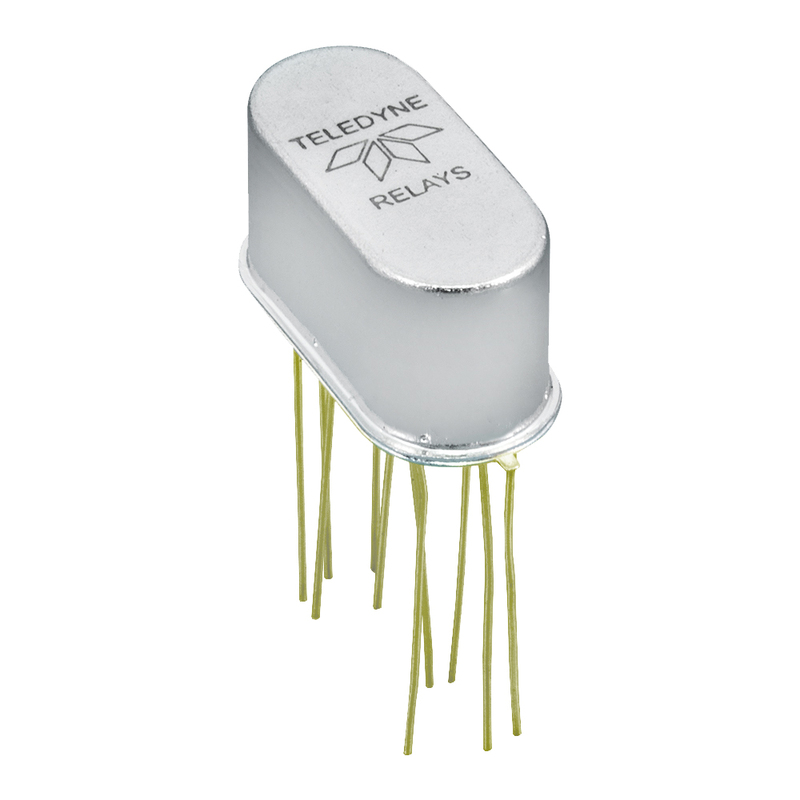 Crystal can relay. 8 solder hooks. 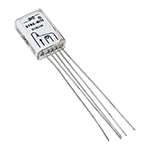 0.398" x 0.829" x 0.304"H. Aire Research P/N: 606134-2. 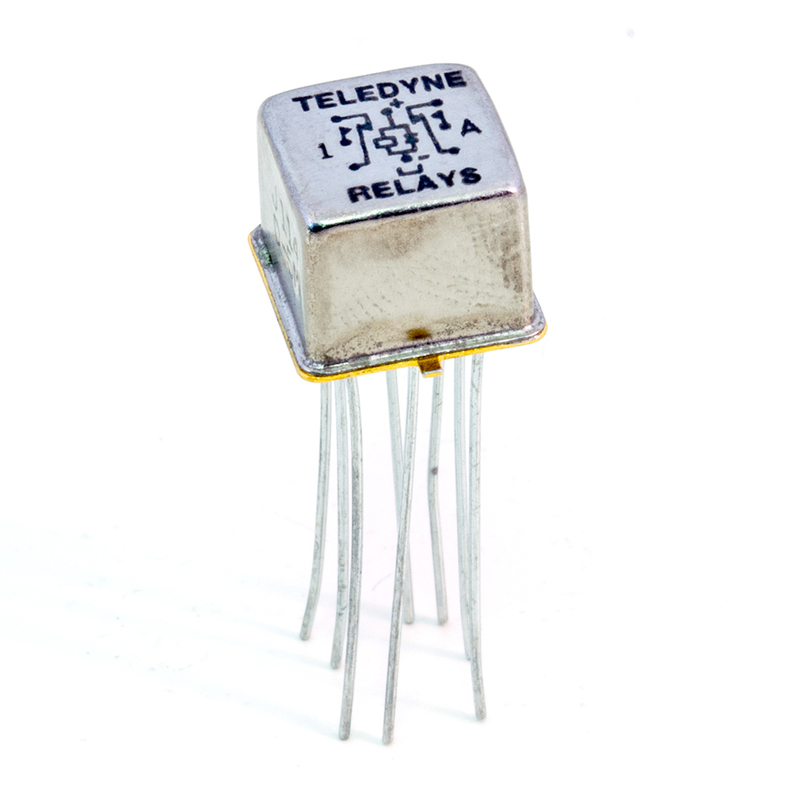 ES crystal can relay. 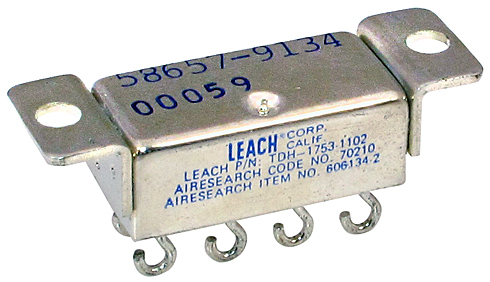 600 ohm coil, 26.4 vdc, 2PDT. 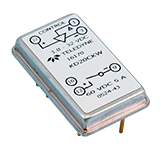 Contacts: 2 amp @ 115 vac / 28 vdc. 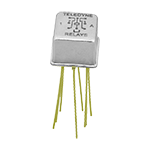 PC pins. 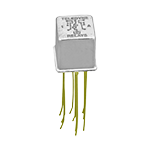 Mounting holes 1" c-c. NSN: 5945-00-051-2004. 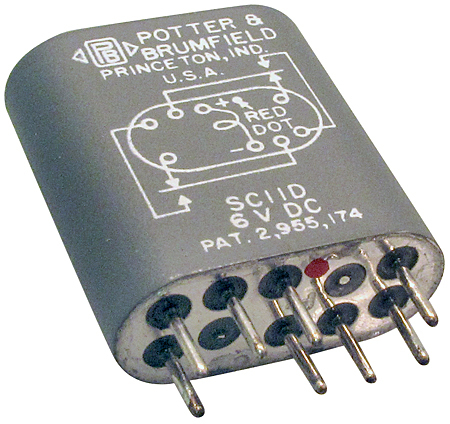 Potter & Brumfield crystal can relay. DPDT. 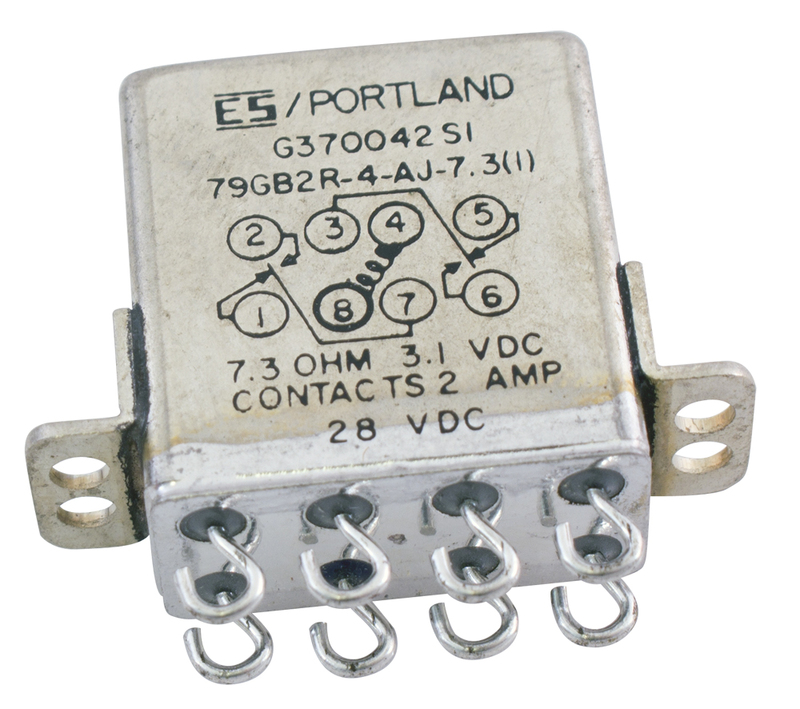 6 vdc coil. 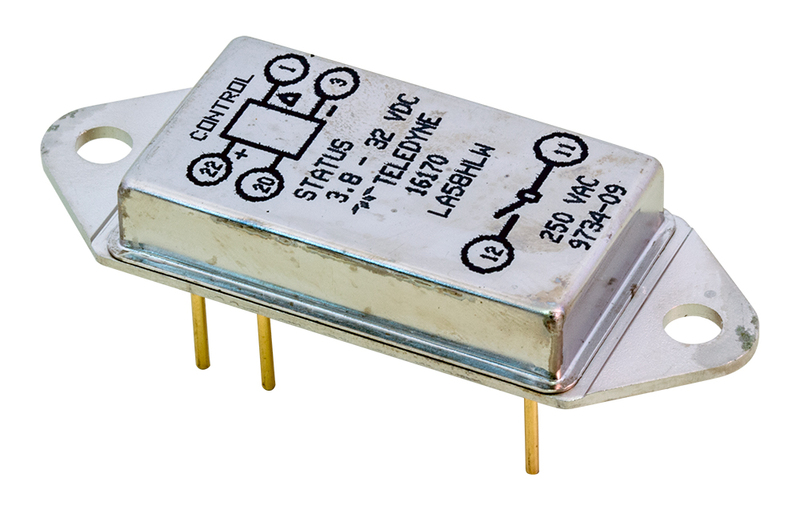 3 amp contacts. 7/8" x 25/32" x 11/32". CP Clare crystal can relay. 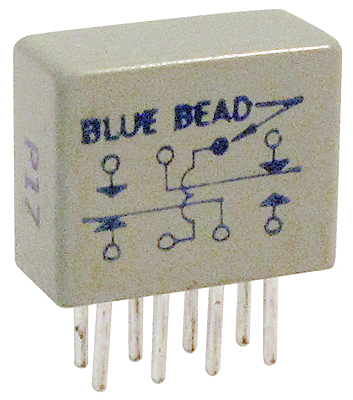 DPDT. PC mount. 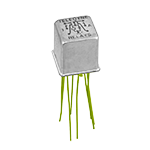 0.227" x 0.5" x 0.4" high. 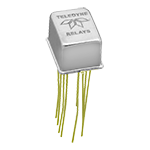 Allied Controls armature sealed relay. DPDT. 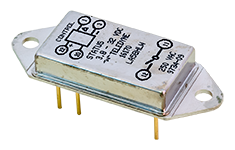 1/2 amp contacts. 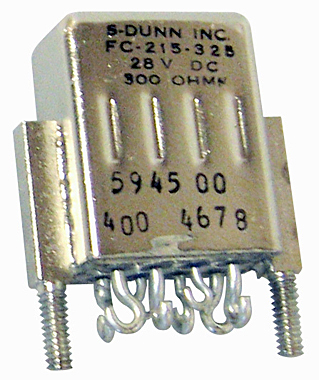 200 ohm coil. Gold plated. 8 solder hooks. 1-1/8" c-c mount holes. 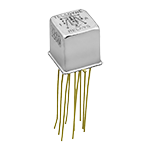 0.327" x 0.729" x 1"H. NSN: 5945-00-787-3072. 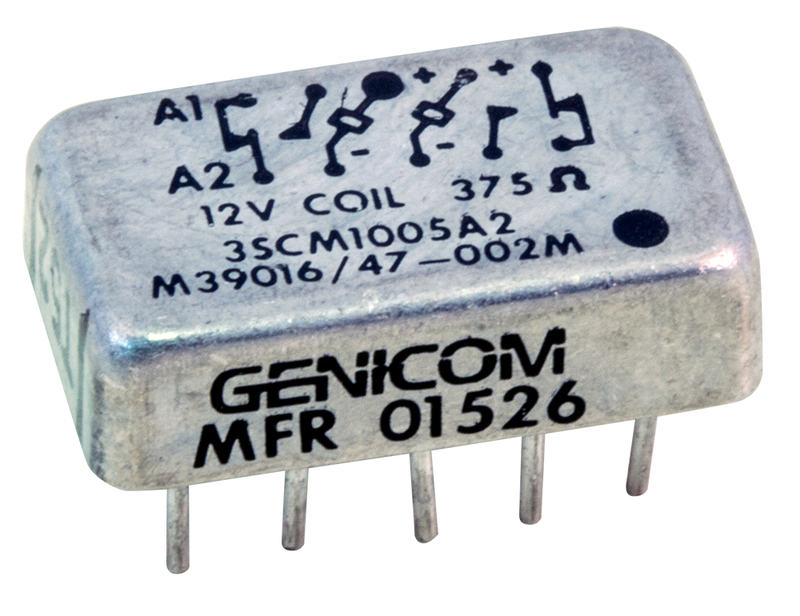 Genicom electromagnetic crystal can relay. 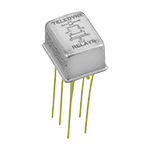 SPDT, 2 amp contacts. Hook terminals. 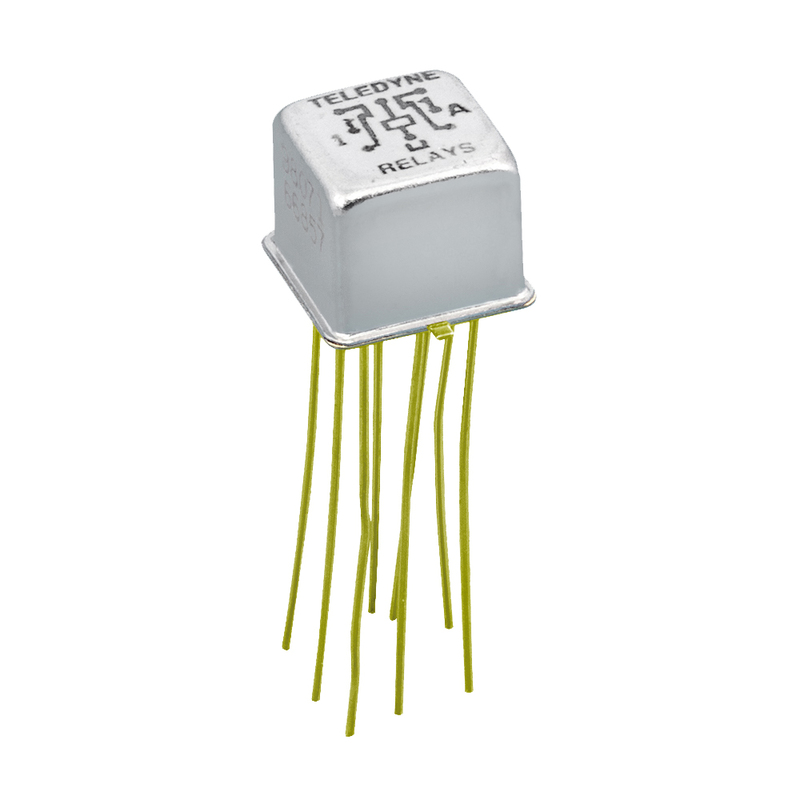 2.36k ohm coil, 10 ma operating current. Maximum pull up 8.4 ma. 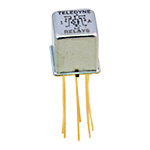 11/32" x 3/4" x 1-3/16". Collins P/N: 974-0766-00. 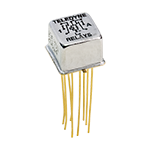 NSN: 5945-00-947-5770. C.P. 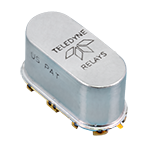 Clare DPDT crystal can relay. 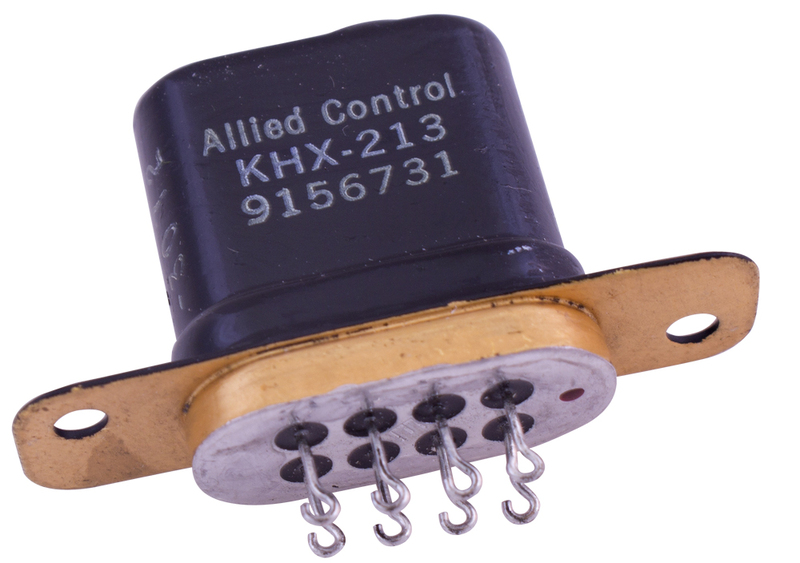 26.5 vdc coil, 2 amp contacts. 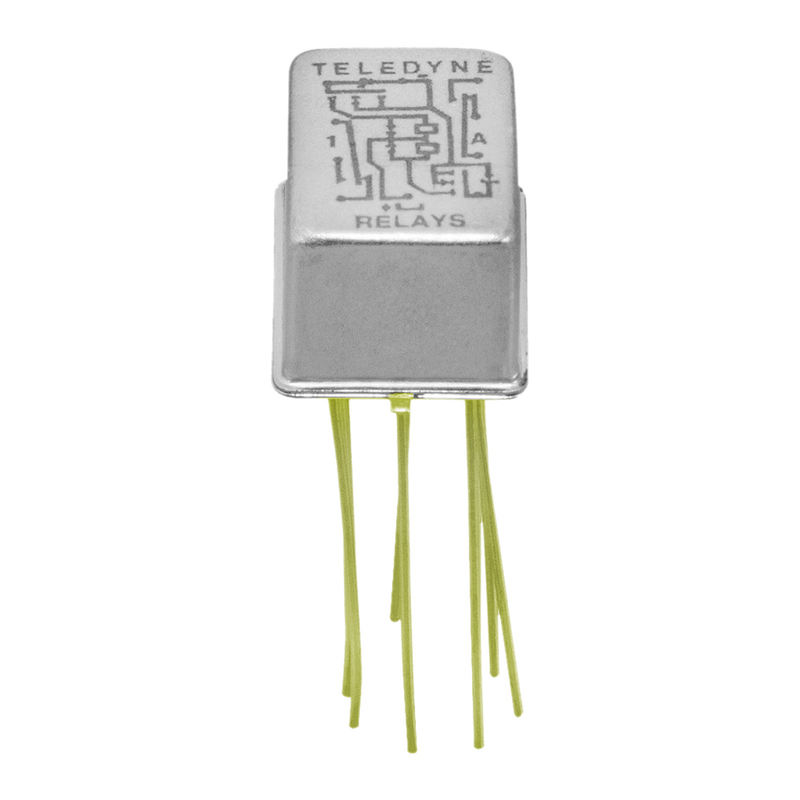 3" leads. 11/32" x 25/32" x 7/8"H.
C.P. 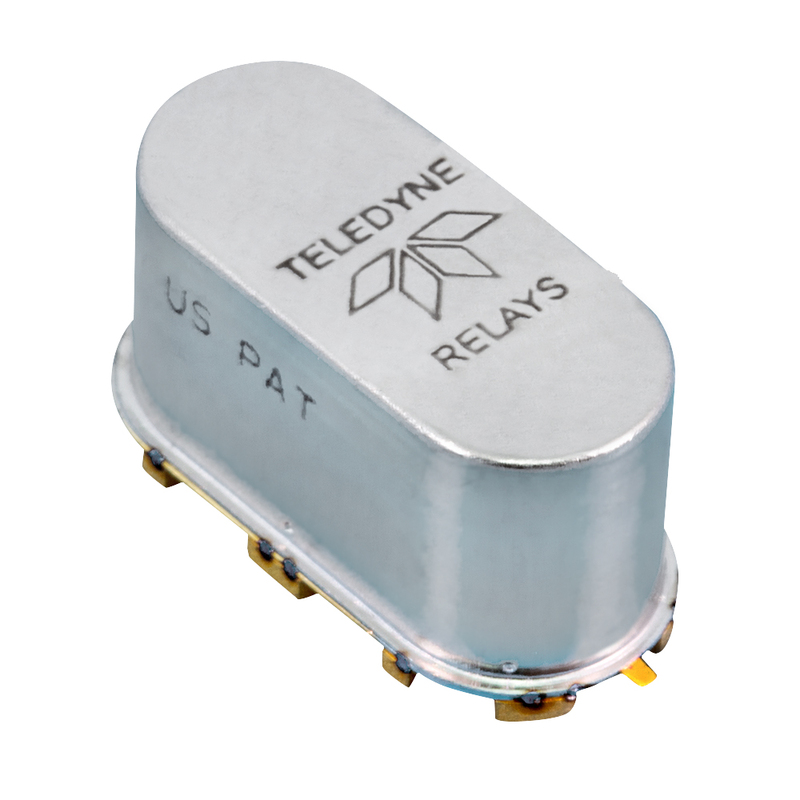 Clare 2PDT crystal can relay. 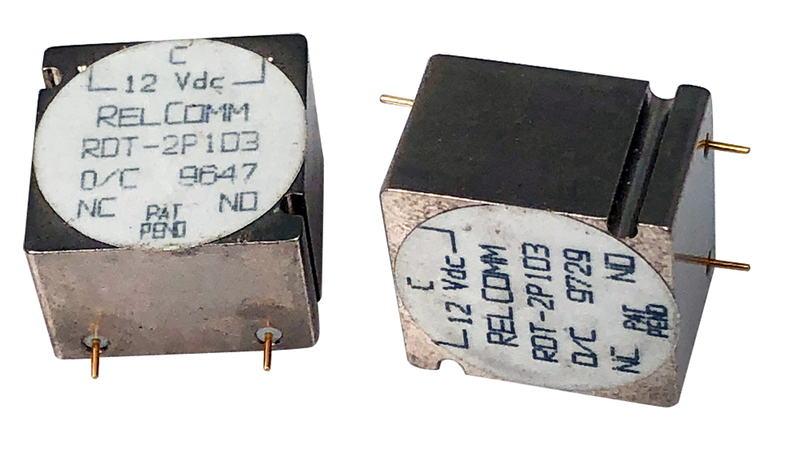 2 amp contacts. 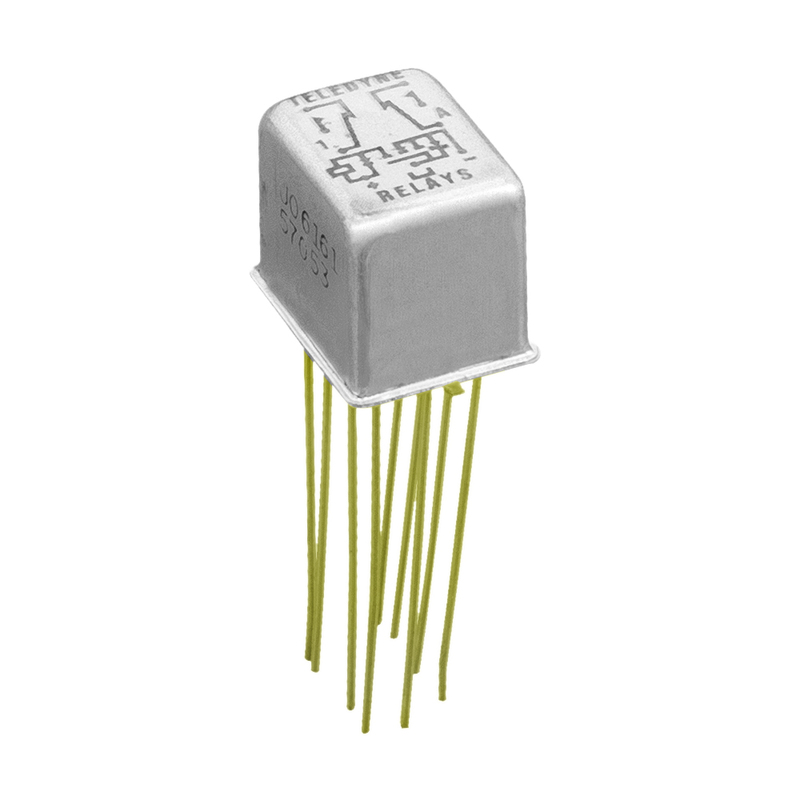 26.5v DC. 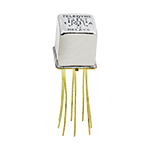 Gold pins. 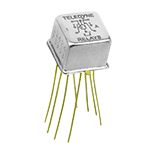 NSN: 5945-01-067-5004. 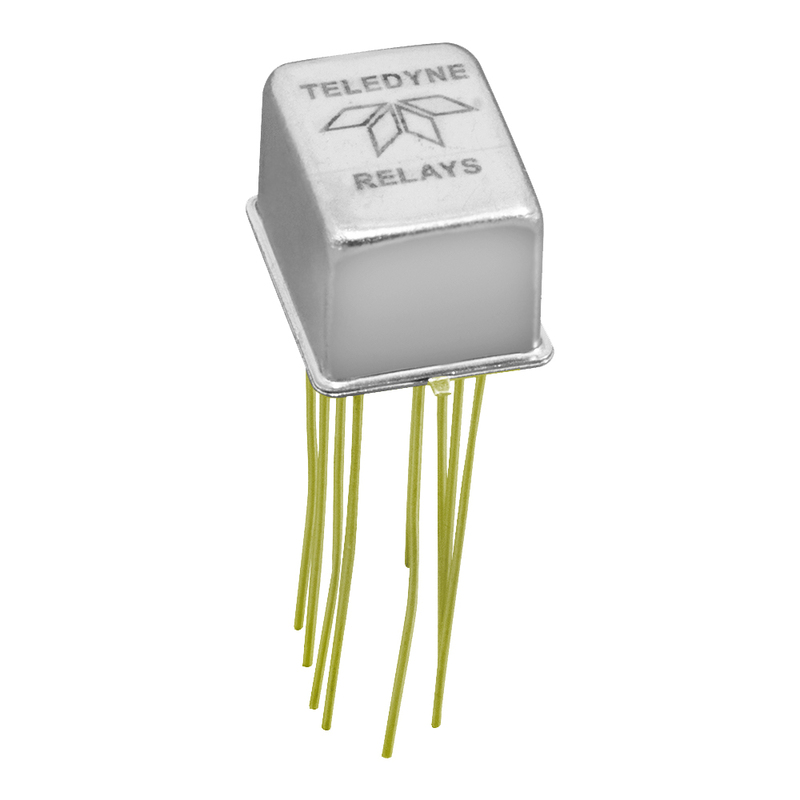 S-Dunn DPDT crystal can relay. 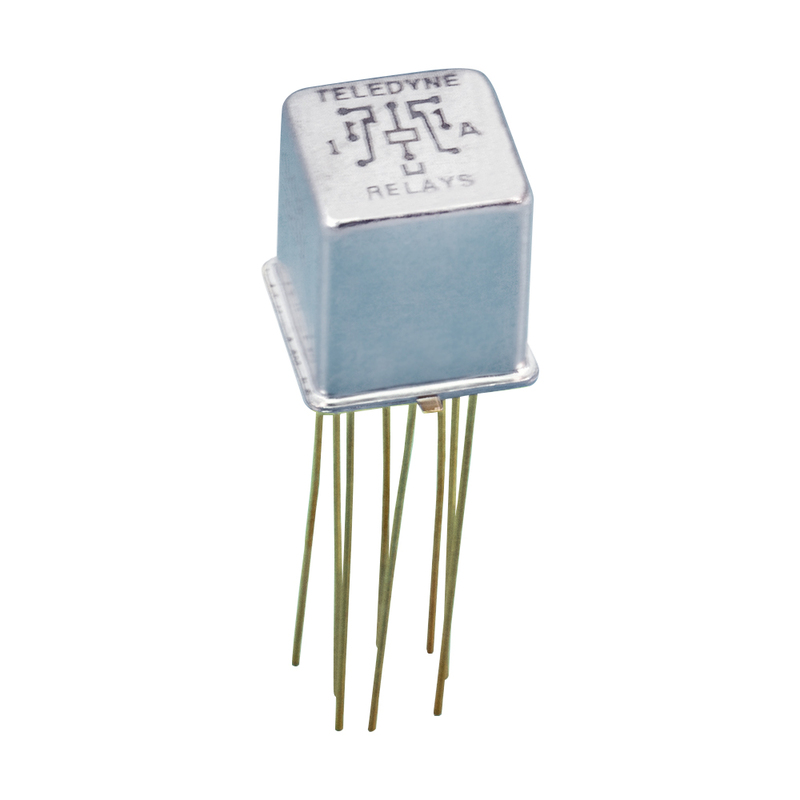 5 amp contacts. 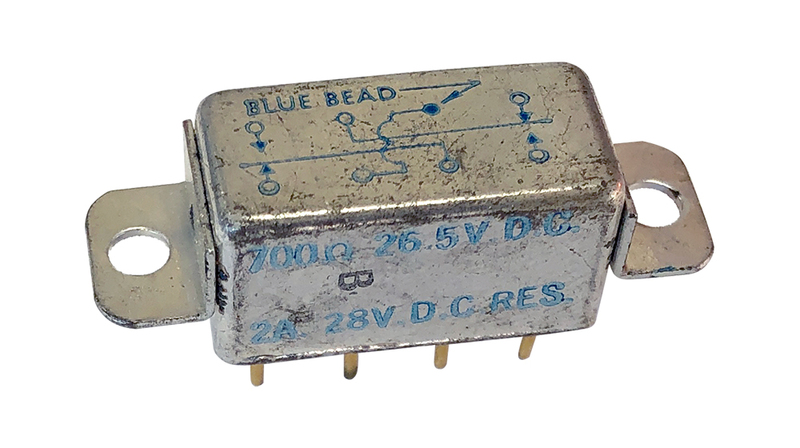 28 vdc, 300 ohm control. 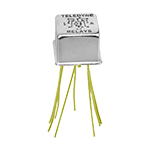 Hook terminals, 8/32 posts. 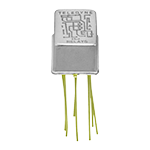 1-1/4" high. 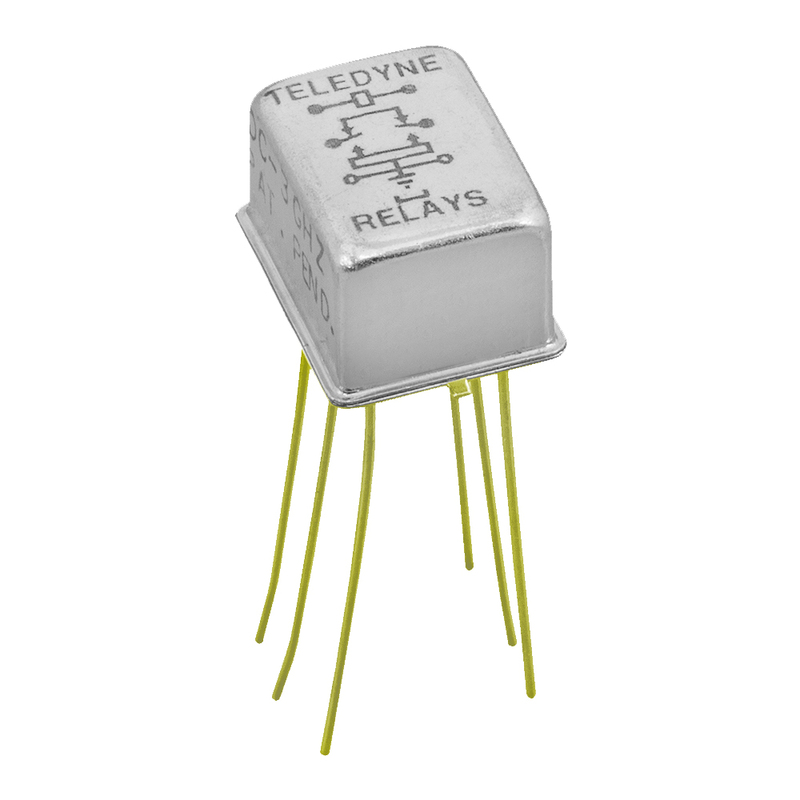 ES crystal can relay. 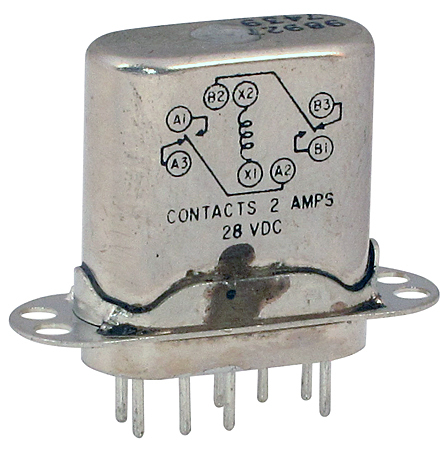 Contacts: 28 vdc, DPDT, 2 amp, 115 vac. 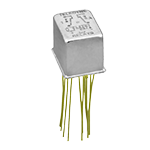 Coil: 100 ohm / 20 ma. 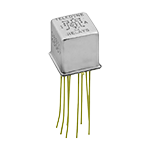 Hermetically sealed can. 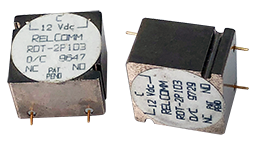 1-7/32" mounting centers. 1-7/32" x 7/8" x 3/8". 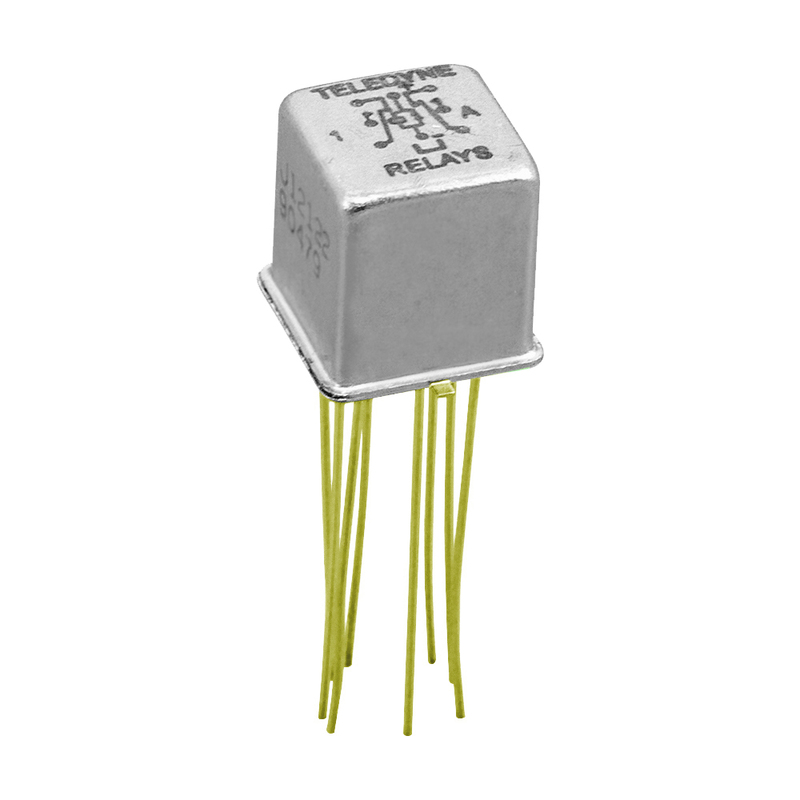 Allied DPDT, 48 vdc coil crystal can relay. 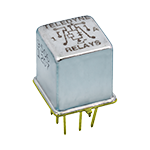 Hi-G Inc. crystal can relay. SPDT, Cont 2A. PC mount. 5,000 ohm coil trips @ 4.5 madc. 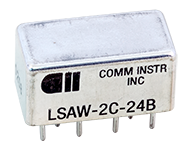 1-1/4" x 25/32" x 3/8". 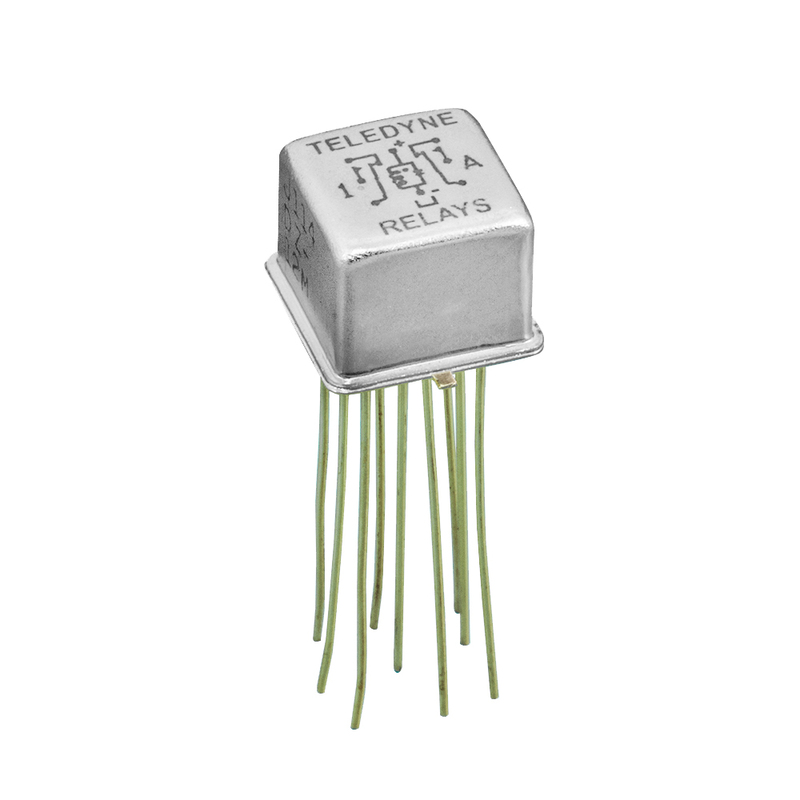 Teledyne Series 114 Centrigrid® 2 Form C (DPDT) Relay, Continuous Duty DC - 1 GHz, 28 vdc @ 1 A, 115 VAC @ 250 mA (10-50 mV @ 10-50 µA) contacts, 5 vdc 50 ohm Coil with diode, Through-Hole 8 pin (three rows of 3) 0.1" spacing, 0.75" (19.05 mm) long leads Hermetically Sealed, 0.375 L x 0.375 W x 0.275 H (9.53 x 9.53 x 6.99 mm), -65°C to +125°C, Established Reliability level A: 1.5% allowable failures in 10,000 unit cycles. Alt. P/N: ER114D-5, ER114D5. 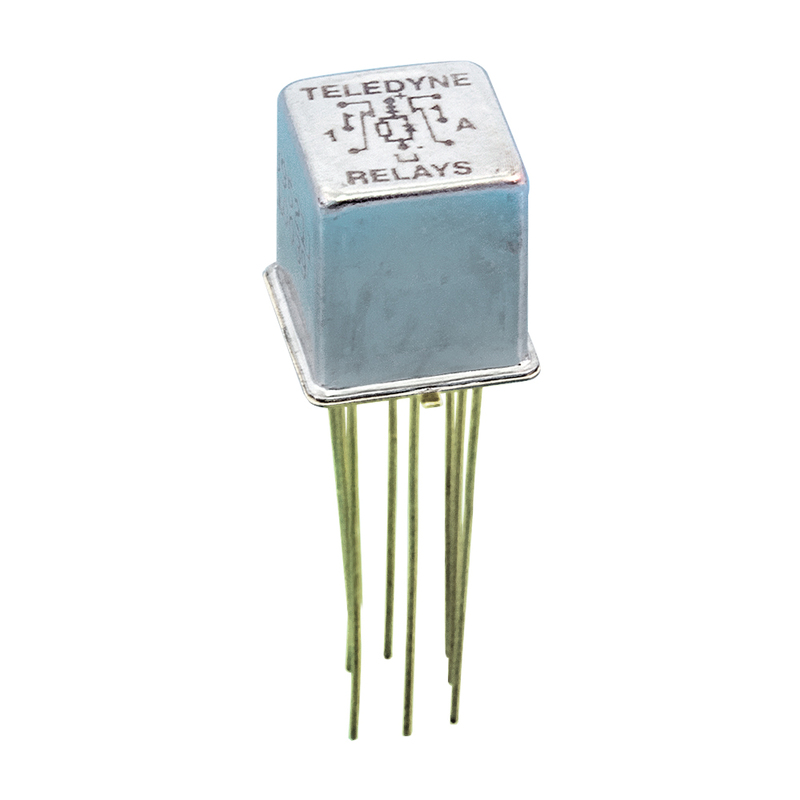 Teledyne Series 114 Centrigrid® 2 Form C (DPDT) Relay, Continuous Duty DC - 1 GHz, 28 vdc @ 1 A, 115 VAC @ 250 mA (10-50 mV @ 10-50 µA) contacts, 5 vdc 50 ohm Coil with diode, Through-Hole 8 pin (three rows of 3) 0.1" spacing, 0.187" (1.75 mm) long pins Hermetically Sealed, 0.375 L x 0.375 W x 0.275 H (9.53 x 9.53 x 6.99 mm), -65°C to +125°C, Established Reliability level A: 1.5% allowable failures in 10,000 unit cycles. Alt. P/N: ER114D-5. 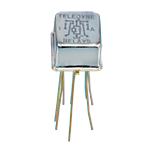 Teledyne Series 114 Centrigrid® 2 Form C (DPDT) Relay, Continuous Duty DC - 1 GHz, 28 vdc @ 1 A, 115 VAC @ 250 mA (10-50 mV @ 10-50 µA) contacts, 5 vdc 50 ohm Coil with diode, Through-Hole 8 pin (three rows of 3) 0.1" spacing, 0.75" (19.05 mm) long leads Hermetically Sealed, 0.375 L x 0.375 W x 0.275 H (9.53 x 9.53 x 6.99 mm), -65°C to +125°C, Established Reliability level A: 1.5% allowable failures in 10,000 unit cycles. 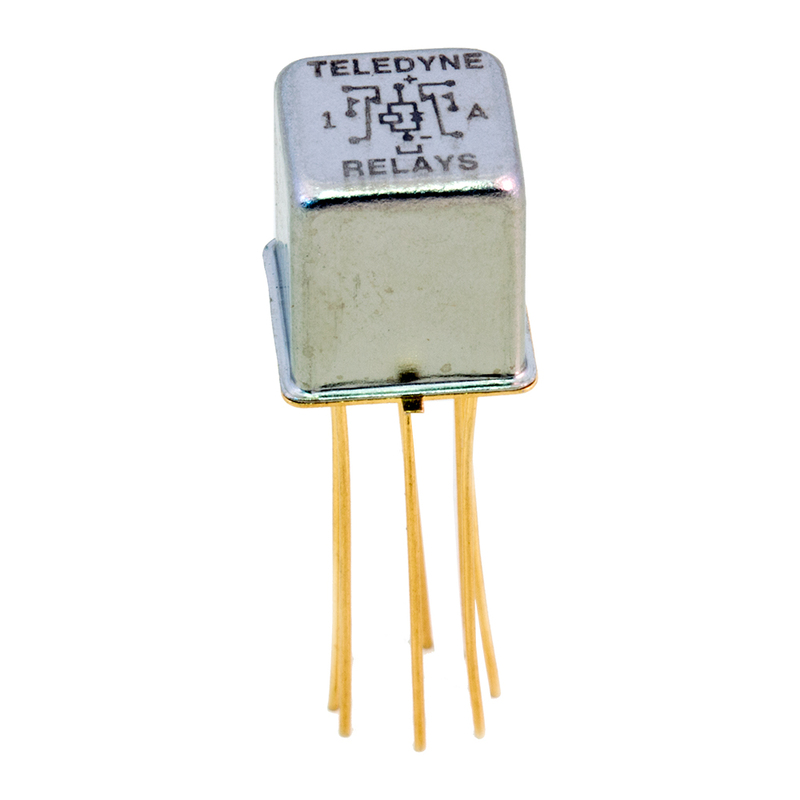 Teledyne Series 114 Centrigrid® 2 Form C (DPDT) Relay, Continuous Duty DC - 1 GHz, 28 vdc @ 1 A, 115 VAC @ 100 mA (10-50 mV @ 10-50 µA) contacts, 26.5 vdc 1.56K ohm Coil, Through-Hole 9 pin (three rows of 3) 0.1" spacing includes case ground lead, 0.75" (19.05 mm) long leads Hermetically Sealed, Grounded Case, 0.375 L x 0.375 W x 0.275 H (9.53 x 9.53 x 6.99 mm), -65°C to +125°C, Established Reliability level A: 1.5% allowable failures in 10,000 unit cycles. Alt. P/N: ER114Z26A. 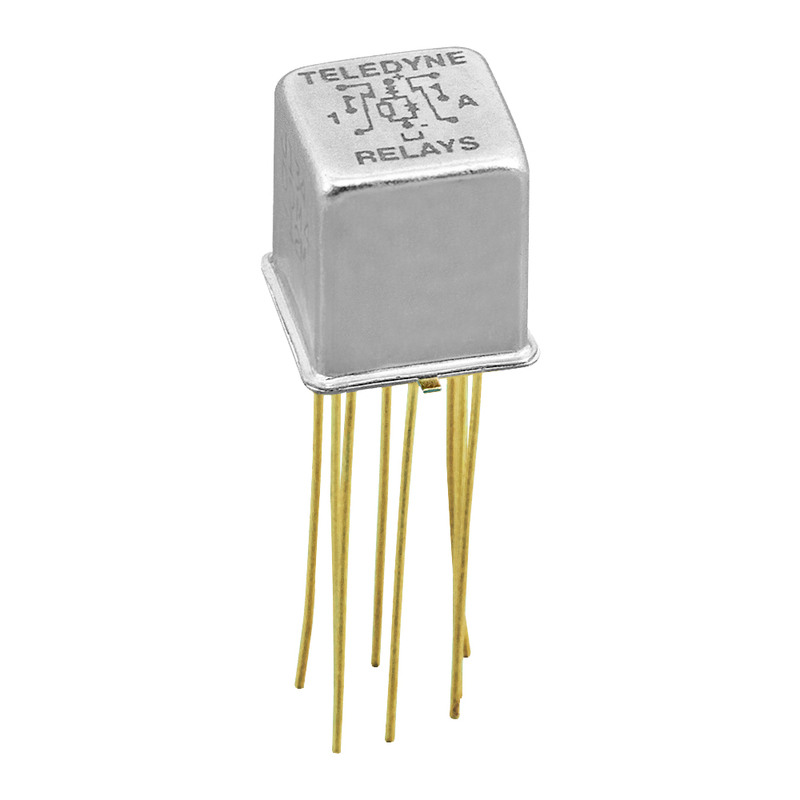 Teledyne Series 114 Centrigrid® 2 Form C (DPDT) Relay, Continuous Duty DC - 1 GHz, 28 vdc @ 1 A, 115 VAC @ 250 mA (10-50 mV @ 10-50 µA) contacts, 26.5 vdc 1.56K ohm Coil with diode, Through-Hole 8 pin (three rows of 3) 0.1" spacing, 0.187" (1.75 mm) long pins Hermetically Sealed, 0.375 L x 0.375 W x 0.275 H (9.53 x 9.53 x 6.99 mm), -65°C to +125°C, Established Reliability level A: 1.5% allowable failures in 10,000 unit cycles. Alt. 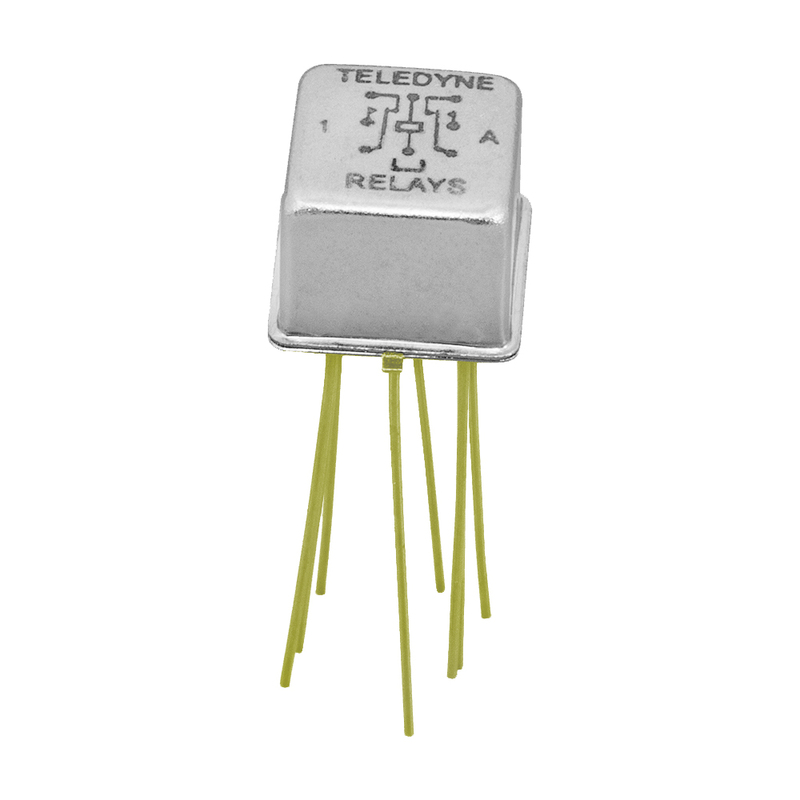 P/Ns: ER114D-26, ER114D26A. 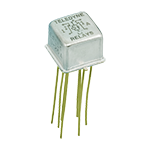 Teledyne Series 114 Centrigrid® 2 Form C (DPDT) Relay, Continuous Duty DC - 1 GHz, 28 vdc @ 1 A, 115 VAC @ 100 mA (10-50 mV @ 10-50 µA) contacts, 12 vdc 220 ohm Coil, Through-Hole 9 pin (three rows of 3) 0.1" spacing includes case ground lead, 0.75" (19.05 mm) long leads Hermetically Sealed, Grounded Case, Includes PCB Spacer Pad, 0.375 L x 0.375 W x 0.3 H (9.53 x 9.53 x 7.62 mm), -65°C to +125°C, Established Reliability level A: 1.5% allowable failures in 10,000 unit cycles. Alt. 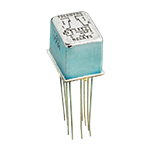 P/Ns: ER114ZM412A, ER114Z-12A, ER114Z12A. 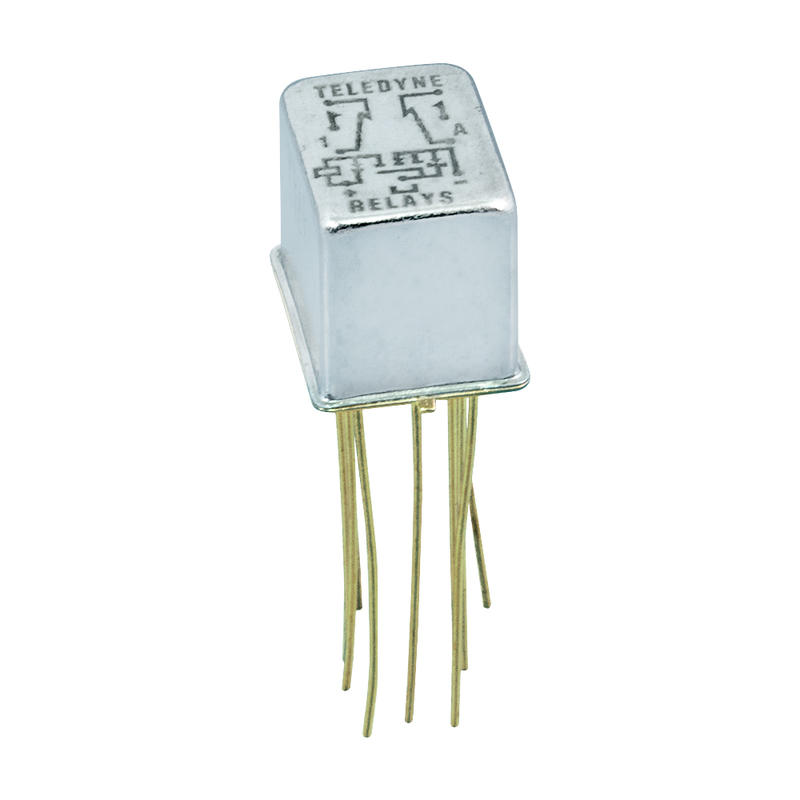 Teledyne Series 114 Centrigrid® 2 Form C (DPDT) Relay, Continuous Duty DC - 1 GHz, 28 vdc @ 1 A, 115 VAC @ 100 mA (10-50 mV @ 10-50 µA) contacts, 12 vdc 220 ohm Coil with diode, Through-Hole 9 pin (three rows of 3) 0.1" spacing includes case ground lead, 0.75" (19.05 mm) long leads Hermetically Sealed, Grounded Case, 0.375 L x 0.375 W x 0.275 H (9.53 x 9.53 x 6.99 mm), -65°C to +125°C, Established Reliability level B: 0.75% allowable failures in 10,000 unit cycles. Alt. 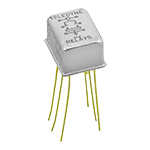 P/Ns: ER114DZ12B, ER114DZ-12A, ER114DZ12A. 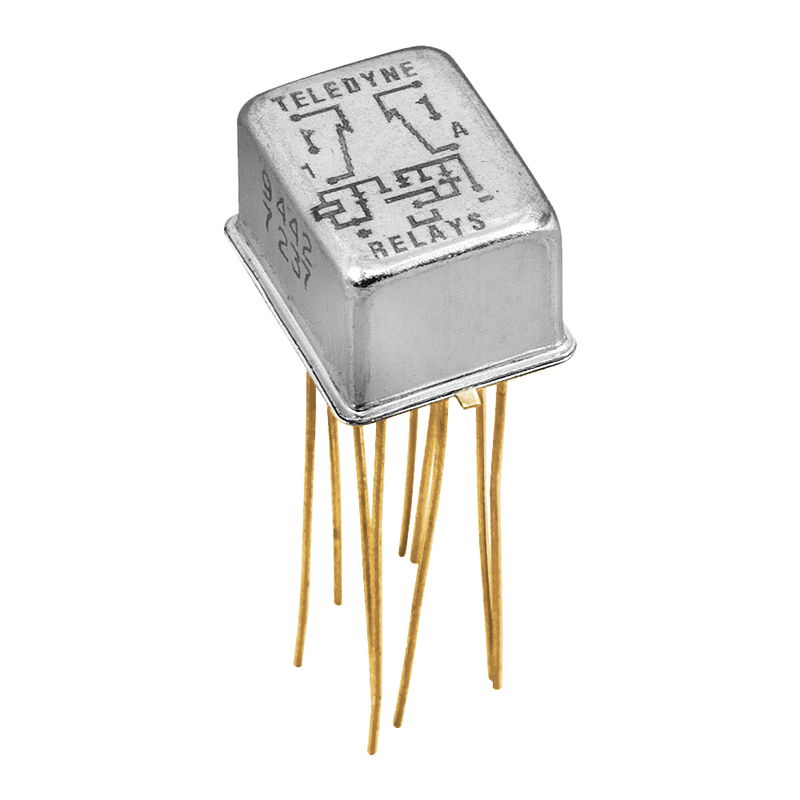 Teledyne Series 114 Centrigrid® 2 Form C (DPDT) Relay, Continuous Duty DC - 1 GHz, 28 vdc @ 1 A, 115 VAC @ 250 mA (10-50 mV @ 10-50 µA) contacts, 5 vdc 50 ohm Coil, Through-Hole 8 pin (three rows of 3) 0.1" spacing, 0.75" (19.05 mm) long leads Hermetically Sealed, Includes PCB Spacer Pad, 0.375 L x 0.375 W x 0.3 H (9.53 x 9.53 x 7.62 mm), -65°C to +125°C, Joint Army Navy Established Reliability level L: 3% allowable failures in 10,000 unit cycles. Alt. 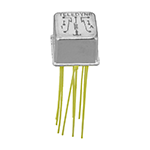 P/Ns: M39016/17-037L, J114M45L, J114-5L, J1145L. 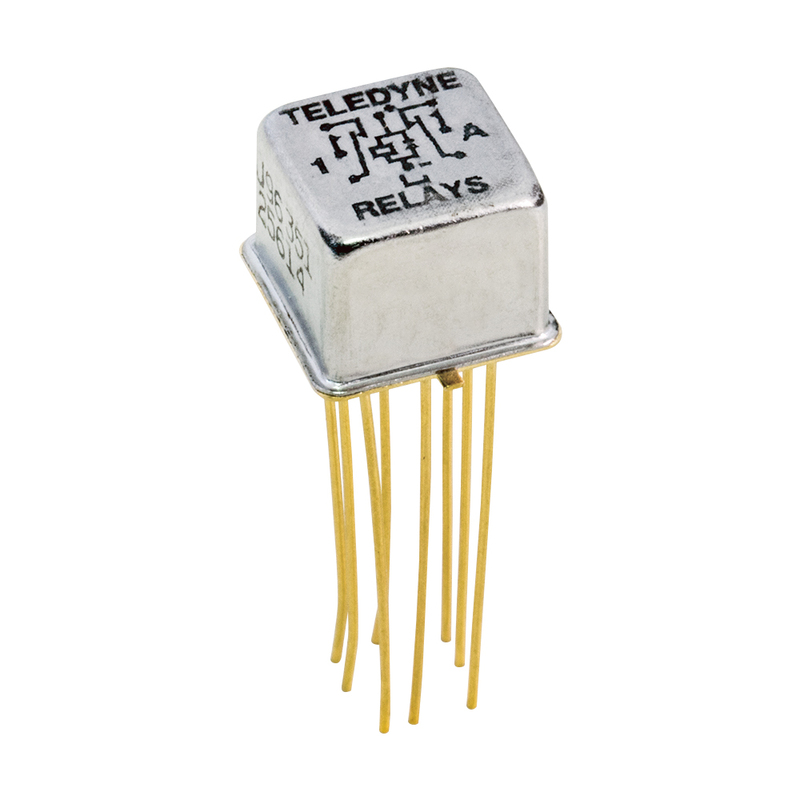 Teledyne Series 114 Centrigrid® 2 Form C (DPDT) Relay, Continuous Duty DC - 1 GHz, 28 vdc @ 1 A, 115 VAC @ 250 mA (10-50 mV @ 10-50 µA) contacts, 12 vdc 220 ohm Coil with diode, Through-Hole 8 pin (three rows of 3) 0.1" spacing, 0.75" (19.05 mm) long leads Hermetically Sealed, 0.375 L x 0.375 W x 0.275 H (9.53 x 9.53 x 6.99 mm), -65°C to +125°C, Established Reliability level B: 0.75% allowable failures in 10,000 unit cycles. 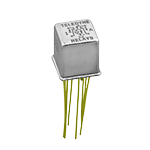 Alt. 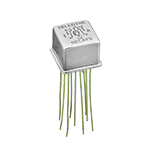 P/Ns: 114D-12, 114D12. 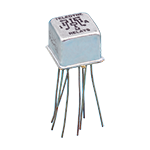 Teledyne Series 114 Centrigrid® 2 Form C (DPDT) Relay, Continuous Duty DC - 1 GHz, 28 vdc @ 1 A, 115 VAC @ 250 mA (10-50 mV @ 10-50 µA) contacts, 26.5 vdc 1.56K ohm Coil with diode, Through-Hole 8 pin (three rows of 3) 0.1" spacing, 0.187" (1.75 mm) long pins Hermetically Sealed, 0.375 L x 0.375 W x 0.275 H (9.53 x 9.53 x 6.99 mm), -65°C to +125°C, Joint Army Navy Established Reliability level P: 0.1% allowable failures in 10,000 unit cycles. 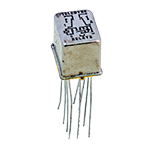 Alt. P/N: M39016/18-030L, J114D26PL. 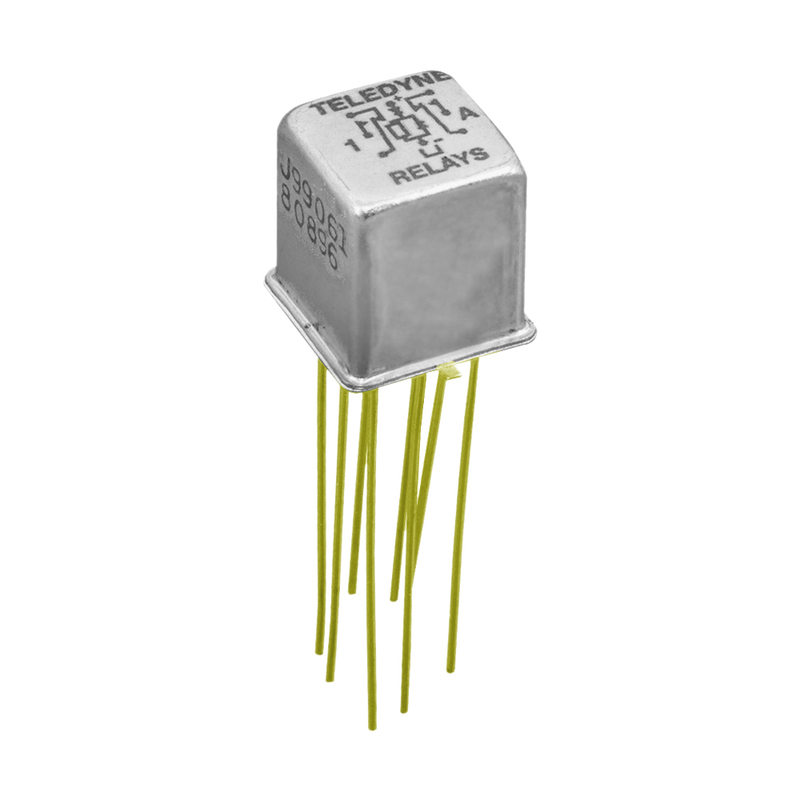 Teledyne Series 114 Centrigrid® 2 Form C (DPDT) Relay, Continuous Duty DC - 1 GHz, 28 vdc @ 1 A, 115 VAC @ 250 mA (10-50 mV @ 10-50 µA) contacts, 26.5 vdc 1.56K ohm Coil with diode, Through-Hole 8 pin (three rows of 3) 0.1" spacing, 0.75" (19.05 mm) long leads Hermetically Sealed, 0.375 L x 0.375 W x 0.275 H (9.53 x 9.53 x 6.99 mm), -65°C to +125°C, Established Reliability level A: 1.5% allowable failures in 10,000 unit cycles. Alt. 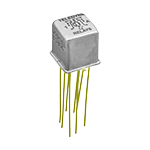 P/Ns: ER114D-26, ER114D26A. 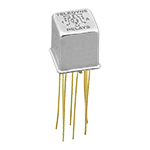 Teledyne Series 114 Centrigrid® 2 Form C (DPDT) Relay, Continuous Duty, Grounded Case DC - 1 GHz, 28 vdc @ 1 A, 115 VAC @ 100 mA (10-50 mV @ 10-50 µA) contacts, 12 vdc 220 ohm Coil with diode, Through-Hole 9 pin (three rows of 3) 0.1" spacing includes case ground lead, 0.75" (19.05 mm) long leads Hermetically Sealed, Grounded Case, 0.375 L x 0.375 W x 0.275 H (9.53 x 9.53 x 6.99 mm), -65°C to +125°C, Joint Army Navy Established Reliability level M: 1% allowable failures in 10,000 unit cycles. 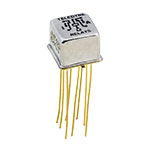 Alt. P/N: M39016/18-046M, J114DZ12M. 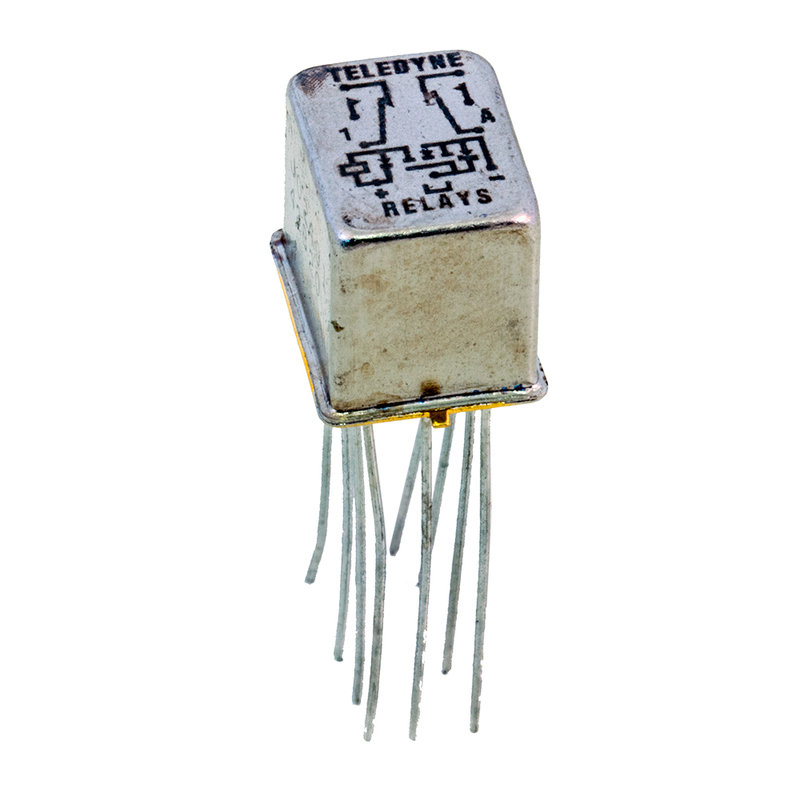 Teledyne Series 114 Centrigrid® 2 Form C (DPDT) Relay, Continuous Duty DC - 1 GHz, 28 vdc @ 1 A, 115 VAC @ 250 mA (10-50 mV @ 10-50 µA) contacts, 5 vdc 50 ohm Coil, Through-Hole 8 pin (three rows of 3) 0.1" spacing, 0.187" (1.75 mm) long pins Hermetically Sealed, 0.375 L x 0.375 W x 0.275 H (9.53 x 9.53 x 6.99 mm), -65°C to +125°C, Joint Army Navy Established Reliability level M: 1% allowable failures in 10,000 unit cycles. Alt. P/Ns: M39016/17-025M, J1145PM. 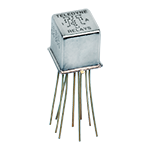 Teledyne Series 114 Centrigrid® 2 Form C (DPDT) Relay, Continuous Duty DC - 1 GHz, 28 vdc @ 1 A, 115 VAC @ 250 mA (10-50 mV @ 10-50 µA) contacts, 5 vdc 50 ohm Coil, Through-Hole 8 pin (three rows of 3) 0.1" spacing, 0.75" (19.05 mm) long leads Hermetically Sealed, 0.375 L x 0.375 W x 0.275 H (9.53 x 9.53 x 6.99 mm), -65°C to +125°C, Joint Army Navy Established Reliability level M: 1% allowable failures in 10,000 unit cycles. Alt. 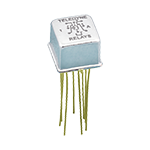 P/Ns: M39016/17-031M, J1145M. 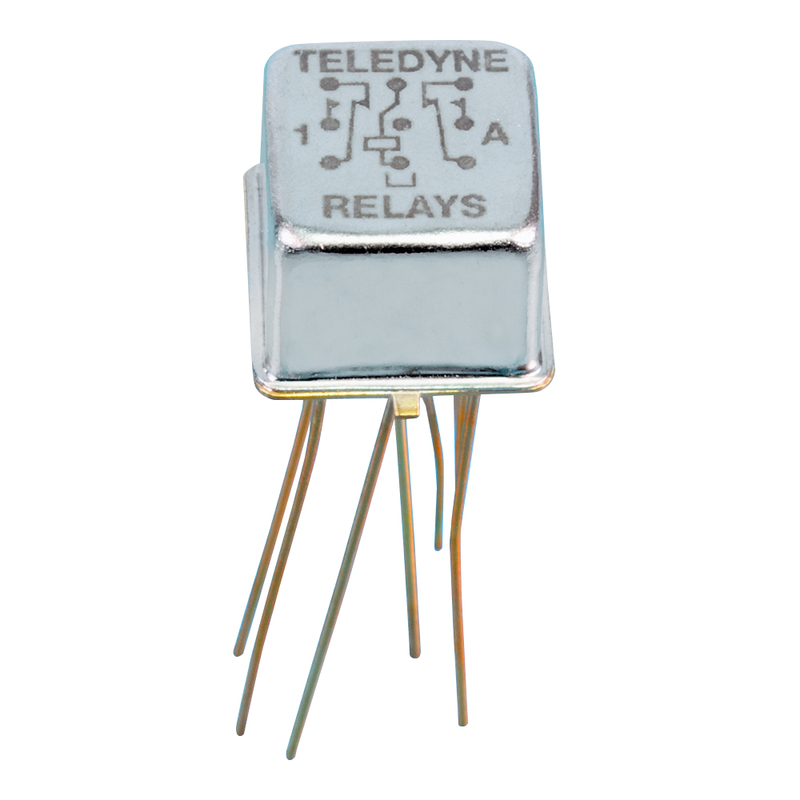 Teledyne Series 114 Centrigrid® 2 Form C (DPDT) Relay, Continuous Duty DC - 1 GHz, 28 vdc @ 1 A, 115 VAC @ 250 mA (10-50 mV @ 10-50 µA) contacts, 5 vdc 50 ohm Coil with diode, Through-Hole 8 pin (three rows of 3) 0.1" spacing, 0.75" (19.05 mm) long leads Hermetically Sealed, 0.375 L x 0.375 W x 0.275 H (9.53 x 9.53 x 6.99 mm), -65°C to +125°C, Joint Army Navy Established Reliability level M: 1% allowable failures in 10,000 unit cycles. Alt. P/Ns: M39016/18-031M, J114D5M. 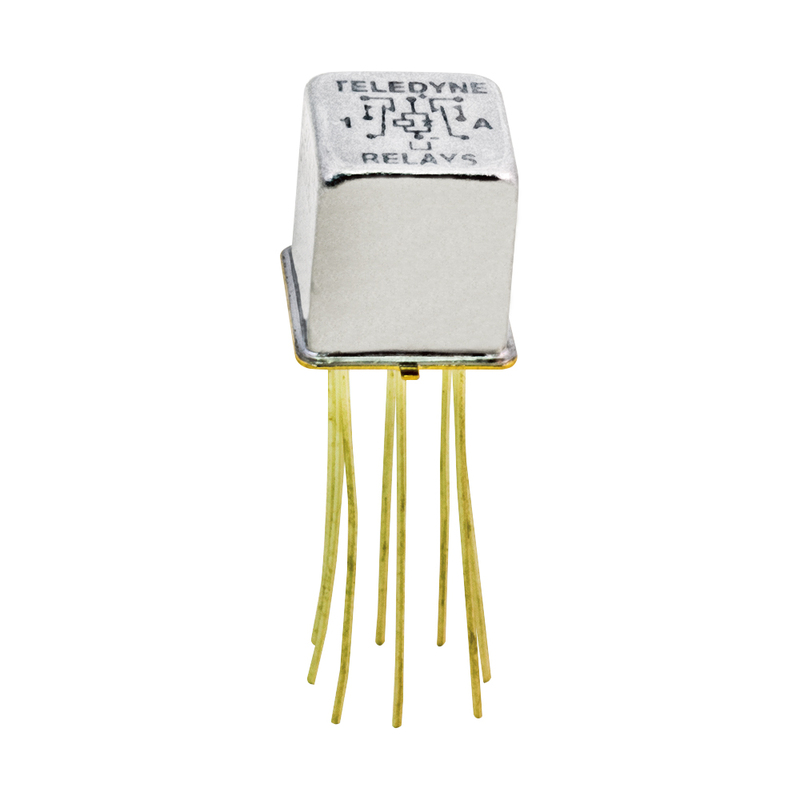 Teledyne Series 114 Centrigrid® 2 Form C (DPDT) Relay, Continuous Duty DC - 1 GHz, 28 vdc @ 1 A, 115 VAC @ 250 mA (10-50 mV @ 10-50 µA) contacts, 18 vdc 880 ohm Coil with diode, Through-Hole 8 pin (three rows of 3) 0.1" spacing, 0.75" (19.05 mm) long leads Hermetically Sealed, Includes PCB Spacer Pad, 0.375 L x 0.375 W x 0.3 H (9.53 x 9.53 x 7.62 mm), -65°C to +125°C, Joint Army Navy Established Reliability level M: 1% allowable failures in 10,000 unit cycles. Alt. 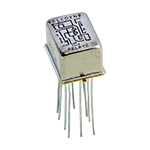 P/Ns: M39016/18-041M, J114DM418M, J114D-18M, J114D18M. 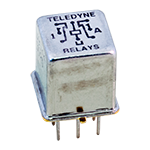 Teledyne Series 116 CMOS Compatible Centrigrid® 2 Form C (DPDT) Relay, Continuous Duty DC - 1 GHz, 28 vdc @ 1 A, 115 VAC @ 250 mA (10-50 mV @ 10-50 µA) contacts, 26.5 vdc @ 20 mA + 3.8 vdc (TTL) Coil, Through-Hole 9 pin (three rows of 4) 0.1" spacing, 0.187" (1.75 mm) long pins Hermetically Sealed, Includes PCB Spacer Pad, 0.375 L x 0.375 W x 0.3 H (9.53 x 9.53 x 7.62 mm), -65°C to +125°C, Established Reliability level A: 1.5% allowable failures in 10,000 unit cycles. Alt. P/N: ER116CM9-26, ER116CM926A. 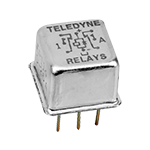 Teledyne Series 116 CMOS Compatible Centrigrid® 2 Form C (DPDT) Relay, Continuous Duty DC - 1 GHz, 28 vdc @ 1 A, 115 VAC @ 250 mA (10-50 mV @ 10-50 µA) contacts, 5 vdc @ 132 mA + 3.8 vdc (TTL) Coil, Through-Hole 9 pin (three rows of 4) 0.1" spacing, 0.75" (19.05 mm) long leads Hermetically Sealed, 0.475 L x 0.375 W x 0.275 H (12.07 x 9.53 x 6.99 mm), -65°C to +125°C, Established Reliability level A: 1.5% allowable failures in 10,000 unit cycles. Alt. 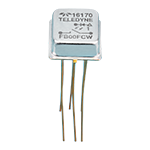 P/N: 116C-5, 116C5. 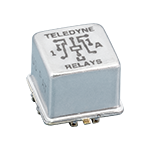 Teledyne Series 116 CMOS Compatible Centrigrid® 2 Form C (DPDT) Relay, Continuous Duty DC - 1 GHz, 28 vdc @ 1 A, 115 VAC @ 250 mA (10-50 mV @ 10-50 µA) contacts, 26.5 vdc @ 20 mA + 3.8 vdc (TTL) Coil, Through-Hole 9 pin (three rows of 4) 0.1" spacing, 0.75" (19.05 mm) long leads Hermetically Sealed, Includes PCB Spacer Pad, 0.375 L x 0.375 W x 0.3 H (9.53 x 9.53 x 7.62 mm), -65°C to +125°C, Established Reliability level A: 1.5% allowable failures in 10,000 unit cycles. Alt. P/Ns: 116CM9-26, 116C-26, 116C26. 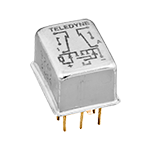 Teledyne Series 116 CMOS Compatible Centrigrid® 2 Form C (DPDT) Relay, Continuous Duty DC - 1 GHz, 28 vdc @ 1 A, 115 VAC @ 250 mA (10-50 mV @ 10-50 µA) contacts, 12 vdc @ 36 mA + 3.8 vdc (TTL) Coil, Through-Hole 9 pin (three rows of 4) 0.1" spacing, 0.75" (19.05 mm) long leads Hermetically Sealed, Includes PCB Spacer Pad, 0.375 L x 0.375 W x 0.3 H (9.53 x 9.53 x 7.62 mm), -65°C to +125°C, Joint Army Navy Established Reliability level M: 1% allowable failures in 10,000 unit cycles. Alt. 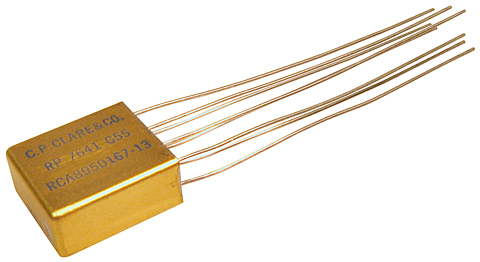 P/Ns: J116CM9-12, J116CM912M, J116CM912, J116C-12M, J116C12M. 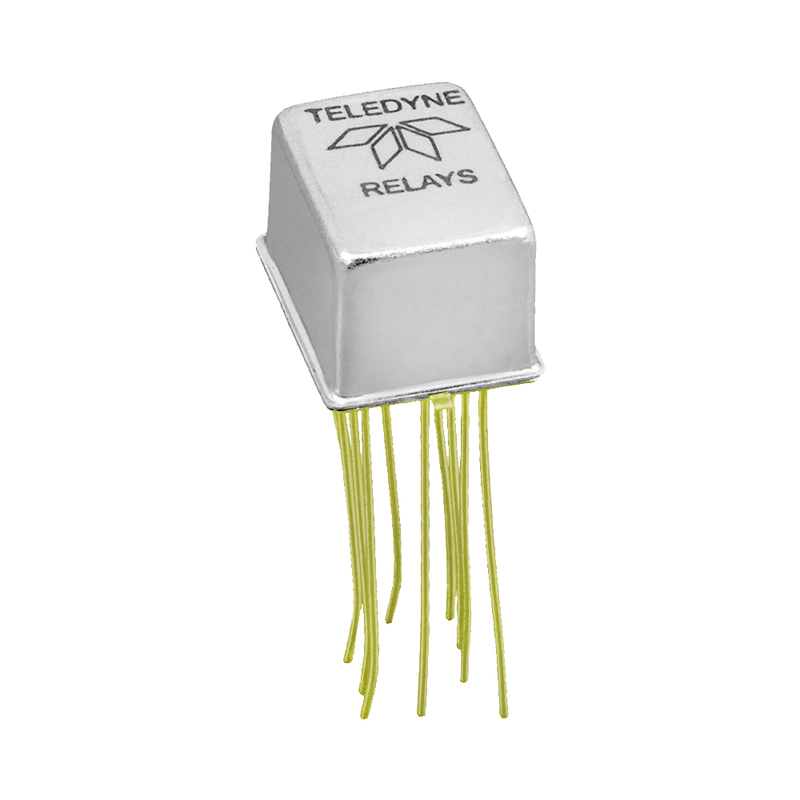 Teledyne Series FB Low Leakage, High Voltage, Bi-Directional AC or DC SPST Solid State Relay, 180 vdc @ 500 mA contacts, 3.25 @ 25 mA Actuator, Through-Hole 6 pin, 0.7" (1.77 mm) long leads Hermetically Sealed Square Case, 0.458 L x 0.418 W x 0.19 H (11.6 x 10.6 x 4.83 mm), -55°C to +105°C. 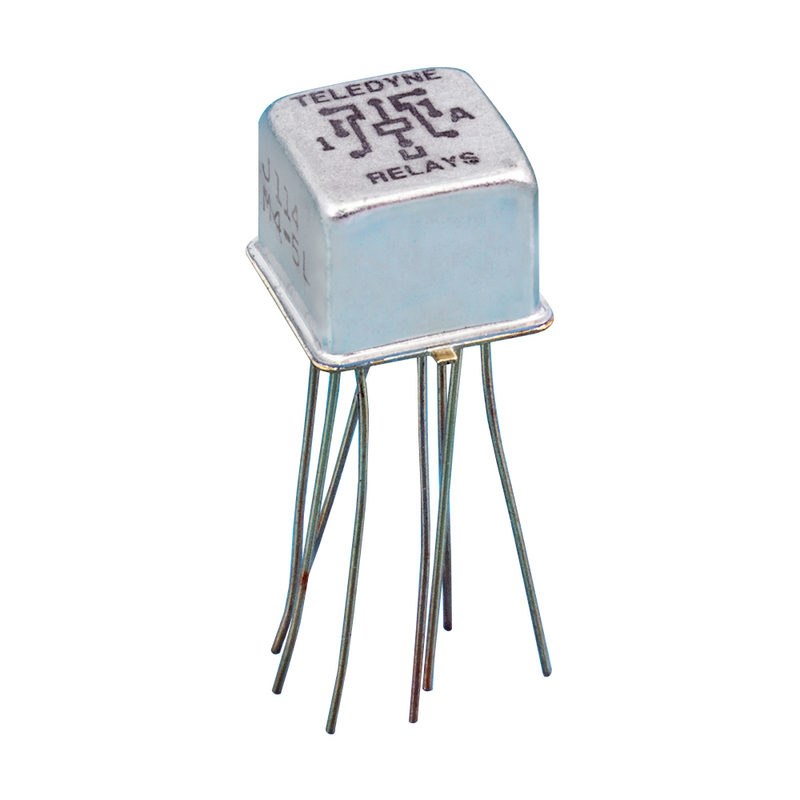 Teledyne Series FB Low Leakage, High Voltage, Bi-Directional AC or DC SPST Solid State Relay, 350 vdc @ 250 mA contacts, 3.25 @ 25 mA Actuator, Through-Hole 6 pin, 0.7" (1.77 mm) long leads Hermetically Sealed Square Case, 0.458 L x 0.418 W x 0.19 H (11.6 x 10.6 x 4.83 mm), -55°C to +105°C. 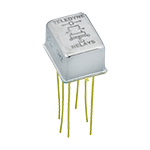 Teledyne Series 122C CMOS Compatible Centrigrid® 2 Form C (DPDT) Magnetically Latching Relay, Continuous Duty DC - 1 GHz, 28 vdc @ 1 A, 115 VAC @ 250 mA (10-50 mV @ 10-50 µA) contacts, 12 vdc @ 37 mA + 3.8 vdc (TTL) Coil, Through-Hole 9 pin (three rows of 4) 0.1" spacing, 0.75" (19.05 mm) long leads Hermetically Sealed, Includes PCB Spacer Pad, 0.475 L x 0.375 W x 0.32 H (12.07 x 9.53 x 8.13 mm), -55°C to +85°C. Alt. 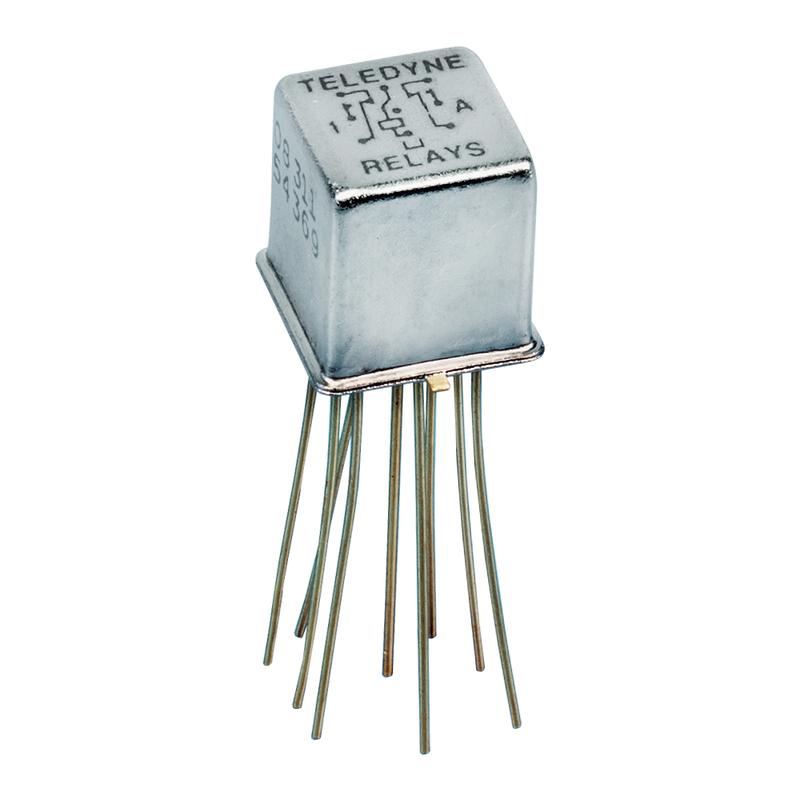 P/Ns: 122CM912, 122C-12, 122C12. 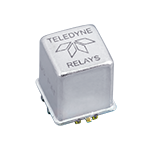 Teledyne Series 122C CMOS Compatible Centrigrid® 2 Form C (DPDT) Magnetically Latching Relay, Continuous Duty DC - 1 GHz, 28 vdc @ 1 A, 115 VAC @ 250 mA (10-50 mV @ 10-50 µA) contacts, 12 vdc @ 37 mA + 3.8 vdc (TTL) Coil, Through-Hole 9 pin (three rows of 4) 0.1" spacing, 0.75" (19.05 mm) long leads Hermetically Sealed, 0.475 L x 0.375 W x 0.295 H (12.07 x 9.53 x 7.49 mm), -55°C to +85°C. Alt. 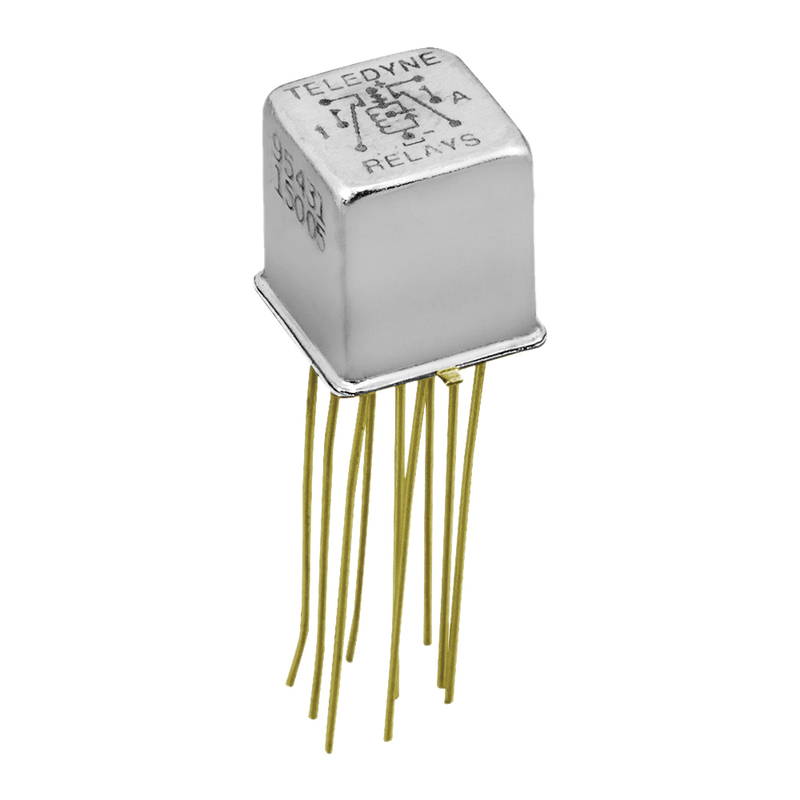 P/N: 122C12. 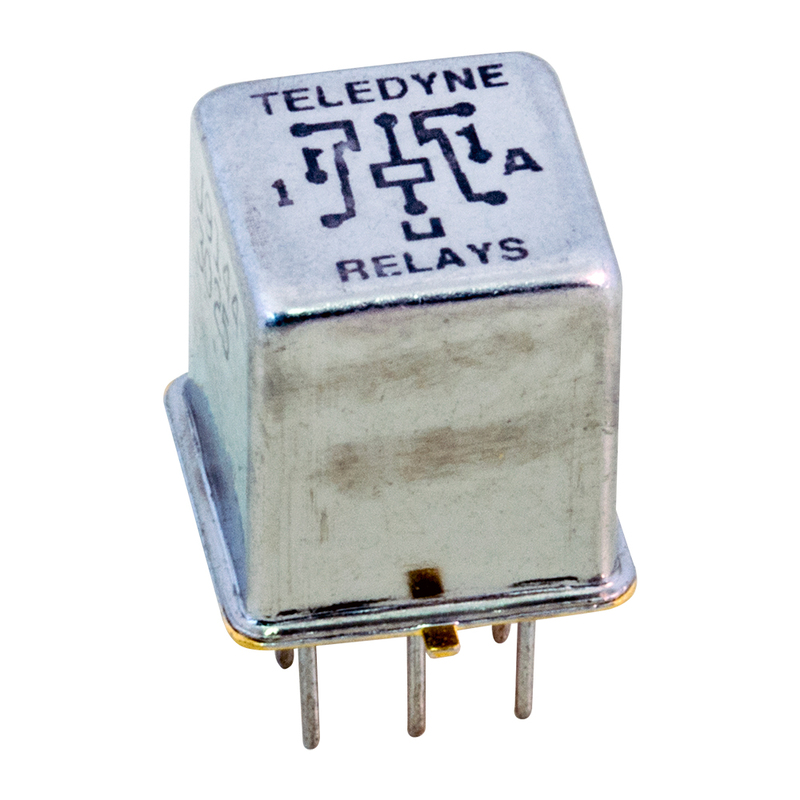 Teledyne Series 134 Sensitive Centrigrid® 2 Form C (DPDT) Relay, Continuous Duty DC - 1 GHz, 28 vdc @ 1 A, 115 VAC @ 100 mA (10-50 mV @ 10-50 µA) contacts, 12 vdc 800 ohm Coil, Through-Hole 9 pin (three rows of 4) 0.1" spacing includes case ground lead, 0.75" (19.05 mm) long leads Hermetically Sealed, Grounded Case, Includes PCB Spacer Pad, 0.375 L x 0.375 W x 0.4 H (9.53 x 9.53 x 10.16 mm), -65°C to +125°C, Established Reliability level A: 1.5% allowable failures in 10,000 unit cycles. 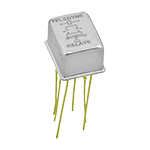 Alt. 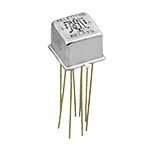 P/Ns: ER134ZM412A, ER134Z-12A, ER134Z12A. 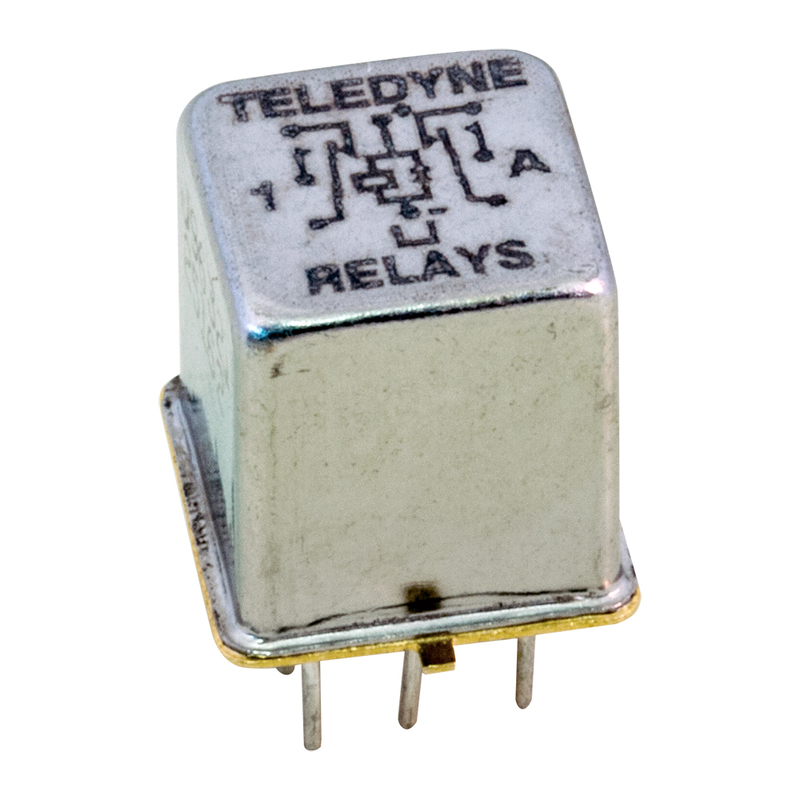 Teledyne Series 134 Sensitive Centrigrid® 2 Form C (DPDT) Relay, Continuous Duty DC - 1 GHz, 28 vdc @ 1 A, 115 VAC @ 250 mA (10-50 mV @ 10-50 µA) contacts, 12 vdc 800 ohm Coil with double diode, Through-Hole 8 pin (three rows of 3) 0.1" spacing, 0.75" (19.05 mm) long leads Hermetically Sealed, Includes PCB Spacer Pad, 0.375 L x 0.375 W x 0.4 H (9.53 x 9.53 x 10.16 mm), -65°C to +125°C, Joint Army Navy Established Reliability level M: 1% allowable failures in 10,000 unit cycles. 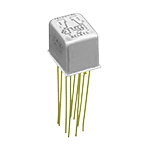 Alt. 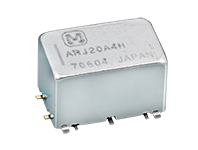 P/Ns: M39016/43-052M, J134DDM412M, J134DD-12M, J134DD12M. 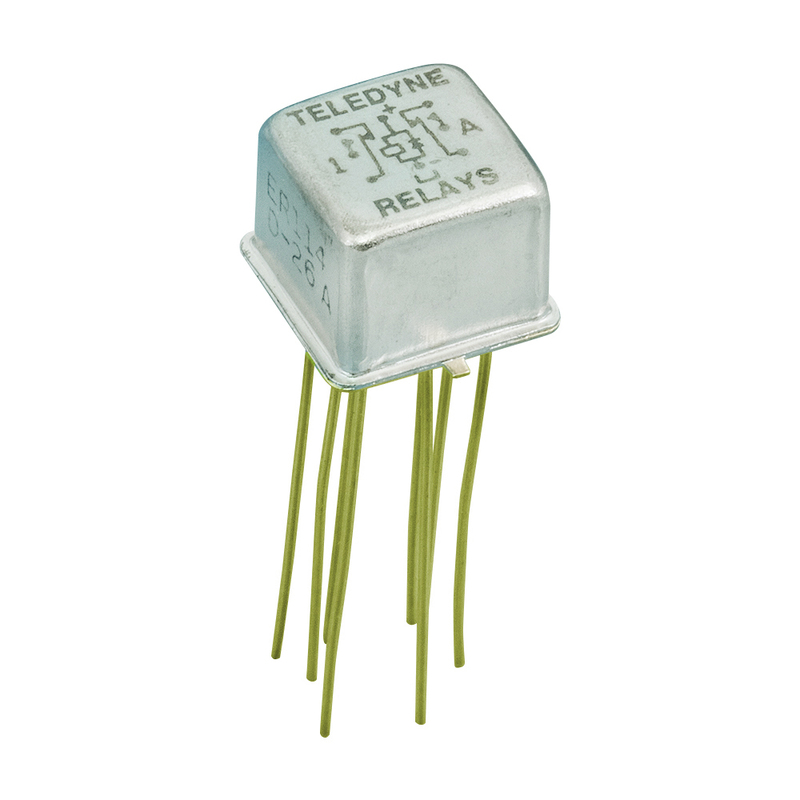 Teledyne Series 134 Sensitive Centrigrid® 2 Form C (DPDT) Relay, Continuous Duty DC - 1 GHz, 28 vdc @ 1 A, 115 VAC @ 250 mA (10-50 mV @ 10-50 µA) contacts, 12 vdc 800 ohm Coil with diode, Through-Hole 8 pin (three rows of 3) 0.1" spacing, 0.75" (19.05 mm) long leads Hermetically Sealed, Includes PCB Spacer Pad, 0.375 L x 0.375 W x 0.4 H (9.53 x 9.53 x 10.16 mm), -65°C to +125°C, Established Reliability level A: 1.5% allowable failures in 10,000 unit cycles. Alt. 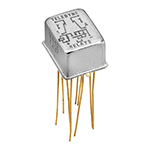 P/Ns: ER134DM412A, ER134D-12A, ER134D12A. 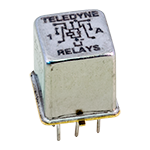 Teledyne Series 134 Sensitive Centrigrid® 2 Form C (DPDT) Relay, Continuous Duty DC - 1 GHz, 28 vdc @ 1 A, 115 VAC @ 250 mA (10-50 mV @ 10-50 µA) contacts, 12 vdc 800 ohm Coil, Through-Hole 8 pin (three rows of 3) 0.1" spacing, 0.75" (19.05 mm) long leads Hermetically Sealed, Includes PCB Spacer Pad, 0.375 L x 0.375 W x 0.4 H (9.53 x 9.53 x 10.16 mm), -65°C to +125°C, Established Reliability level A: 1.5% allowable failures in 10,000 unit cycles. Alt. 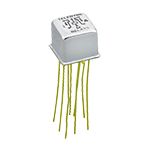 P/Ns: ER134M412A, ER134-12A, ER13412A. 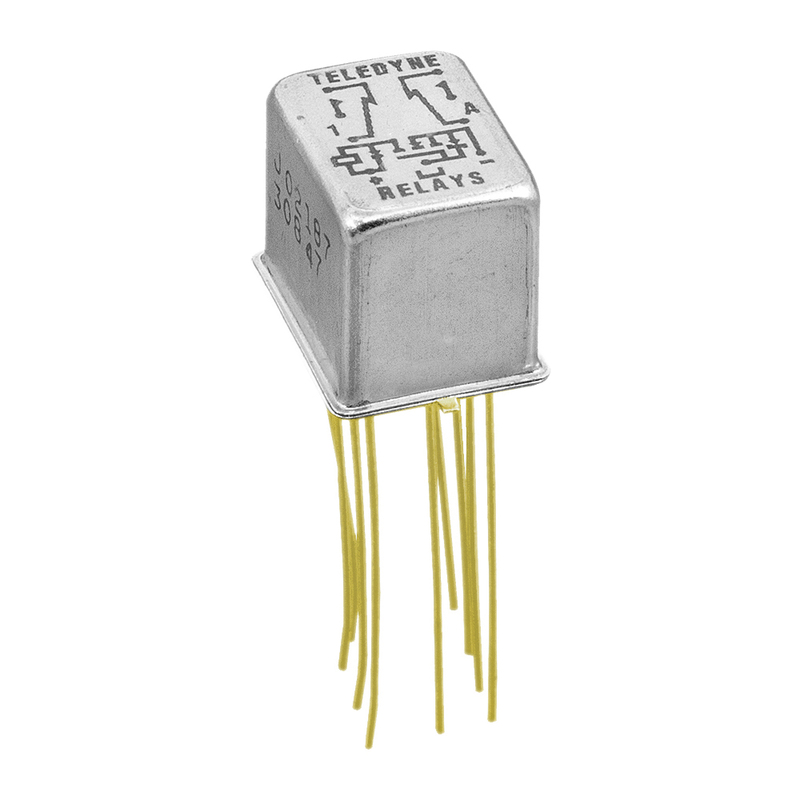 Teledyne Series 134 Sensitive Centrigrid® 2 Form C (DPDT) Relay, Continuous Duty DC - 1 GHz, 28 vdc @ 1 A, 115 VAC @ 250 mA (10-50 mV @ 10-50 µA) contacts, 26.5 vdc 3.2K ohm Coil with double diode, Through-Hole 8 pin (three rows of 3) 0.1" spacing, 0.75" (19.05 mm) long leads Hermetically Sealed, Includes PCB Spacer Pad, 0.375 L x 0.375 W x 0.4 H (9.53 x 9.53 x 10.16 mm), -65°C to +125°C, Joint Army Navy Established Reliability level M: 1% allowable failures in 10,000 unit cycles. Alt. P/N: M39016/43-054M, J134DDM426M, J134DD-26M, J134DD26M. 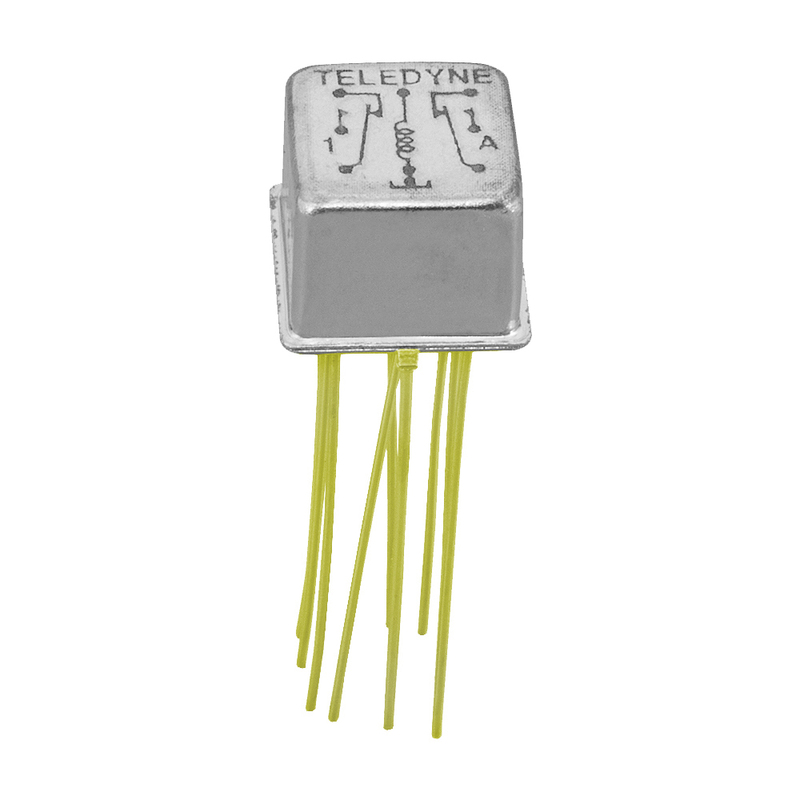 Teledyne Series 134 Sensitive Centrigrid® 2 Form C (DPDT) Relay, Continuous Duty DC - 1 GHz, 28 vdc @ 1 A, 115 VAC @ 250 mA (10-50 mV @ 10-50 µA) contacts, 5 vdc 100 ohm Coil with diode, Through-Hole 8 pin (three rows of 3) 0.1" spacing, 0.75" (19.05 mm) long leads Hermetically Sealed, Includes PCB Spacer Pad, 0.375 L x 0.375 W x 0.4 H (9.53 x 9.53 x 10.16 mm), -65°C to +125°C, Joint Army Navy Established Reliability level M: 1% allowable failures in 10,000 unit cycles. Alt. P/N: M39016/42-049M, J134DM45M, J134D-5M, J134D5M. 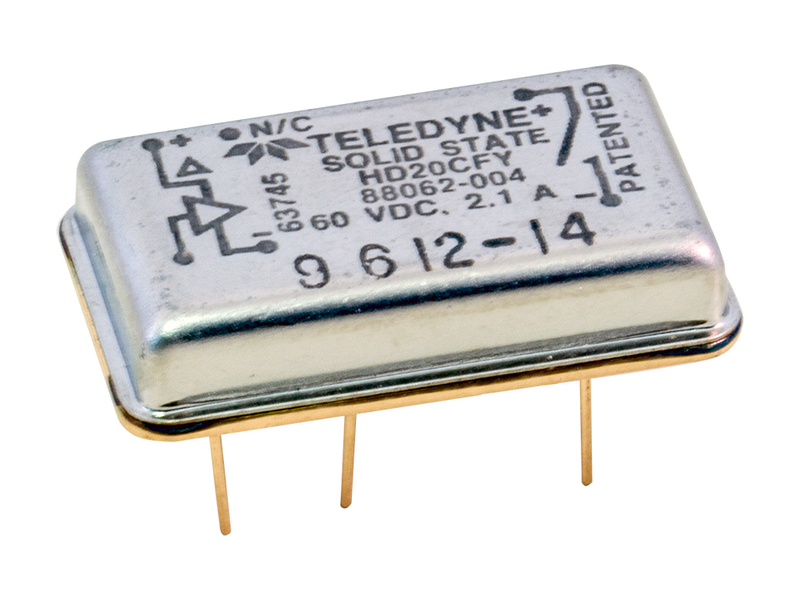 Teledyne Series 134 Sensitive Centrigrid® 2 Form C (DPDT) Relay, Continuous Duty DC - 1 GHz, 28 vdc @ 1 A, 115 VAC @ 250 mA (10-50 mV @ 10-50 µA) contacts, 5 vdc 100 ohm Coil, Through-Hole 8 pin (three rows of 3) 0.1" spacing, 0.75" (19.05 mm) long leads Hermetically Sealed, 0.375 L x 0.375 W x 0.375 H (9.53 x 9.53 x 9.53 mm), -65°C to +125°C. Alt. P/N: 1345. 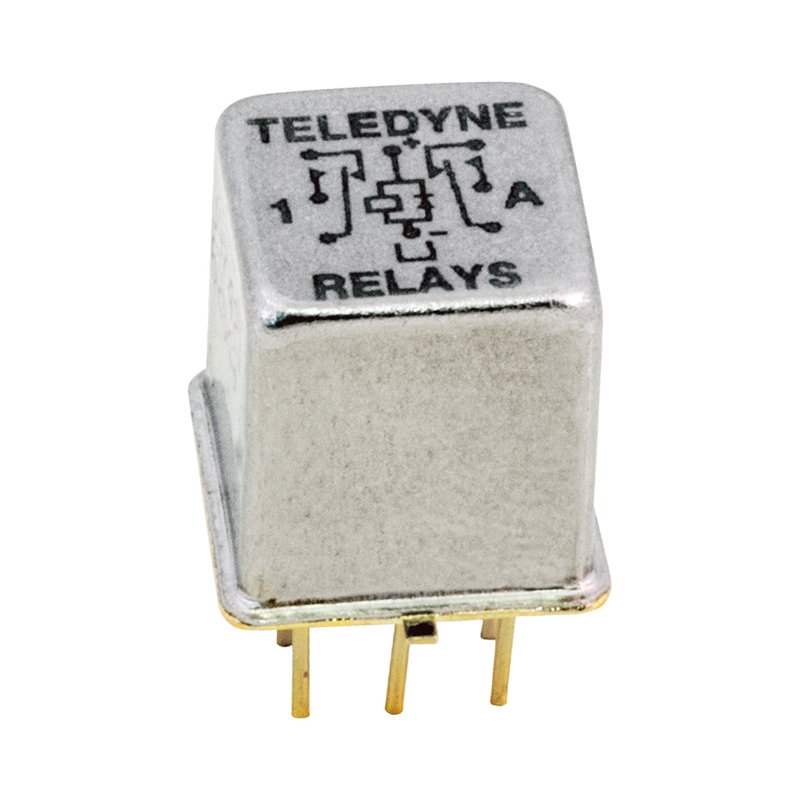 Teledyne Series 134 Sensitive Centrigrid® 2 Form C (DPDT) Relay, Continuous Duty DC - 1 GHz, 28 vdc @ 1 A, 115 VAC @ 250 mA (10-50 mV @ 10-50 µA) contacts, 26.5 vdc 3.2K ohm Coil with diode, Through-Hole 8 pin (three rows of 3) 0.1" spacing, 0.187" (1.75 mm) long pins Hermetically Sealed, Includes PCB Spacer Pad, 0.375 L x 0.375 W x 0.4 H (9.53 x 9.53 x 10.16 mm), -65°C to +125°C, Established Reliability level B: 0.75% allowable failures in 10,000 unit cycles. Alt. 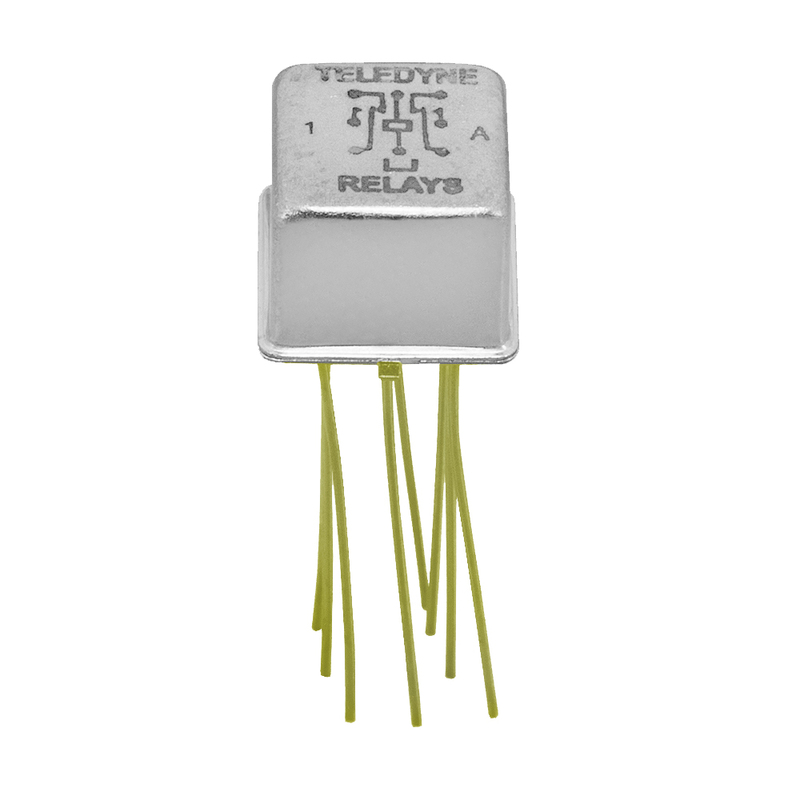 P/Ns: ER134DM426B, ER134D-26B, ER134D26B, ER134DM4-26A, ER134DM426A, ER134D-26A, ER134D26A. 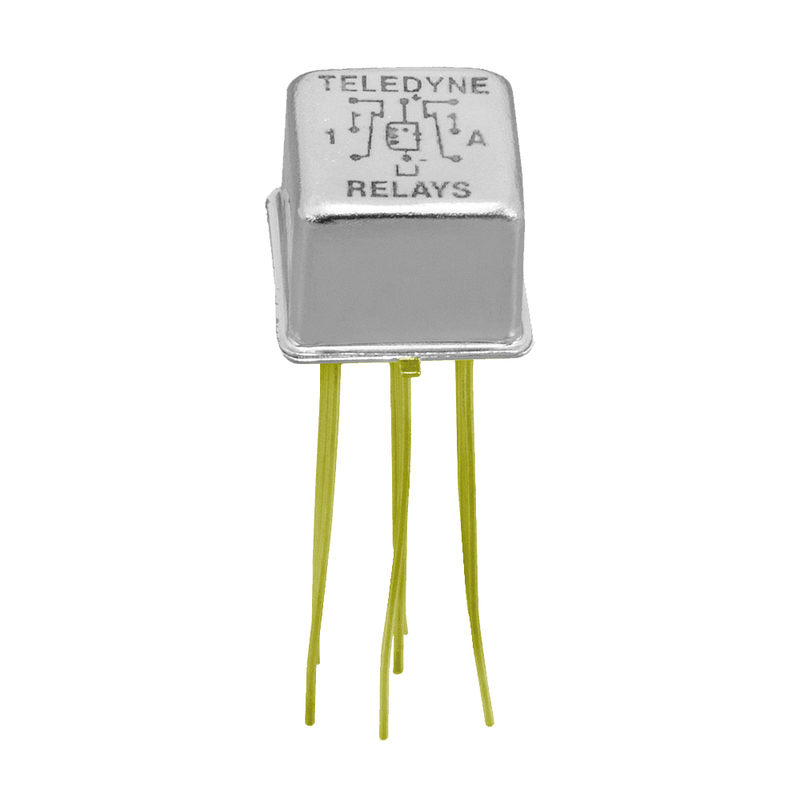 Teledyne Series 134 Sensitive Centrigrid® 2 Form C (DPDT) Relay, Continuous Duty DC - 1 GHz, 28 vdc @ 1 A, 115 VAC @ 250 mA (10-50 mV @ 10-50 µA) contacts, 5 vdc 64 ohm Coil with double diode, Through-Hole 8 pin (three rows of 3) 0.1" spacing, 0.75" (19.05 mm) long leads Hermetically Sealed, Includes PCB Spacer Pad, 0.375 L x 0.375 W x 0.4 H (9.53 x 9.53 x 10.16 mm), -65°C to +125°C, Joint Army Navy Established Reliability level M: 1% allowable failures in 10,000 unit cycles. Alt. 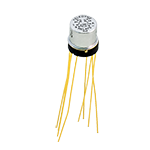 P/Ns: M39016/43-049M, J134DDM45M, J134DD-5M, J134DD5M. 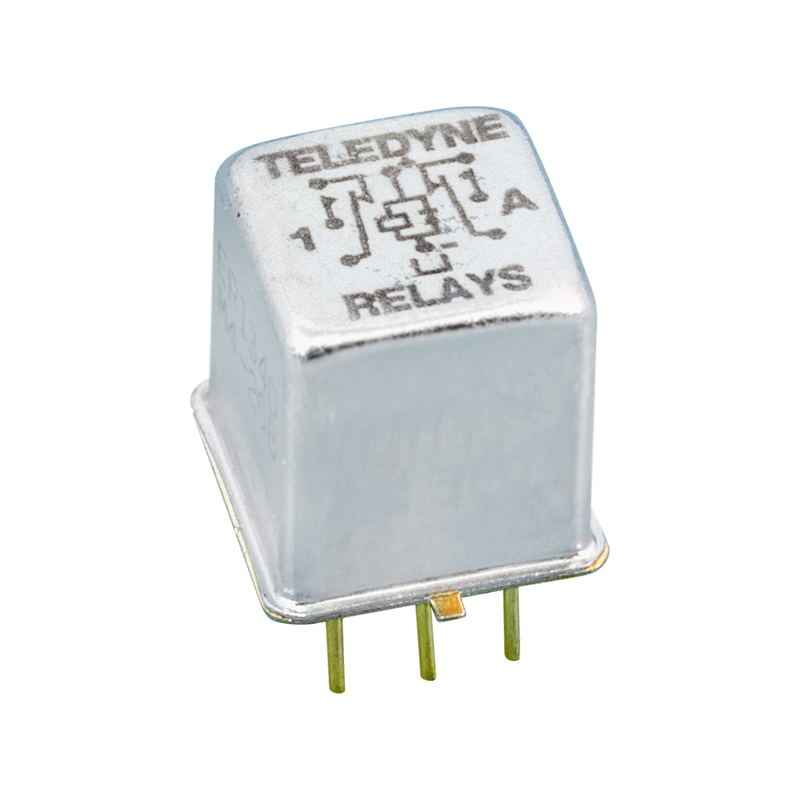 Teledyne Series 134 Sensitive Centrigrid® 2 Form C (DPDT) Relay, Continuous Duty DC - 1 GHz, 28 vdc @ 1 A, 115 VAC @ 250 mA (10-50 mV @ 10-50 µA) contacts, 18 vdc 1.6K ohm Coil with double diode, Through-Hole 8 pin (three rows of 3) 0.1" spacing, 0.75" (19.05 mm) long leads Hermetically Sealed, Includes PCB Spacer Pad, 0.375 L x 0.375 W x 0.4 H (9.53 x 9.53 x 10.16 mm), -65°C to +125°C, Established Reliability level B: 0.75% allowable failures in 10,000 unit cycles. Alt. 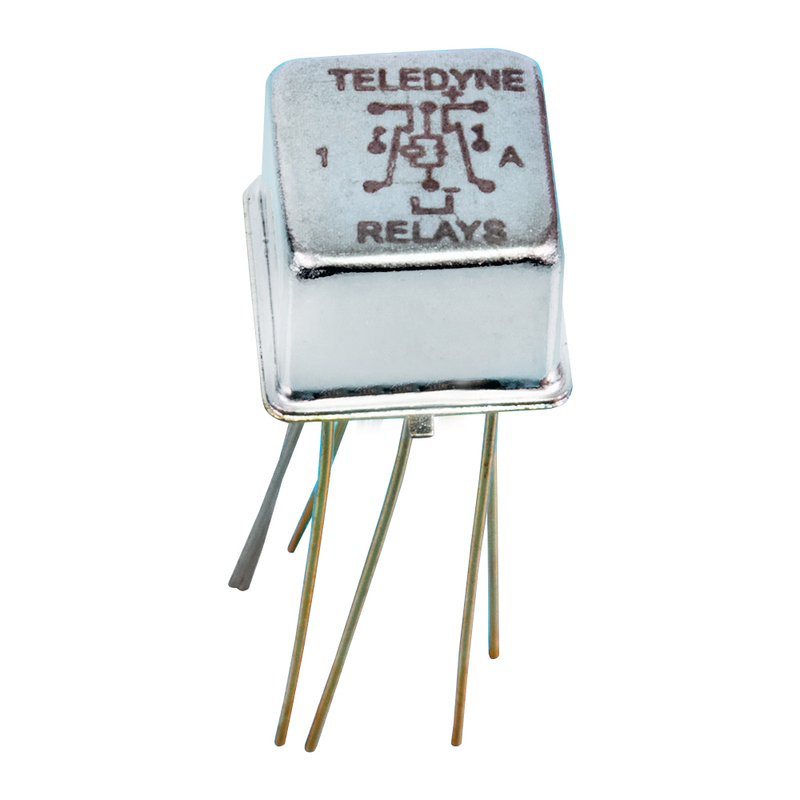 P/N: ER134DDM418B, ER134DD-18B, ER134DD18B, ER134DDM4-18A, ER134DDM418A, ER134DD-18A, ER134DD18A. 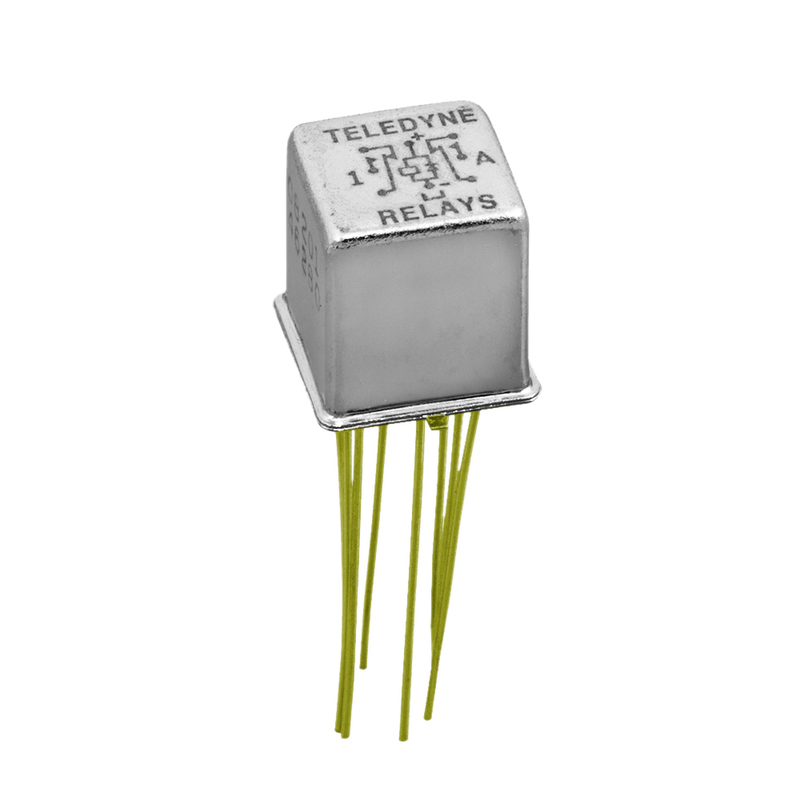 Teledyne Series 134 Sensitive Centrigrid® 2 Form C (DPDT) Relay, Continuous Duty DC - 1 GHz, 28 vdc @ 1 A, 115 VAC @ 250 mA (10-50 mV @ 10-50 µA) contacts, 6 vdc 200 ohm Coil with diode, Through-Hole 8 pin (three rows of 3) 0.1" spacing, 0.187" (1.75 mm) long pins Hermetically Sealed, Includes PCB Spacer Pad, 0.375 L x 0.375 W x 0.4 H (9.53 x 9.53 x 10.16 mm), -65°C to +125°C, Established Reliability level B: 0.75% allowable failures in 10,000 unit cycles. Alt. 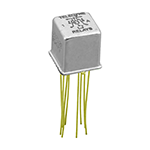 P/Ns: ER134DM46B, ER134D-6B, ER134D6B. 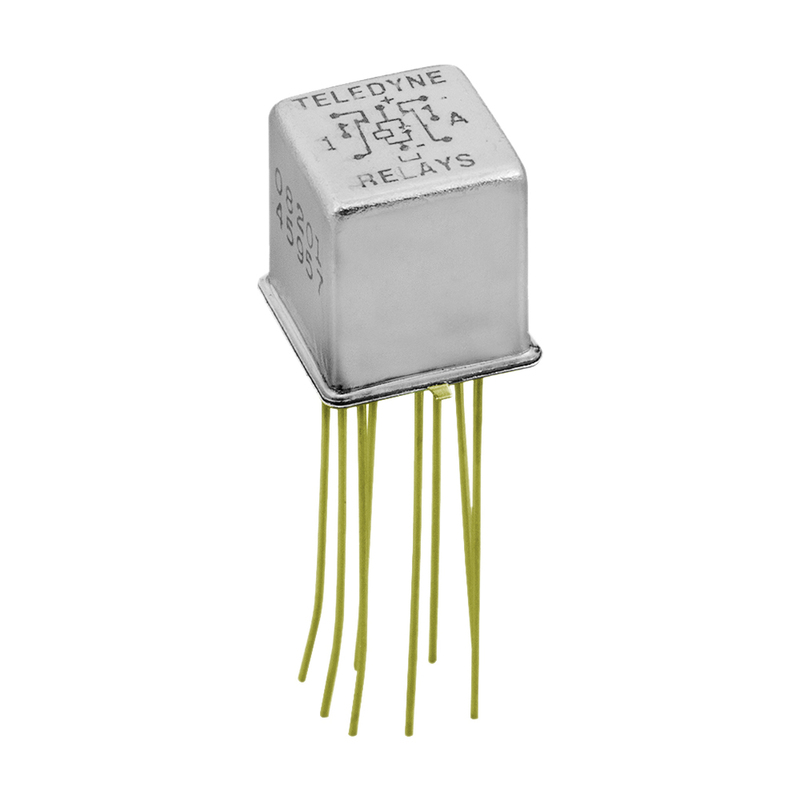 Teledyne Series 134 Sensitive Centrigrid® 2 Form C (DPDT) Relay, Continuous Duty DC - 1 GHz, 28 vdc @ 1 A, 115 VAC @ 100 mA (10-50 mV @ 10-50 µA) contacts, 5 vdc 64 ohm Coil with double diode, Through-Hole 9 pin (three rows of 4) 0.1" spacing includes case ground lead, 0.75" (19.05 mm) long leads Hermetically Sealed, Grounded Case, Includes PCB Spacer Pad, 0.375 L x 0.375 W x 0.4 H (9.53 x 9.53 x 10.16 mm), -65°C to +125°C, Established Reliability level A: 1.5% allowable failures in 10,000 unit cycles. Alt. 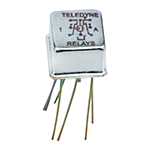 P/Ns: ER134DDZM45A, ER134DDZ-5A, ER134DDZ5A. 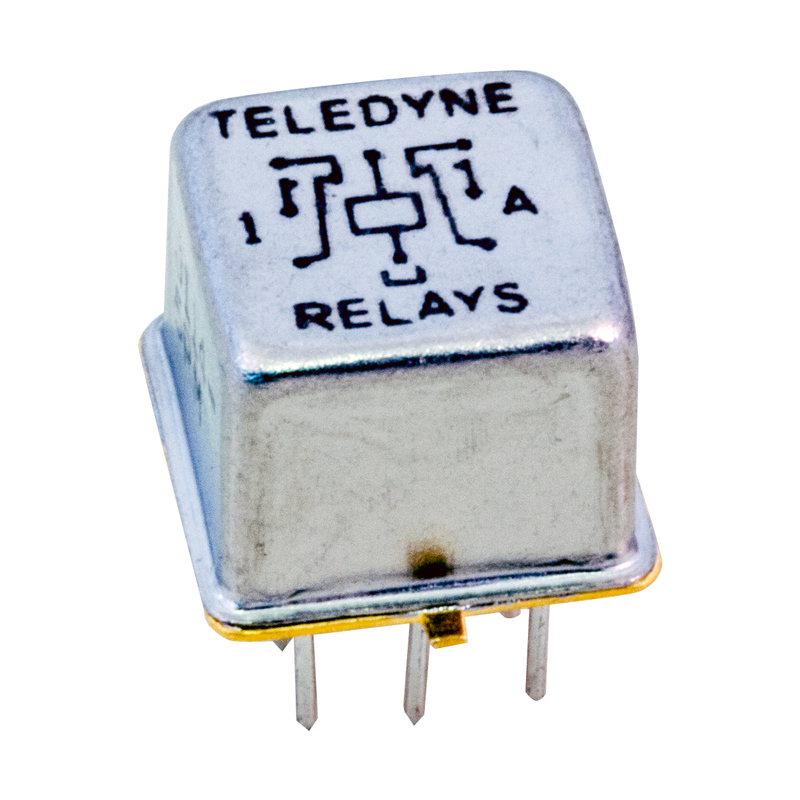 Teledyne Series 134 Sensitive Centrigrid® 2 Form C (DPDT) Relay, Continuous Duty DC - 1 GHz, 28 vdc @ 1 A, 115 VAC @ 100 mA (10-50 mV @ 10-50 µA) contacts, 12 vdc 800 ohm Coil, Through-Hole 10 pin (three rows of 4) 0.1" spacing includes case ground leads, 0.75" (19.05 mm) long leads Hermetically Sealed, Grounded Case, Includes PCB Spacer Pad, 0.375 L x 0.375 W x 0.4 H (9.53 x 9.53 x 10.16 mm), -65°C to +125°C, Established Reliability level A: 1.5% allowable failures in 10,000 unit cycles. Alt. 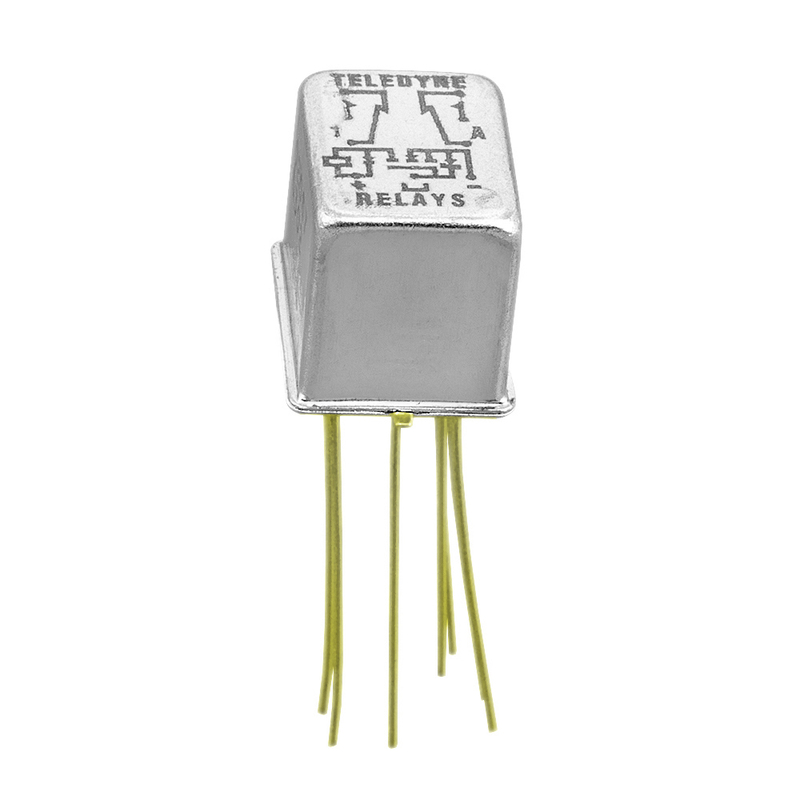 P/Ns: ER134YZM412A, ER134YZ-12A, ER134YZ12A. 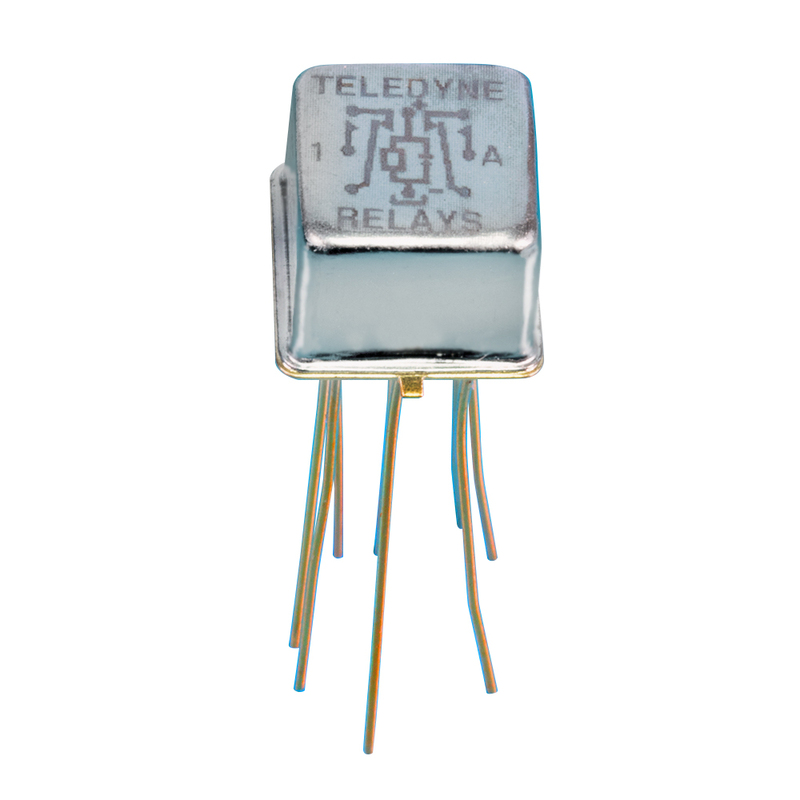 Teledyne Series 134 Sensitive Centrigrid® 2 Form C (DPDT) Relay, Continuous Duty DC - 1 GHz, 28 vdc @ 1 A, 115 VAC @ 250 mA (10-50 mV @ 10-50 µA) contacts, 12 vdc 800 ohm Coil with diode, Through-Hole 8 pin (three rows of 3) 0.1" spacing, 0.75" (19.05 mm) long leads Hermetically Sealed, 0.375 L x 0.375 W x 0.375 H (9.53 x 9.53 x 9.53 mm), -65°C to +125°C. Alt. P/N: 134D12. 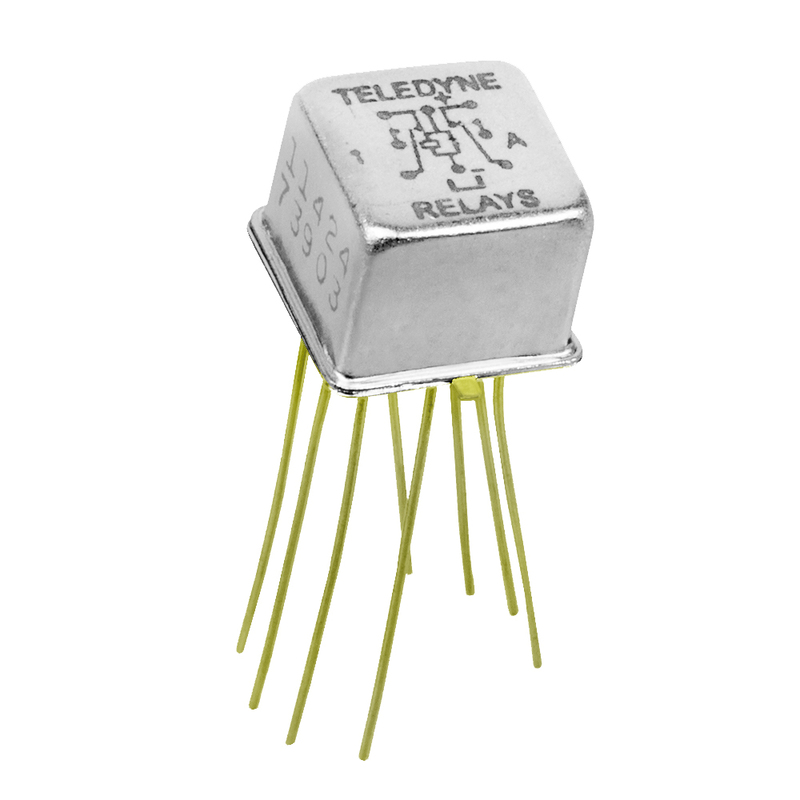 Teledyne Series 134 Sensitive Centrigrid® 2 Form C (DPDT) Relay, Continuous Duty DC - 1 GHz, 28 vdc @ 1 A, 115 VAC @ 250 mA (10-50 mV @ 10-50 µA) contacts, 12 vdc 800 ohm Coil with diode, Through-Hole 8 pin (three rows of 3) 0.1" spacing, 0.75" (19.05 mm) long leads Hermetically Sealed, 0.375 L x 0.375 W x 0.375 H (9.53 x 9.53 x 9.53 mm), -65°C to +125°C, Joint Army Navy Established Reliability level M: 1% allowable failures in 10,000 unit cycles. Alt. 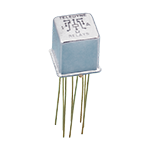 P/Ns: M39016/42-035M, J134D12M. 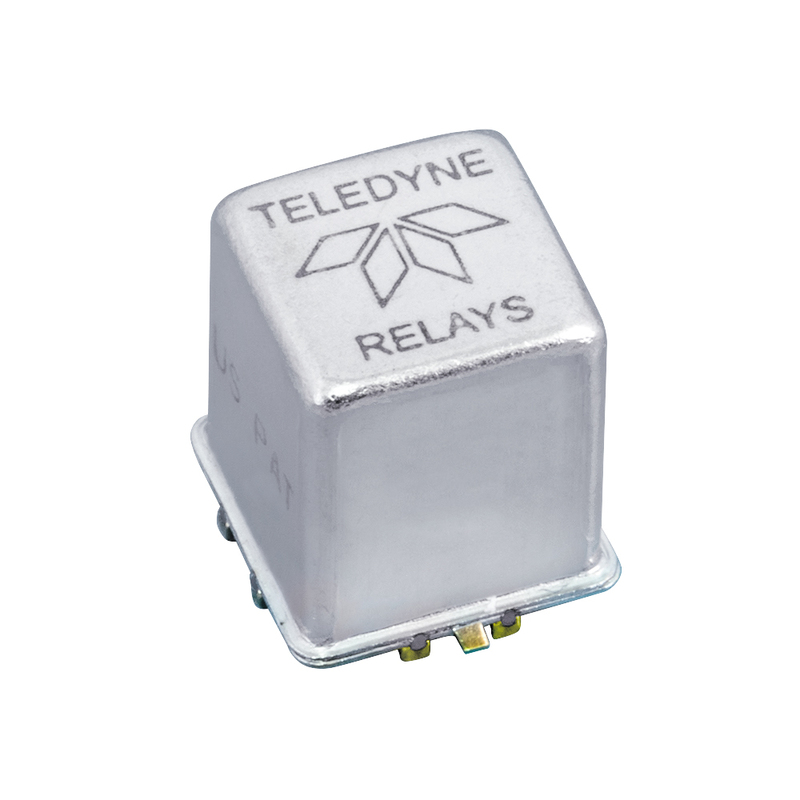 Teledyne Series 134 Sensitive Centrigrid® 2 Form C (DPDT) Relay, Continuous Duty DC - 1 GHz, 28 vdc @ 1 A, 115 VAC @ 250 mA (10-50 mV @ 10-50 µA) contacts, 26.5 vdc 3.2K ohm Coil, Through-Hole 8 pin (three rows of 3) 0.1" spacing, 0.187" (1.75 mm) long pins Hermetically Sealed, 0.375 L x 0.375 W x 0.375 H (9.53 x 9.53 x 9.53 mm), -65°C to +125°C, Joint Army Navy Established Reliability level M: 1% allowable failures in 10,000 unit cycles. Alt. P/Ns: M39016/41-044M, J13426PM. 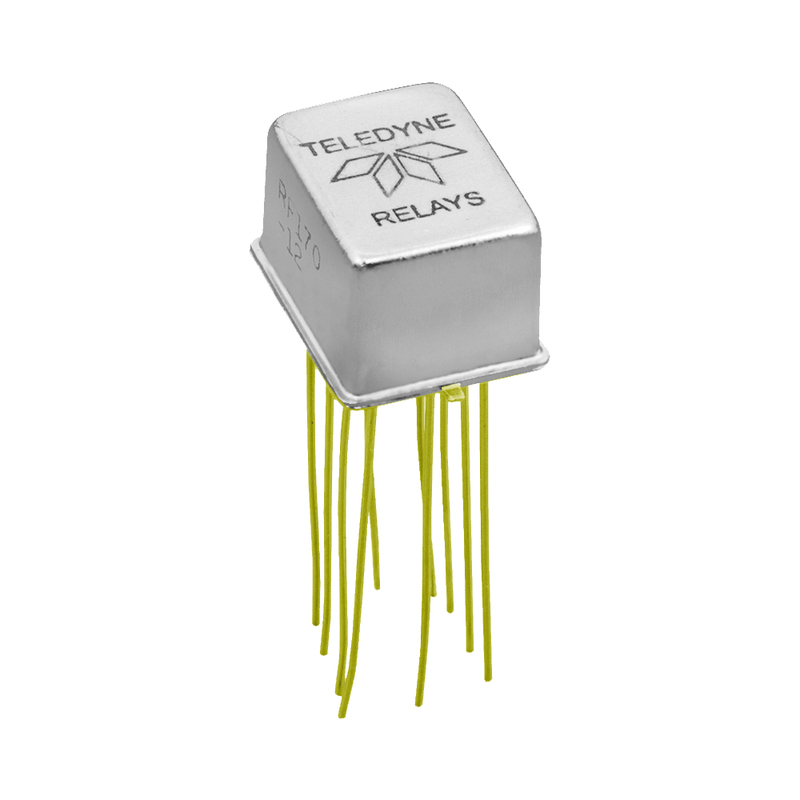 Teledyne Series 134 Sensitive Centrigrid® 2 Form C (DPDT) Relay, Continuous Duty DC - 1 GHz, 28 vdc @ 1 A, 115 VAC @ 250 mA (10-50 mV @ 10-50 µA) contacts, 5 vdc 100 ohm Coil with diode, Through-Hole 8 pin (three rows of 3) 0.1" spacing, 0.75" (19.05 mm) long leads Hermetically Sealed, 0.375 L x 0.375 W x 0.375 H (9.53 x 9.53 x 9.53 mm), -65°C to +125°C, Established Reliability level A: 1.5% allowable failures in 10,000 unit cycles. Alt. P/N: ER134D5A. 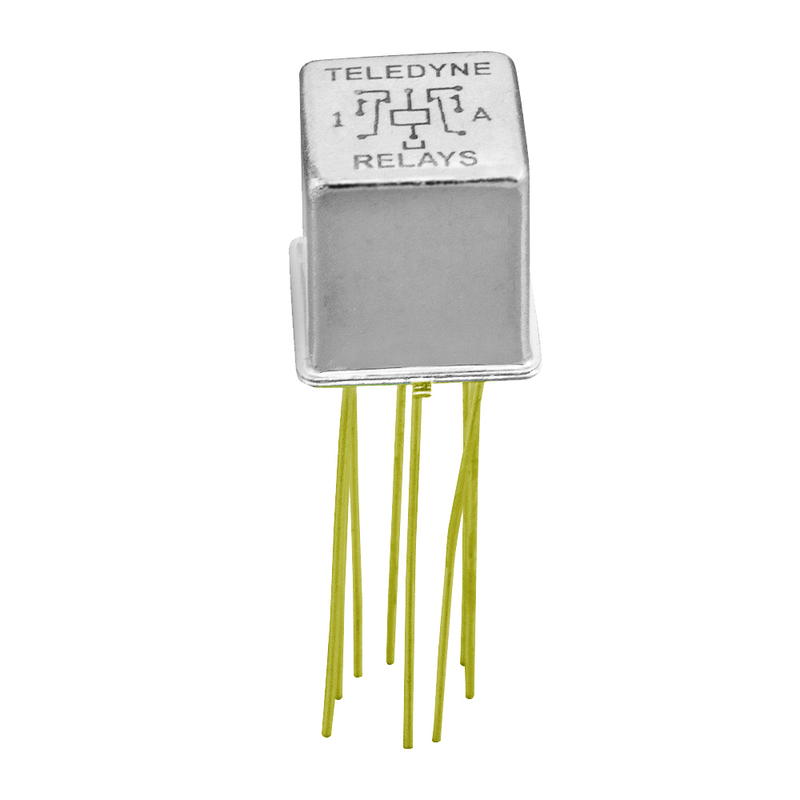 Teledyne Series 134 Sensitive Centrigrid® 2 Form C (DPDT) Relay, Continuous Duty DC - 1 GHz, 28 vdc @ 1 A, 115 VAC @ 250 mA (10-50 mV @ 10-50 µA) contacts, 6 vdc 200 ohm Coil with diode, Through-Hole 8 pin (three rows of 3) 0.1" spacing, 0.187" (1.75 mm) long pins Hermetically Sealed, 0.375 L x 0.375 W x 0.375 H (9.53 x 9.53 x 9.53 mm), -65°C to +125°C, Joint Army Navy Established Reliability level M: 1% allowable failures in 10,000 unit cycles. Alt. 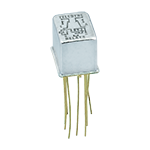 P/Ns: M39016/42-042M, J134D6PM. 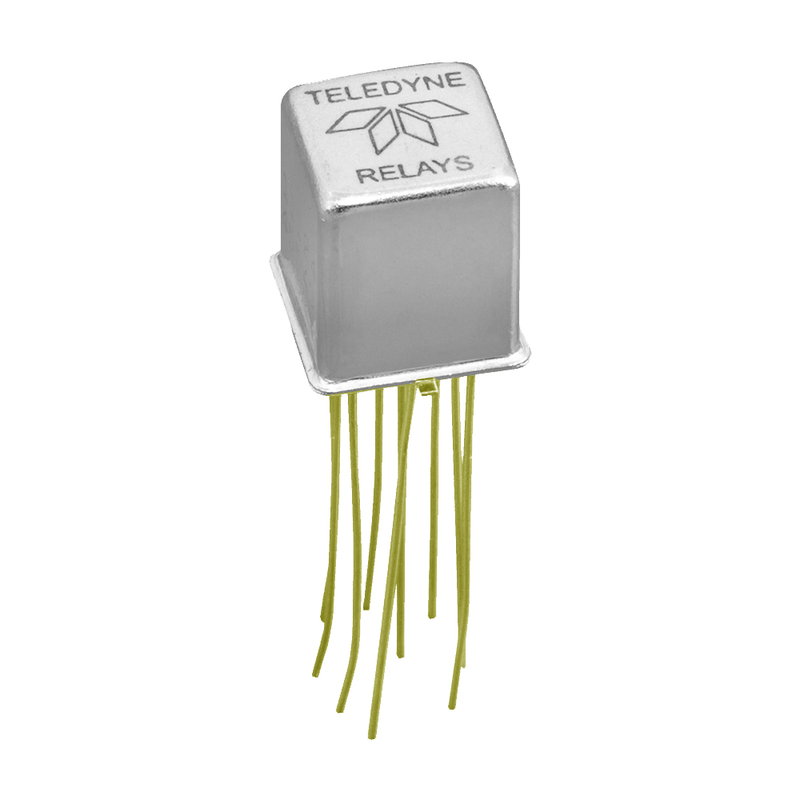 Teledyne Series 134 Sensitive Centrigrid® 2 Form C (DPDT) Relay, Continuous Duty DC - 1 GHz, 28 vdc @ 1 A, 115 VAC @ 250 mA (10-50 mV @ 10-50 µA) contacts, 6 vdc 200 ohm Coil with diode, Through-Hole 8 pin (three rows of 3) 0.1" spacing, 0.75" (19.05 mm) long leads Hermetically Sealed, 0.375 L x 0.375 W x 0.375 H (9.53 x 9.53 x 9.53 mm), -65°C to +125°C, Joint Army Navy Established Reliability level M: 1% allowable failures in 10,000 unit cycles. Alt. 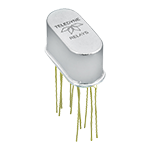 P/Ns: M39016/42-034M, J134D6M. 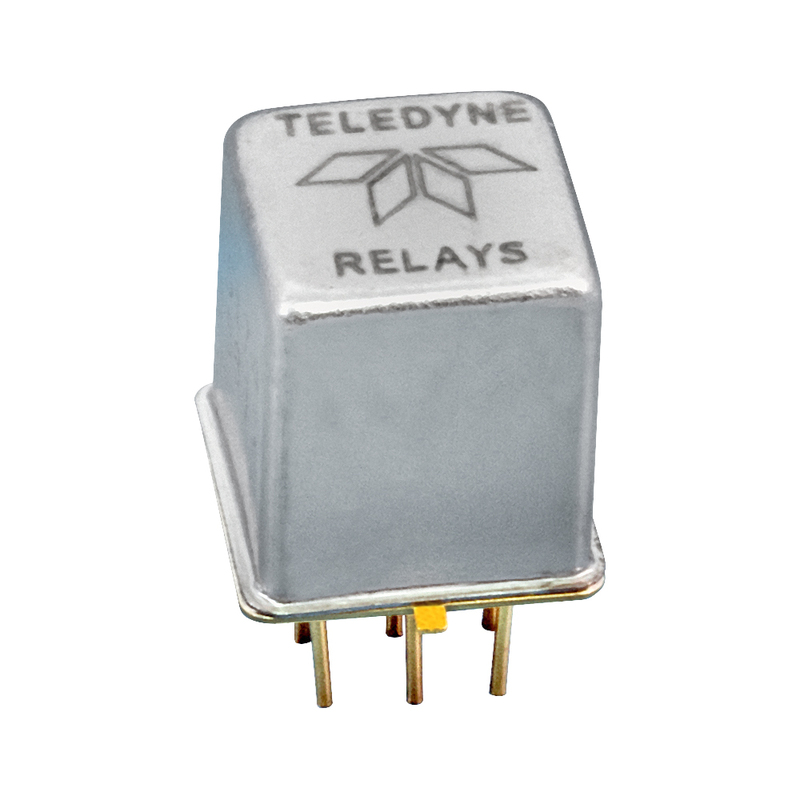 Teledyne Series 134 Sensitive Centrigrid® 2 Form C (DPDT) Relay, Continuous Duty DC - 1 GHz, 28 vdc @ 1 A, 115 VAC @ 250 mA (10-50 mV @ 10-50 µA) contacts, 26.5 vdc 3.2K ohm Coil with diode, Through-Hole 8 pin (three rows of 3) 0.1" spacing, 0.187" (1.75 mm) long pins Hermetically Sealed, 0.375 L x 0.375 W x 0.375 H (9.53 x 9.53 x 9.53 mm), -65°C to +125°C, Joint Army Navy Established Reliability level M: 1% allowable failures in 10,000 unit cycles. Alt. P/Ns: M39016/42-044M, J134D26PM. 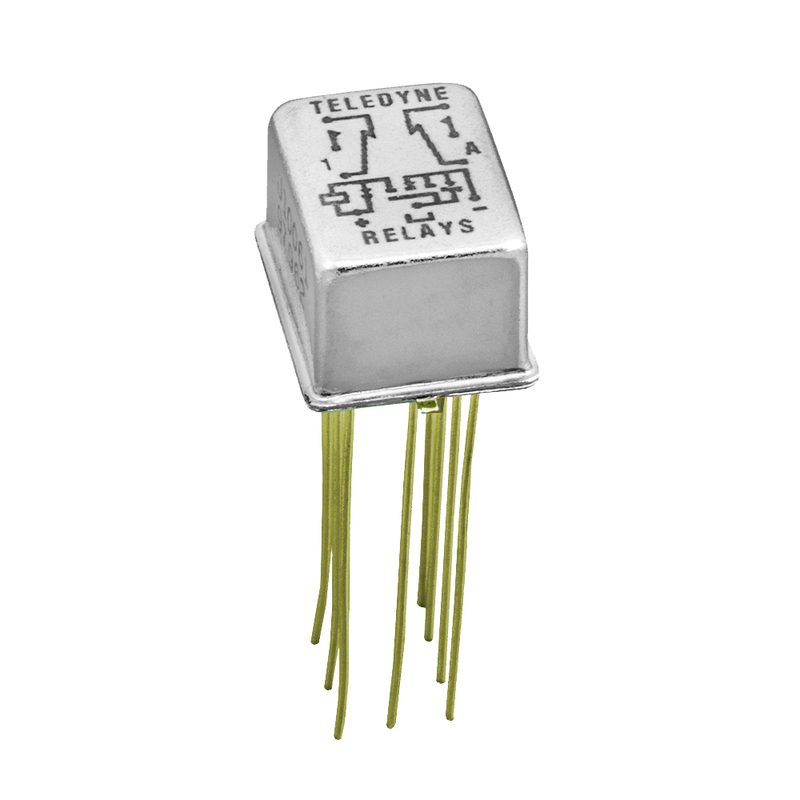 Teledyne Series 136C Sensitive CMOS Compatible Centrigrid® 2 Form C (DPDT) Relay, Continuous Duty DC - 1 GHz, 28 vdc @ 1 A, 115 VAC @ 250 mA (10-50 mV @ 10-50 µA) contacts, 5 vdc @ 56 mA + 3.8 vdc (TTL) Coil, Through-Hole 9 pin (three rows of 4) 0.1" spacing, 0.75" (19.05 mm) long leads Hermetically Sealed, Includes PCB Spacer Pad, 0.475 L x 0.375 W x 0.4 H (12.07 x 9.53 x 10.16 mm), -65°C to +125°C. Alt. 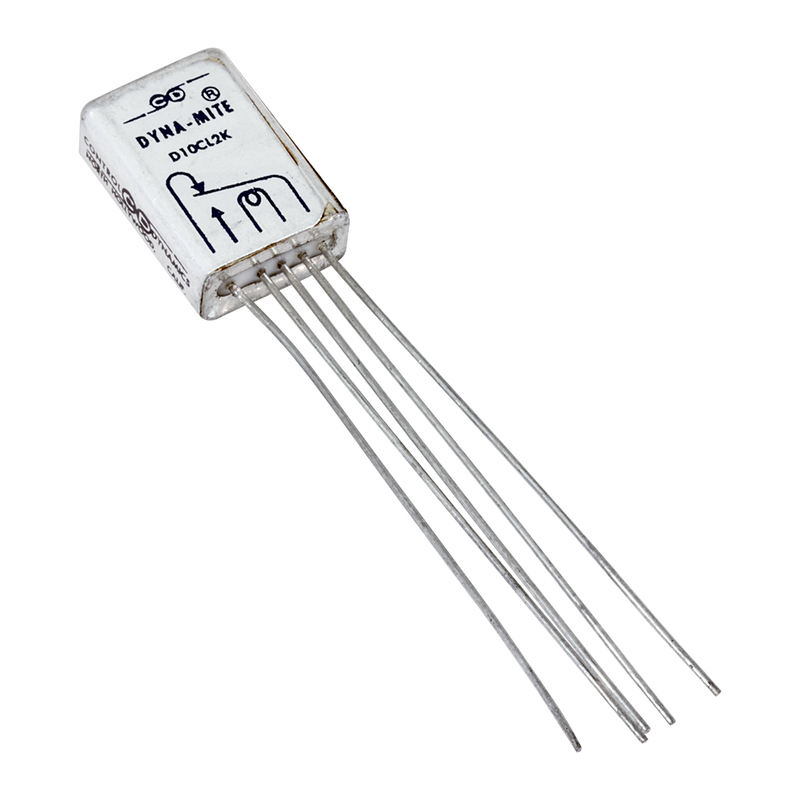 P/Ns: 136CM95, 136C-5, 136C5. 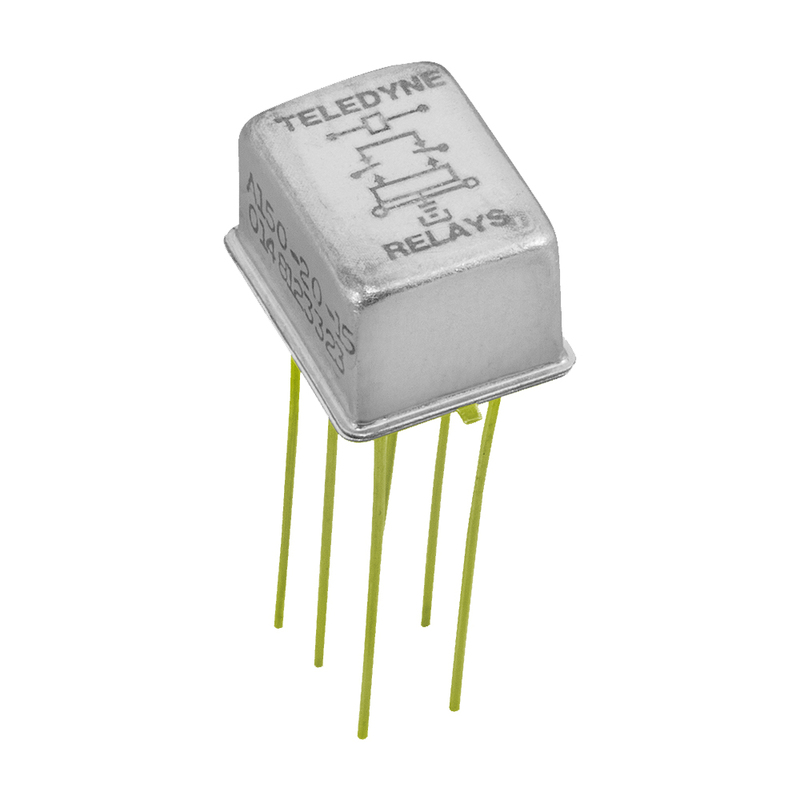 Teledyne Series 136C Sensitive CMOS Compatible Centrigrid® 2 Form C (DPDT) Relay, Continuous Duty DC - 1 GHz, 28 vdc @ 1 A, 115 VAC @ 250 mA (10-50 mV @ 10-50 µA) contacts, 5 vdc @ 56 mA + 3.8 vdc (TTL) Coil, Through-Hole 9 pin (three rows of 4) 0.1" spacing, 0.75" (19.05 mm) long leads Hermetically Sealed, Includes PCB Spacer Pad, 0.475 L x 0.375 W x 0.4 H (12.07 x 9.53 x 10.16 mm), -65°C to +125°C, Established Reliability level A: 1.5% allowable failures in 10,000 unit cycles. 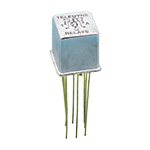 Teledyne Series 136C Sensitive CMOS Compatible Centrigrid® 2 Form C (DPDT) Relay, Continuous Duty DC - 1 GHz, 28 vdc @ 1 A, 115 VAC @ 100 mA (10-50 mV @ 10-50 µA) contacts, 5 vdc @ 56 mA + 3.8 vdc (TTL) Coil, Through-Hole 10 pin (three rows of 4) 0.1" spacing includes case ground lead, 0.75" (19.05 mm) long leads Hermetically Sealed, Grounded Case, Includes PCB Spacer Pad, 0.475 L x 0.375 W x 0.4 H (12.07 x 9.53 x 10.16 mm), -65°C to +125°C, Established Reliability level A: 1.5% allowable failures in 10,000 unit cycles. Alt. 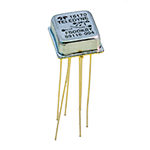 P/Ns: ER136CZM95A, ER136CZ-5A, ER136CZ5A. Teledyne Series 136C Sensitive CMOS Compatible Centrigrid® 2 Form C (DPDT) Relay, Continuous Duty DC - 1 GHz, 28 vdc @ 1 A, 115 VAC @ 250 mA (10-50 mV @ 10-50 µA) contacts, 5 vdc @ 56 mA + 3.8 vdc (TTL) Coil, Through-Hole 9 pin (three rows of 4) 0.1" spacing, 0.75" (19.05 mm) long leads Hermetically Sealed, 0.475 L x 0.375 W x 0.375 H (12.07 x 9.53 x 9.53 mm), -65°C to +125°C, Established Reliability level A: 1.5% allowable failures in 10,000 unit cycles. Alt. P/N: ER136C5A. 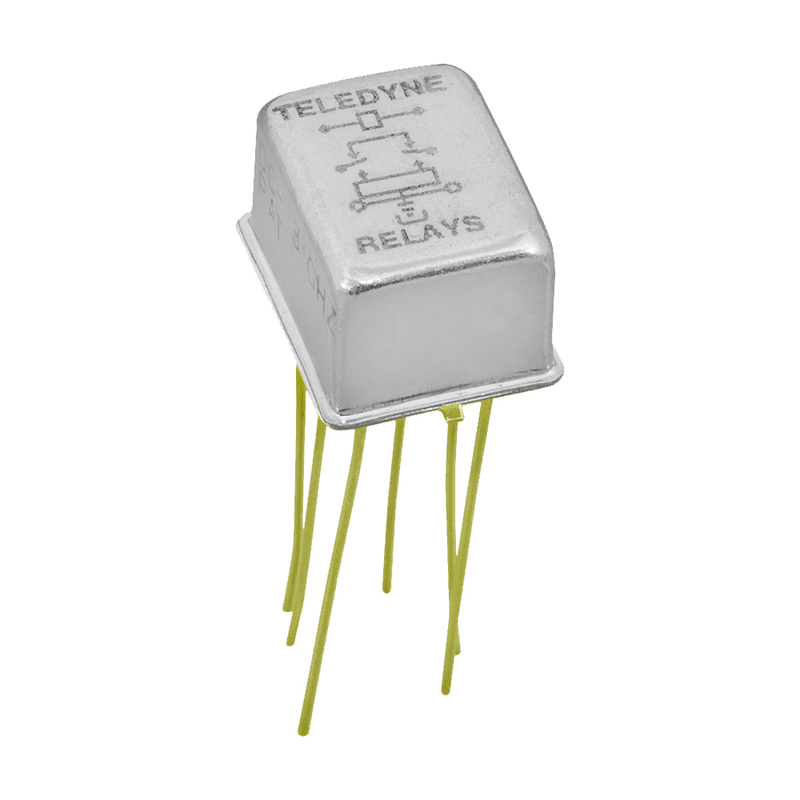 Teledyne Series 136C Sensitive CMOS Compatible Centrigrid® 2 Form C (DPDT) Relay, Continuous Duty DC - 1 GHz, 28 vdc @ 1 A, 115 VAC @ 250 mA (10-50 mV @ 10-50 µA) contacts, 26.5 vdc @ 10.2 mA + 3.8 vdc (TTL) Coil, Through-Hole 9 pin (three rows of 4) 0.1" spacing, 0.75" (19.05 mm) long leads Hermetically Sealed, Includes PCB Spacer Pad, 0.475 L x 0.375 W x 0.4 H (12.07 x 9.53 x 10.16 mm), -65°C to +125°C, Joint Army Navy Established Reliability level L: 3% allowable failures in 10,000 unit cycles. Alt. P/N: M28776/7-012L, J136CM926L, J136C-26L, J136C26L. 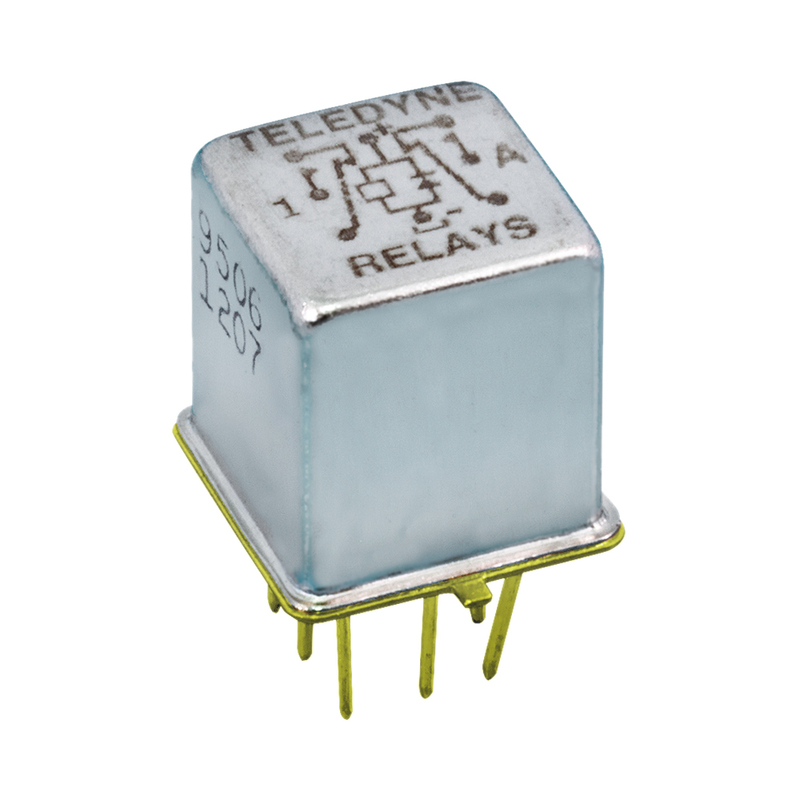 Teledyne Series 136C Sensitive CMOS Compatible Centrigrid® 2 Form C (DPDT) Relay, Continuous Duty DC - 1 GHz, 28 vdc @ 1 A, 115 VAC @ 250 mA (10-50 mV @ 10-50 µA) contacts, 26.5 vdc @ 10.2 mA + 3.8 vdc (TTL) Coil, Through-Hole 9 pin (three rows of 4) 0.1" spacing, 0.75" (19.05 mm) long leads Hermetically Sealed, Includes PCB Spacer Pad, 0.475 L x 0.375 W x 0.4 H (12.07 x 9.53 x 10.16 mm), -65°C to +125°C, Joint Army Navy Established Reliability level M: 1% allowable failures in 10,000 unit cycles. Alt. P/N: M28776/7-012M, J136CM926M, J136C-26M, J136C26M. 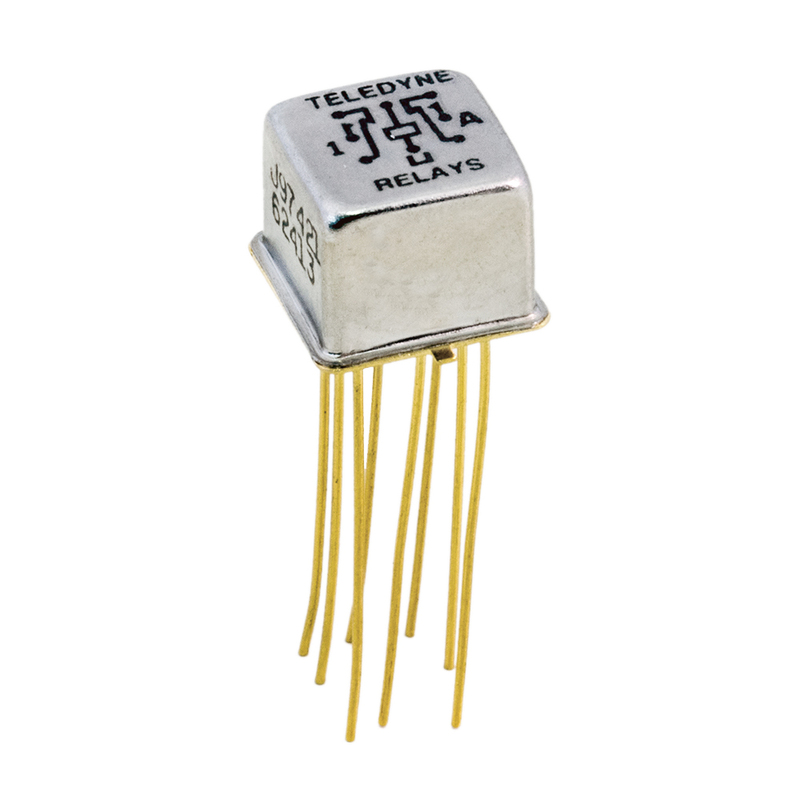 Teledyne Series 136C Sensitive CMOS Compatible Centrigrid® 2 Form C (DPDT) Relay, Continuous Duty DC - 1 GHz, 28 vdc @ 1 A, 115 VAC @ 250 mA (10-50 mV @ 10-50 µA) contacts, 5 vdc @ 56 mA + 3.8 vdc (TTL) Coil, Through-Hole 9 pin (three rows of 4) 0.1" spacing, 0.75" (19.05 mm) long leads Hermetically Sealed, Includes PCB Spacer Pad, 0.475 L x 0.375 W x 0.4 H (12.07 x 9.53 x 10.16 mm), -65°C to +125°C, Joint Army Navy Established Reliability level M: 1% allowable failures in 10,000 unit cycles. Alt. P/N: M28776/7-007M, J136CM95M, J136C-5M, J136C5M. 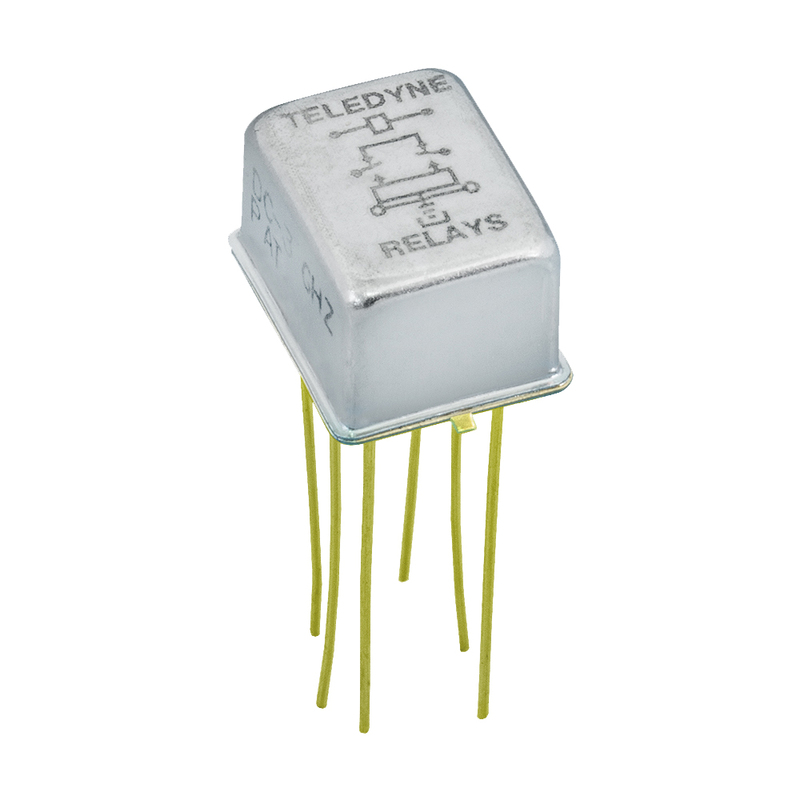 Teledyne Series 136C Sensitive CMOS Compatible Centrigrid® 2 Form C (DPDT) Relay, Continuous Duty DC - 1 GHz, 28 vdc @ 1 A, 115 VAC @ 250 mA (10-50 mV @ 10-50 µA) contacts, 12 vdc @ 17.7 mA + 3.8 vdc (TTL) Coil, Through-Hole 9 pin (three rows of 4) 0.1" spacing, 0.75" (19.05 mm) long leads Hermetically Sealed, 0.475 L x 0.375 W x 0.375 H (12.07 x 9.53 x 9.53 mm), -65°C to +125°C, Joint Army Navy Established Reliability level M: 1% allowable failures in 10,000 unit cycles. Alt. 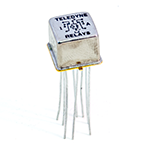 P/Ns: M28776/7-004M, J136C12M. 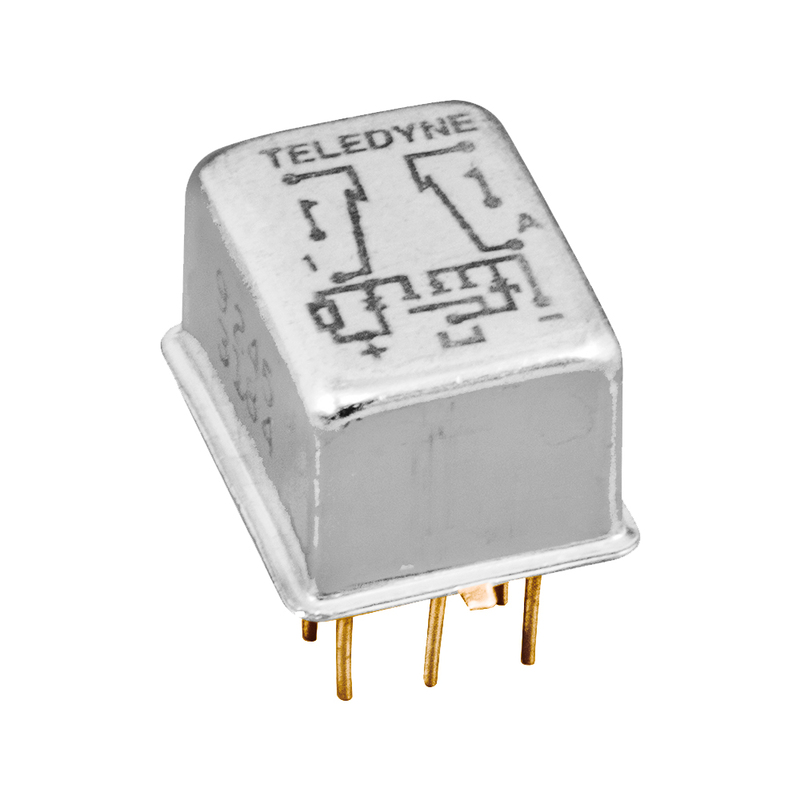 Teledyne Series 172 Commercial Centrigrid® 2 Form C (DPDT) Relay, Continuous Duty DC - 1 GHz, 28 vdc @ 1 A (10-50 mV @ 10-50 µA) contacts, 26.5 vdc 1.6K ohm Coil, Through-Hole 9 pin (three rows of 3) 0.1" spacing includes case ground lead, 0.75" (19.05 mm) long leads Hermetically Sealed, Grounded Case, 0.375 L x 0.375 W x 0.28 H (9.53 x 9.53 x 7.11 mm), -55°C to +85°C. Alt. 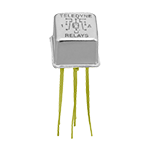 P/N: 172Y26. 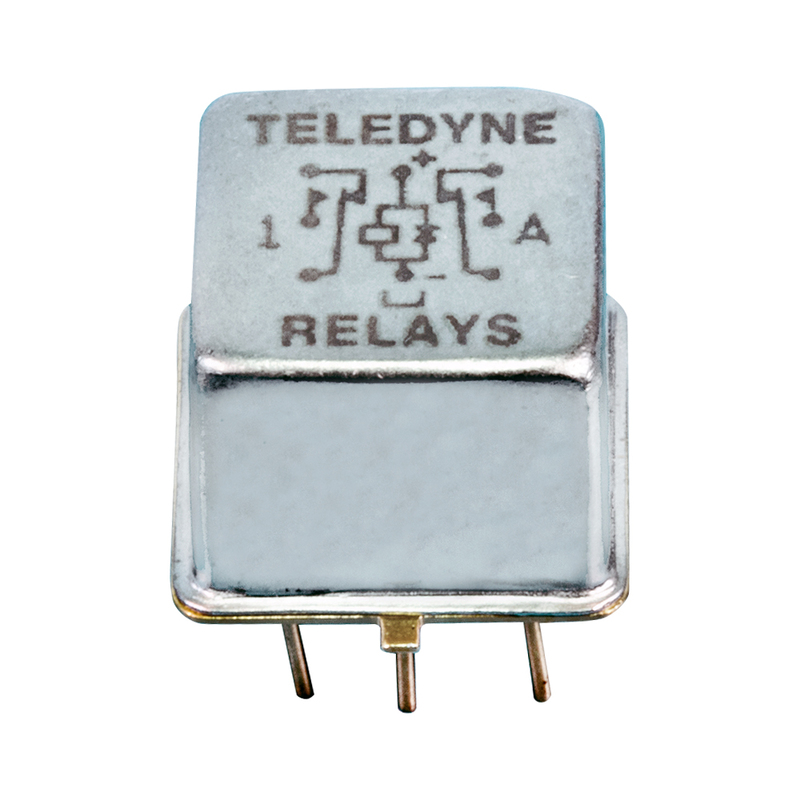 Teledyne Series 172 Commercial Centrigrid® 2 Form C (DPDT) Relay, Continuous Duty DC - 1 GHz, 28 vdc @ 1 A (10-50 mV @ 10-50 µA) contacts, 26.5 vdc 1.6K ohm Coil, Through-Hole 8 pin (three rows of 3) 0.1" spacing, 0.75" (19.05 mm) long leads Hermetically Sealed, 0.375 L x 0.375 W x 0.28 H (9.53 x 9.53 x 7.11 mm), -55°C to +85°C. Alt. P/N: 17226. 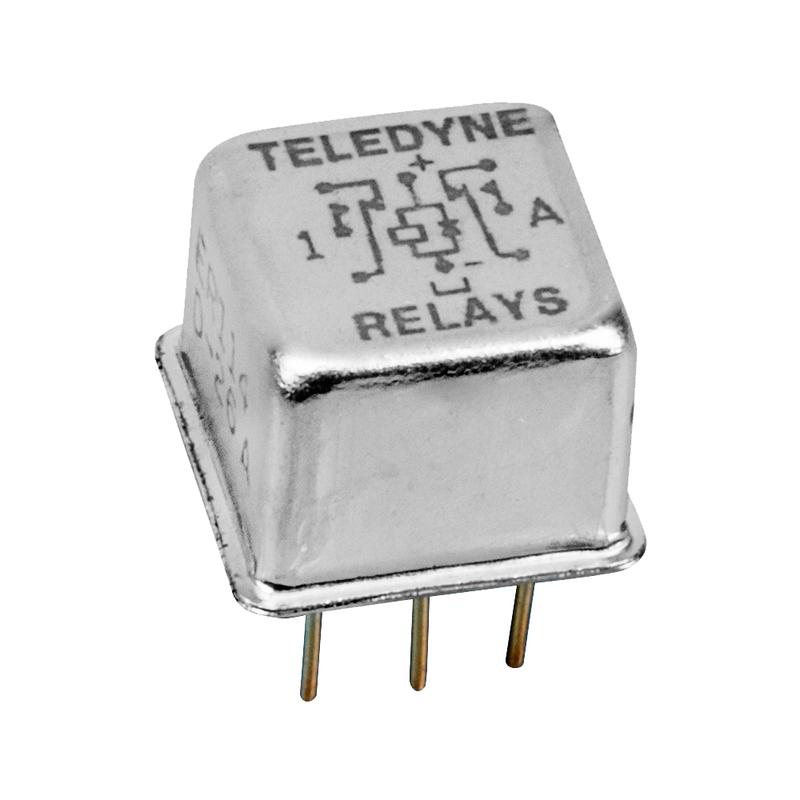 Teledyne Series 172 Commercial Centrigrid® 2 Form C (DPDT) Relay, Continuous Duty DC - 1 GHz, 28 vdc @ 1 A (10-50 mV @ 10-50 µA) contacts, 12 vdc 400 ohm Coil with diode, Through-Hole 9 pin (three rows of 3) 0.1" spacing includes case ground lead, 0.75" (19.05 mm) long leads Hermetically Sealed, Grounded Case, Includes PCB Spacer Pad, 0.375 L x 0.375 W x 0.305 H (9.53 x 9.53 x 7.75 mm), -55°C to +85°C. Alt. 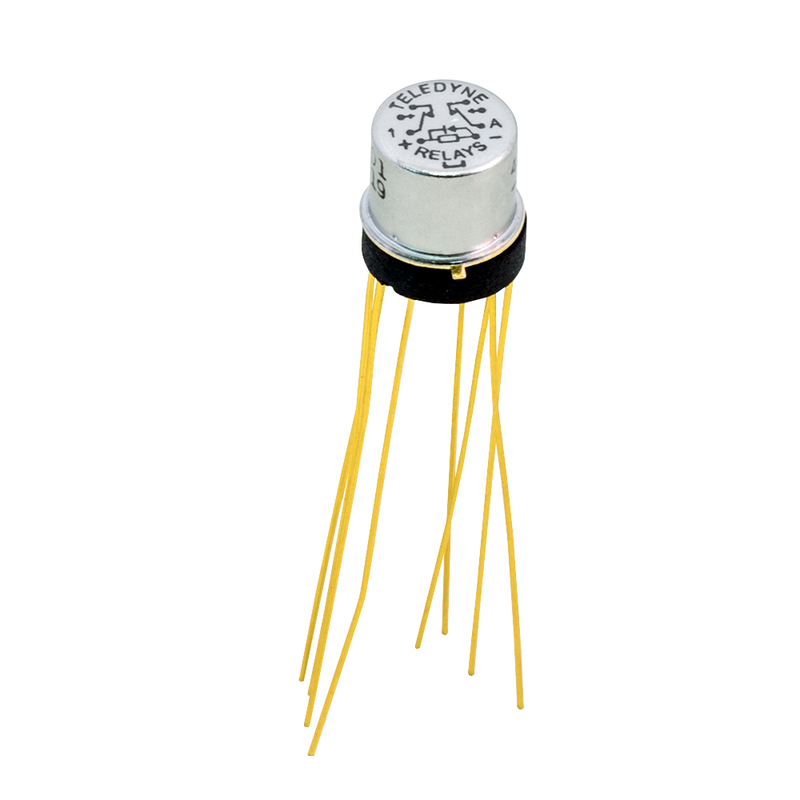 P/Ns: 172DZM412, 172DZ-12, 172DZ12. 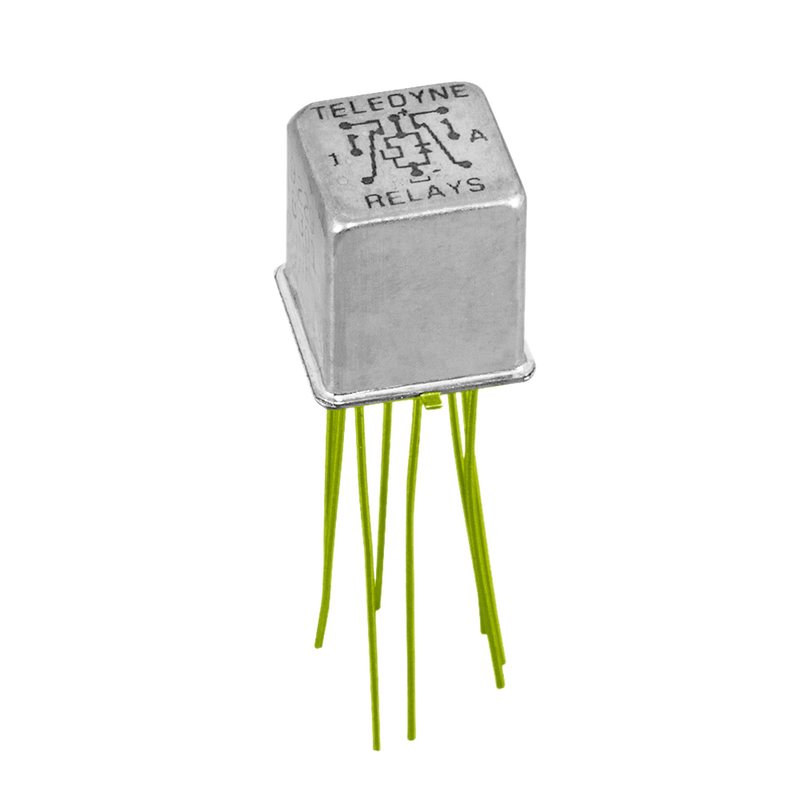 Teledyne Series 172 Commercial Centrigrid® 2 Form C (DPDT) Relay, Continuous Duty DC - 1 GHz, 28 vdc @ 1 A (10-50 mV @ 10-50 µA) contacts, 5 vdc 64 ohm Coil, Through-Hole 8 pin (three rows of 3) 0.1" spacing, 0.75" (19.05 mm) long leads Hermetically Sealed, Includes PCB Spacer Pad, 0.375 L x 0.375 W x 0.305 H (9.53 x 9.53 x 7.75 mm), -55°C to +85°C. Alt. P/N: 172M45, 172-5, 1725. 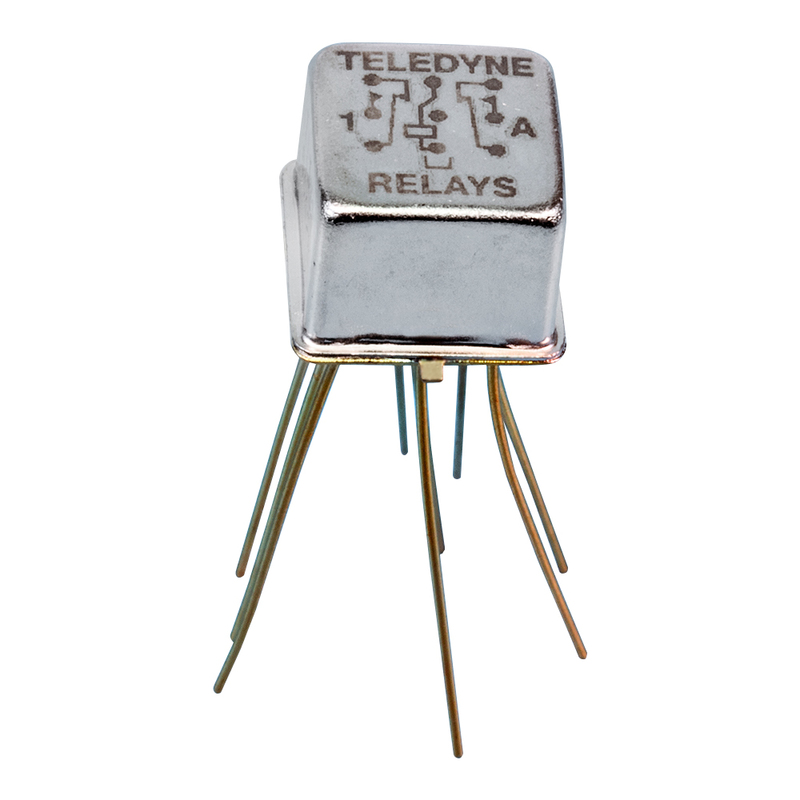 Teledyne Series 172 Commercial Centrigrid® 2 Form C (DPDT) Relay, Continuous Duty DC - 1 GHz, 28 vdc @ 1 A (10-50 mV @ 10-50 µA) contacts, 12 vdc 400 ohm Coil with diode, Through-Hole 8 pin (three rows of 3) 0.1" spacing, 0.75" (19.05 mm) long leads Hermetically Sealed, Includes PCB Spacer Pad, 0.375 L x 0.375 W x 0.305 H (9.53 x 9.53 x 7.75 mm), -55°C to +85°C. Alt. P/N: 172DM412, 172D-12, 172D12. 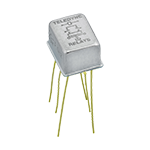 Teledyne Series 172 Commercial Centrigrid® 2 Form C (DPDT) Relay, Continuous Duty DC - 1 GHz, 28 vdc @ 1 A (10-50 mV @ 10-50 µA) contacts, 12 vdc 400 ohm Coil, Through-Hole 8 pin (three rows of 3) 0.1" spacing, 0.187" (1.75 mm) long pins Hermetically Sealed, Includes PCB Spacer Pad, 0.375 L x 0.375 W x 0.305 H (9.53 x 9.53 x 7.75 mm), -55°C to +85°C. Alt. P/N: 172M412, 172-12, 17212. 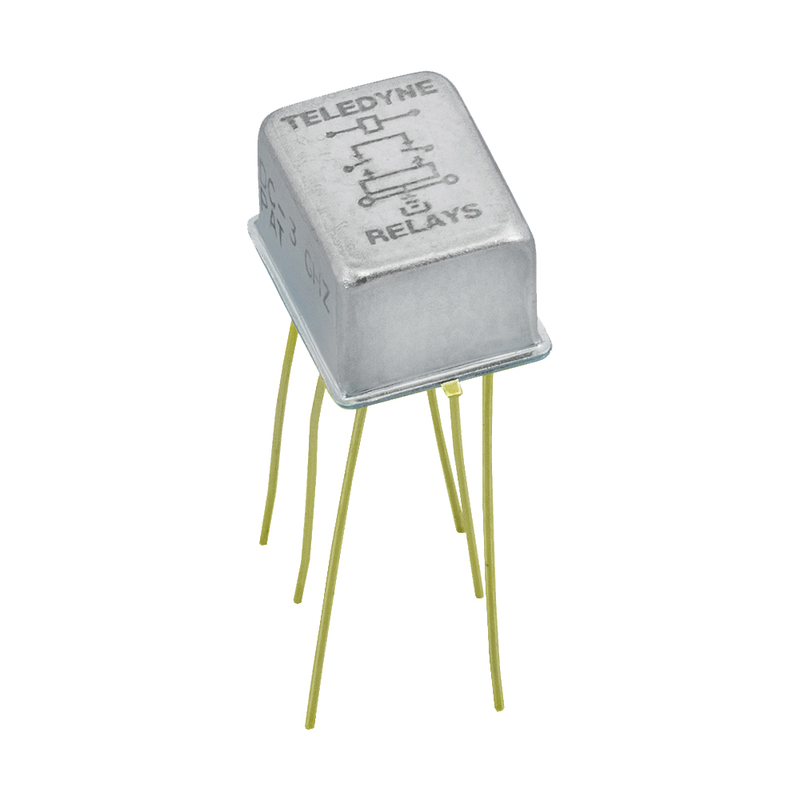 Teledyne Series 172 Commercial Centrigrid® 2 Form C (DPDT) Relay, Continuous Duty DC - 1 GHz, 28 vdc @ 1 A (10-50 mV @ 10-50 µA) contacts, 3 vdc 39 ohm Coil with diode, Through-Hole 8 pin (three rows of 3) 0.1" spacing, 0.75" (19.05 mm) long leads Hermetically Sealed, 0.375 L x 0.375 W x 0.28 H (9.53 x 9.53 x 7.11 mm), -55°C to +85°C. Alt. P/N: 172D3. 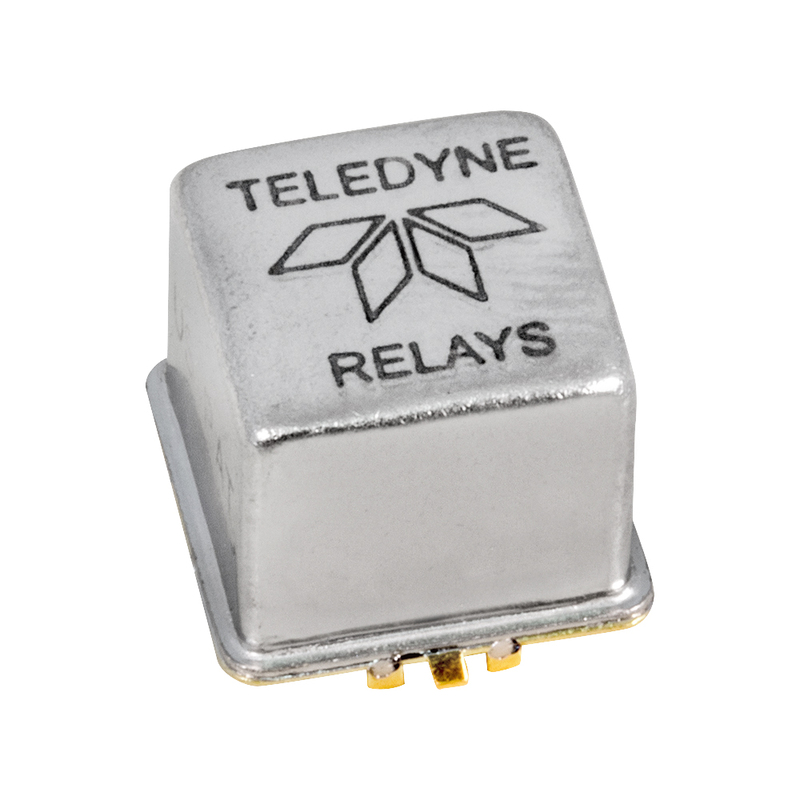 Teledyne Series GRF172 Surface Mount, Centrigrid® 2.5 GHz 2 Form C (DPDT) Relay, Continuous Duty DC - 2.5 GHz, 28 vdc @ 1 A (10-50 mV @ 10-50 µA) contacts, 12 vdc 400 ohm Coil, Under relay Surface mount 8 pin 0.35" (0.89 mm) long stub leads Hermetically Sealed Surface Mount, 0.335 L x 0.335 W x 0.330 H (8.51 x 8.51 x 8.38 mm), -55°C to +85°C. Alt. 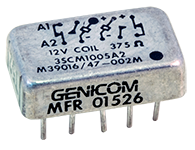 P/N: GRF17212. 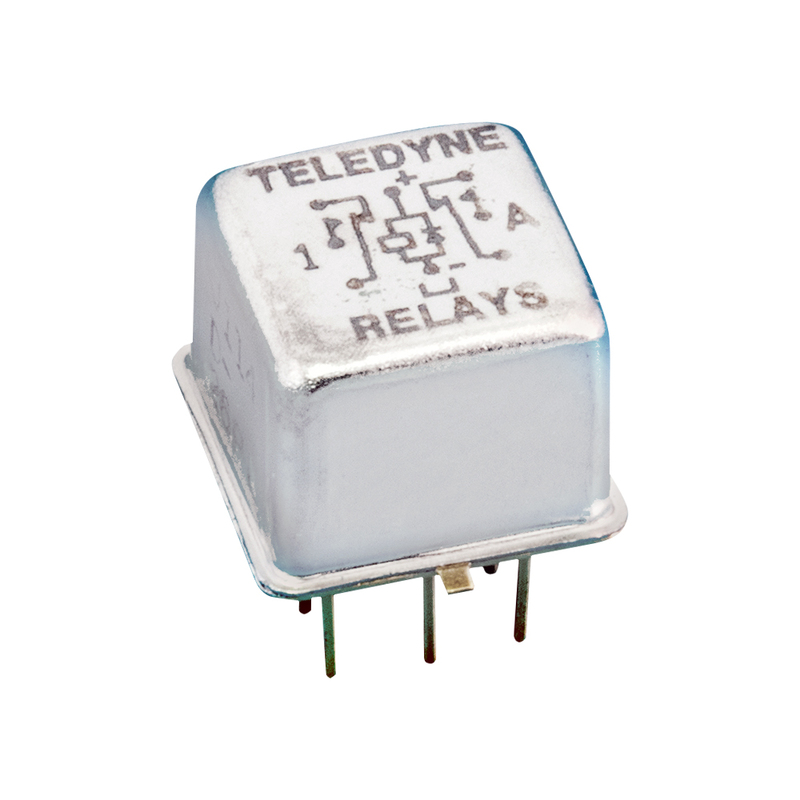 Teledyne Series 172 Commercial Centrigrid® 2 Form C (DPDT) Relay, Continuous Duty DC - 1 GHz, 28 vdc @ 1 A (10-50 mV @ 10-50 µA) contacts, 26.5 vdc 1.6K ohm Coil with diode, Through-Hole 8 pin (three rows of 3) 0.1" spacing, 0.75" (19.05 mm) long leads Hermetically Sealed, 0.375 L x 0.375 W x 0.28 H (9.53 x 9.53 x 7.11 mm), -55°C to +85°C. Alt. P/N: 172D26. 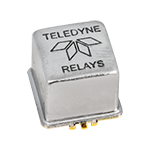 Teledyne Series RF103 High Repeatability, Broadband, Centrigrid® DPDT Non-Latching Continuous Duty DC - 3 GHz, 10-50 mV @ 10-50 µA contacts, 5 vdc 100 ohm Coil, Through-Hole 9 pin, 0.187" (1.75 mm) long pins Hermetically Sealed Square Case, Grounded Case, 0.375 L x 0.375 W x 0.395 H (9.53 x 9.53 x 10.03 mm), -55°C to +85°C. Alt. 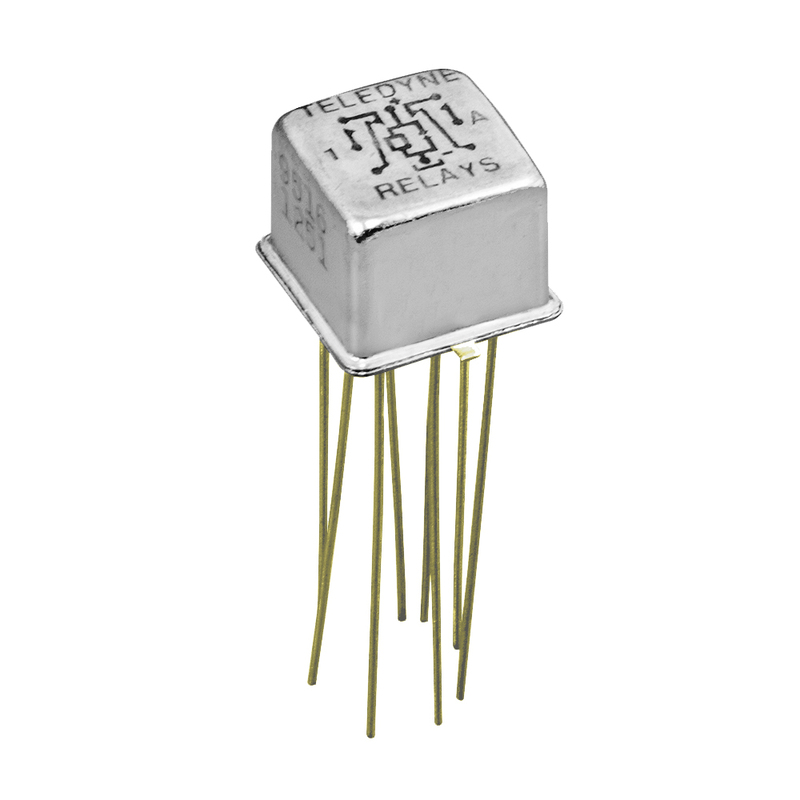 P/N: RF103Z-5. 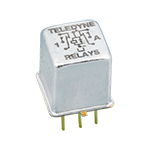 Teledyne Series RF103 High Repeatability, Broadband, Centrigrid® DPDT Non-Latching Continuous Duty DC - 3 GHz, 10-50 mV @ 10-50 µA contacts, 12 vdc 800 ohm Coil, Through-Hole 9 pin, 0.75" (19.05 mm) long leads Hermetically Sealed Square Case, Grounded Case, 0.375 L x 0.375 W x 0.395 H (9.53 x 9.53 x 10.03 mm), -55°C to +85°C. 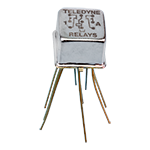 Teledyne Series A150 Ultraminiature Broadband Attenuator SPST (Attenuated or Straight Through) Relay DC - 3 GHz, 1 W contacts, 15 vdc 610 ohm Coil, Through-Hole 6 pin, 0.7" (17.78 mm) long leads Hermetically Sealed Grounded Case, 0.435 L x 0.335 W x 0.280 H (11.05 x 8.51 x 7.11 mm), -55°C to +85°C. Alt. P/N: A150115. 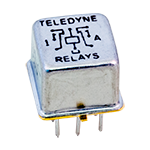 Teledyne Series A150 Ultraminiature Broadband Attenuator SPST (Attenuated or Straight Through) Relay DC - 3 GHz, 1 W contacts, 26.5 vdc 1.56K ohm Coil, Through-Hole 6 pin, 0.7" (17.78 mm) long leads Hermetically Sealed Grounded Case, 0.435 L x 0.335 W x 0.280 H (11.05 x 8.51 x 7.11 mm), -55°C to +85°C. Alt. P/N: A1501626. 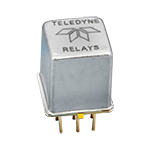 Teledyne Series A150 Ultraminiature Broadband Attenuator SPST (Attenuated or Straight Through) Relay DC - 3 GHz, 1 W contacts, 15 vdc 610 ohm Coil, Through-Hole 6 pin, 0.7" (17.78 mm) long leads Hermetically Sealed Grounded Case, 0.435 L x 0.335 W x 0.280 H (11.05 x 8.51 x 7.11 mm), -55°C to +85°C. Alt. P/N: A1502015. 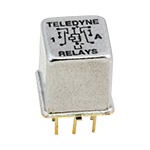 Teledyne Series A150 Ultraminiature Broadband Attenuator SPST (Attenuated or Straight Through) Relay DC - 3 GHz, 1 W contacts, 26.5 vdc 1.56K ohm Coil, Through-Hole 6 pin, 0.7" (17.78 mm) long leads Hermetically Sealed Grounded Case, 0.435 L x 0.335 W x 0.280 H (11.05 x 8.51 x 7.11 mm), -55°C to +85°C. Alt. P/N: A150426. 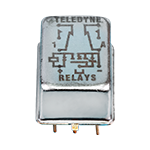 Teledyne Series A150 Ultraminiature Broadband Attenuator SPST (Attenuated or Straight Through) Relay DC - 3 GHz, 1 W contacts, 26.5 vdc 1.56K ohm Coil, Through-Hole 6 pin, 0.7" (17.78 mm) long leads Hermetically Sealed Grounded Case, 0.435 L x 0.335 W x 0.280 H (11.05 x 8.51 x 7.11 mm), -55°C to +85°C. Alt. P/N: A150826. 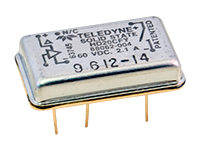 Teledyne Series RF170 Commercial RF Centrigrid® DPDT Magnetic-Latching Continuous Duty DC - 2 GHz, 28 vdc @ 250 mA (10-50 mV @ 10-50 µA) contacts, 12 vdc 500 ohm Coil, Through-Hole 10 pin, 0.75" (19.05 mm) long pins Hermetically Sealed Square Case, 0.475 L x 0.375 W x 0.3 H (12.06 x 5.08 x 7.62 mm), -55°C to +85°C. 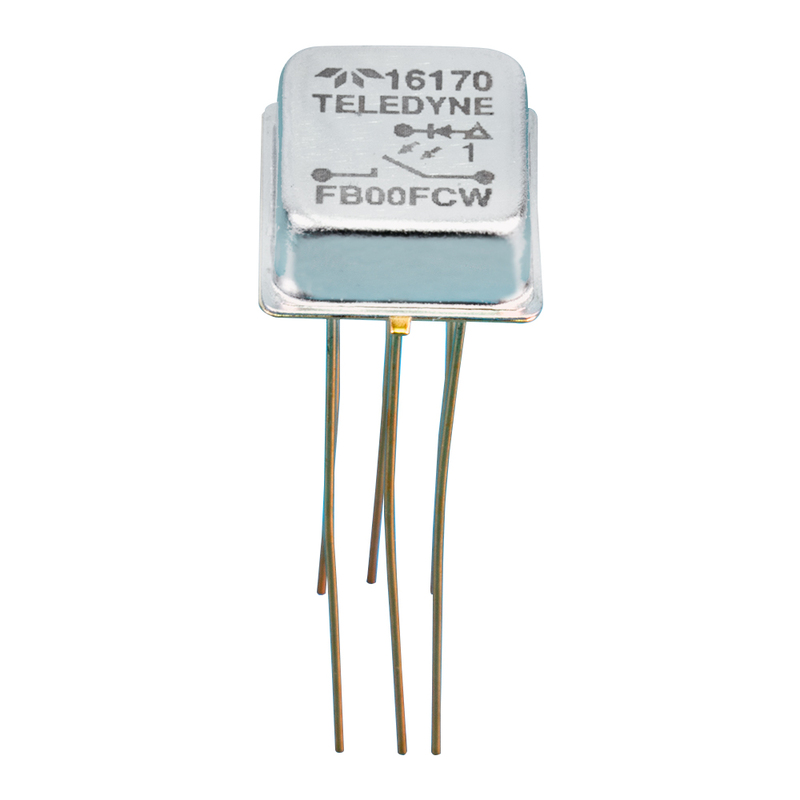 Teledyne Series RF170 Commercial RF Centrigrid® DPDT Magnetic-Latching Continuous Duty DC - 2 GHz, 28 vdc @ 250 mA (10-50 mV @ 10-50 µA) contacts, 5 vdc 61 ohm Coil, Through-Hole 10 pin, 0.75" (19.05 mm) long pins Hermetically Sealed Square Case, 0.475 L x 0.375 W x 0.3 H (12.06 x 5.08 x 7.62 mm), -55°C to +85°C. 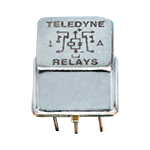 Teledyne Series GRF103 Surface Mount, High Repeatability, Sensitive, Broadband Centrigrid® DPDT Continuous Duty Relay DC - 4 GHz, 28 vdc @ 1 A (10-50 mV @ 10-50 µA) contacts, 12 vdc 800 ohm Coil, Under relay Surface mount 8 pin 0.35" (0.89 mm) long stub leads Hermetically Sealed Surface Mount, 0.375 L x 0.375 W x 0.330 H (9.51 x 9.51 x 8.38 mm), -55°C to +85°C. Alt. P/N: GRF10312. 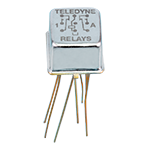 Teledyne Series RF180 Commercial RF DPDT Magnetic-Latching Continuous Duty DC - 4 GHz, 28 vdc @ 250 mA (10-50 mV @ 10-50 µA) contacts, 12 vdc 500 ohm Coil, Through-Hole 10 pin, 0.75" (19.05 mm) long pins Hermetically Sealed Square Case, 0.475 L x 0.375 W x 0.3 H (12.06 x 5.08 x 7.62 mm), -55°C to +85°C. 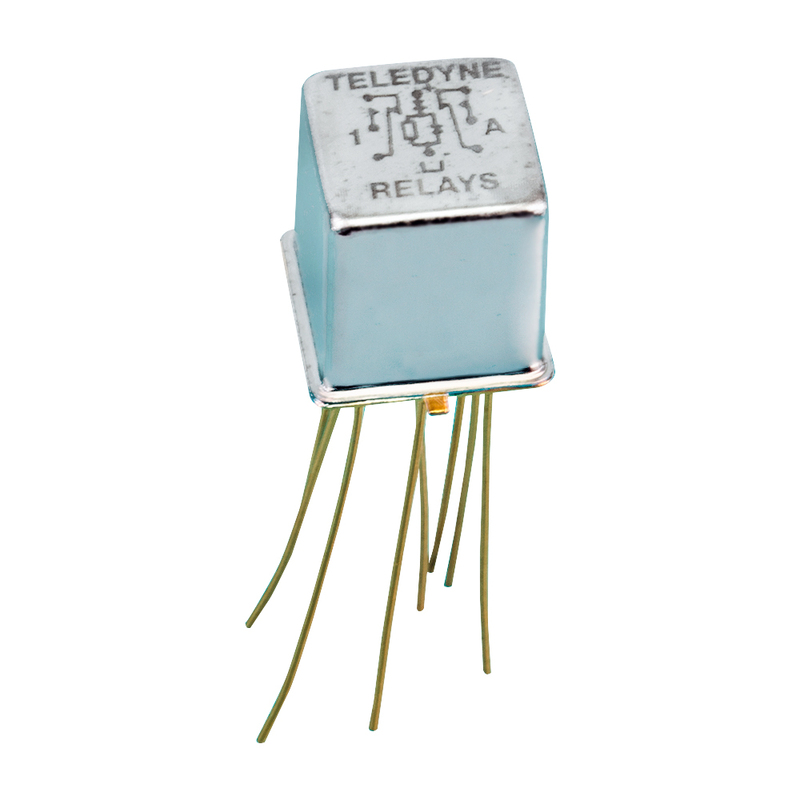 Teledyne Series 412 Established Reliability TO-5 2 Form C (DPDT) Relay, Continuous Duty, Military Model. Alt. P/N: 412D6895. 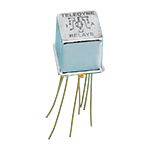 Teledyne Series RF100 High Repeatability, Broadband, Centrigrid® DPDT Non-Latching Continuous Duty DC - 3 GHz, 10-50 mV @ 10-50 µA contacts, 12 vdc 390 ohm Coil, Through-Hole 8 pin, 0.75" (19.05 mm) long leads Hermetically Sealed Square Case, 0.375 L x 0.375 W x 0.290 H (9.53 x 9.53 x 7.37 mm), -55°C to +85°C. 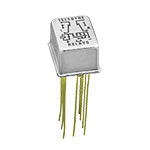 Panasonic Surface Mount DPDT (2 Form C) 30 vdc @ 300 mA maximum contacts DC-8GHz 1 Watt maximum at 5 GHz with 0.5 - 1.25 dB loss, 50 ohm impedance at 5 GHz, 30 dB isolation, 4.5 vdc 10.2 ohm 44.4 mA Coil. Alt. P/N: ARJ20A4HX. 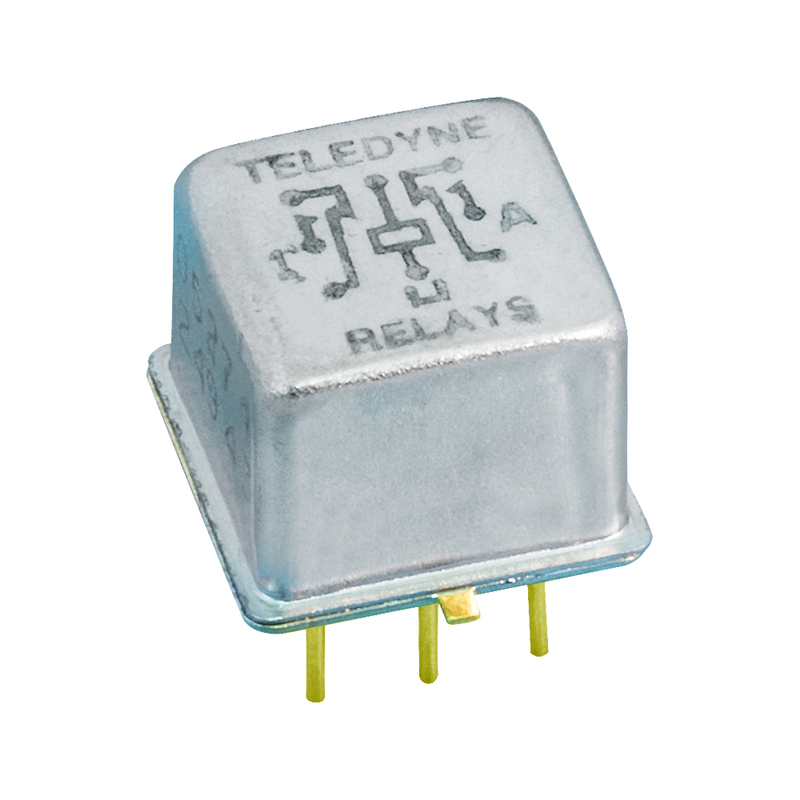 Teledyne Series KD Optically Isolated, Short-Circuit Protected, DC SPST Solid State Relay, 60 vdc @ 5 A contacts, 5 vdc @ 14 mA, or 18 vdc @ 1 mA + Control of 5 vdc @ 250 µA Actuator, Through-Hole 6 pin, 0.475" (6.93 mm) long leads Hermetically Sealed DIP Case, 1.375 L x 0.8 W x 0.22 H (34.925 x 20.345 x 5.59 mm), -55°C to +105°C. 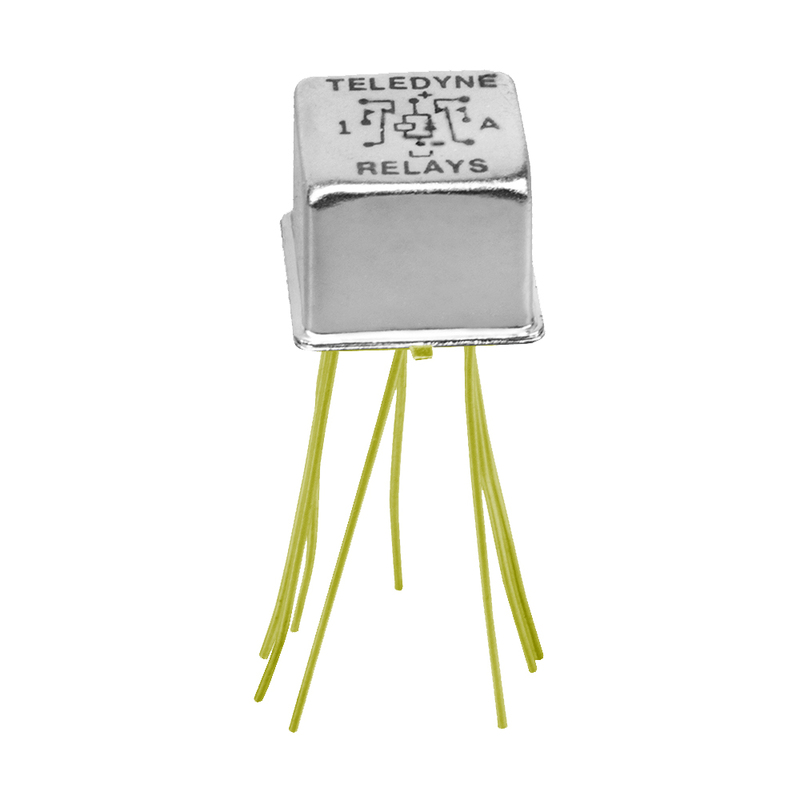 Teledyne Series GLB363 DPDT LoopBack 100 nF Capacitance Relay, 28 vdc @ 1 A (10-50 mV @ 10-50 µA) contacts, 12 vdc 400 ohm Coil, Under relay Surface mount 10 pin stub leads Hermetically Sealed Oval Case, 0.770 L x 0.335 W x 0.415 H (19.56 x 8.51 x 10.54 mm), -55°C to +85°C. Alt. 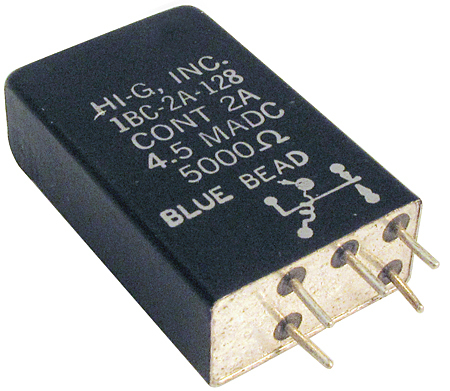 P/N: GLB36310012. 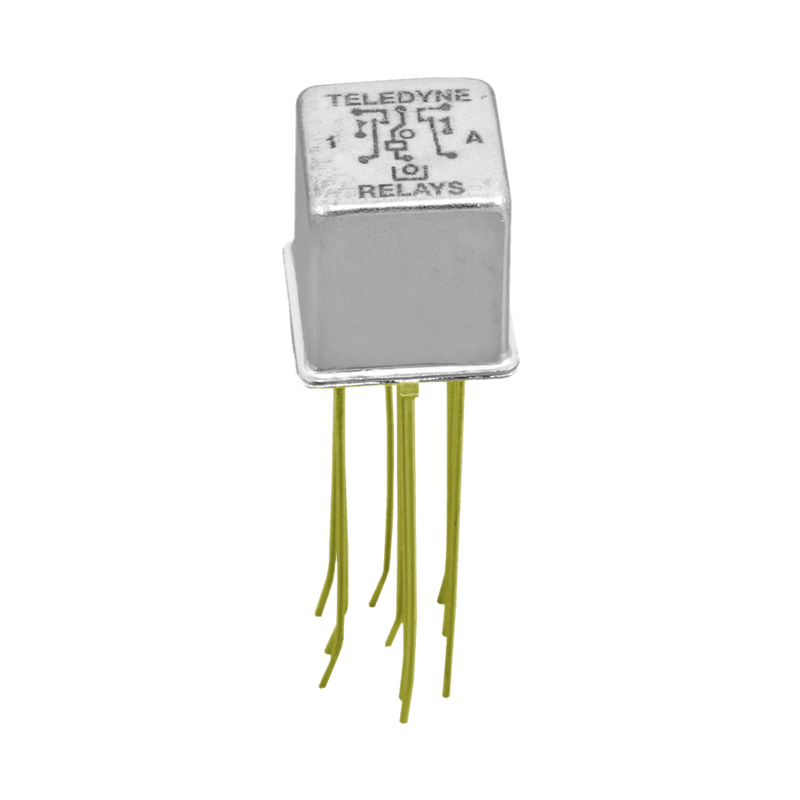 Teledyne Series LB363 DPDT LoopBack 100 nF Capacitance Relay, 28 vdc @ 1 A (10-50 mV @ 10-50 µA) contacts, 12 vdc 400 ohm Coil, Through-Hole 10 leads Hermetically Sealed Oval Case, 0.770 L x 0.335 W x 0.375 H (19.56 x 8.51 x 9.52 mm), -55°C to +85°C. 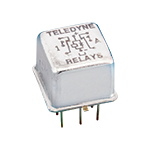 Teledyne Series GRF100 Surface Mount, High Repeatability, Broadband Centrigrid® DPDT Continuous Duty Relay DC - 4 GHz, 28 vdc @ 1 A (10-50 mV @ 10-50 µA) contacts, 5 vdc 50 ohm Coil, Under relay Surface mount 8 pin 0.35" (0.89 mm) long stub leads Hermetically Sealed Surface Mount, 0.375 L x 0.375 W x 0.330 H (9.51 x 9.51 x 8.38 mm), -55°C to +85°C. Alt. 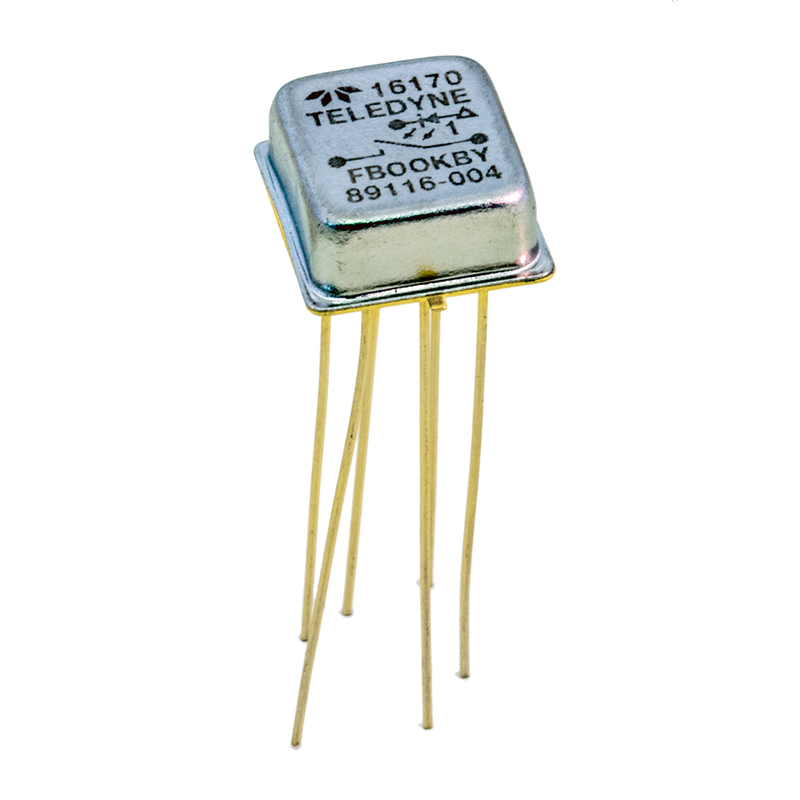 P/N: GRF1005. 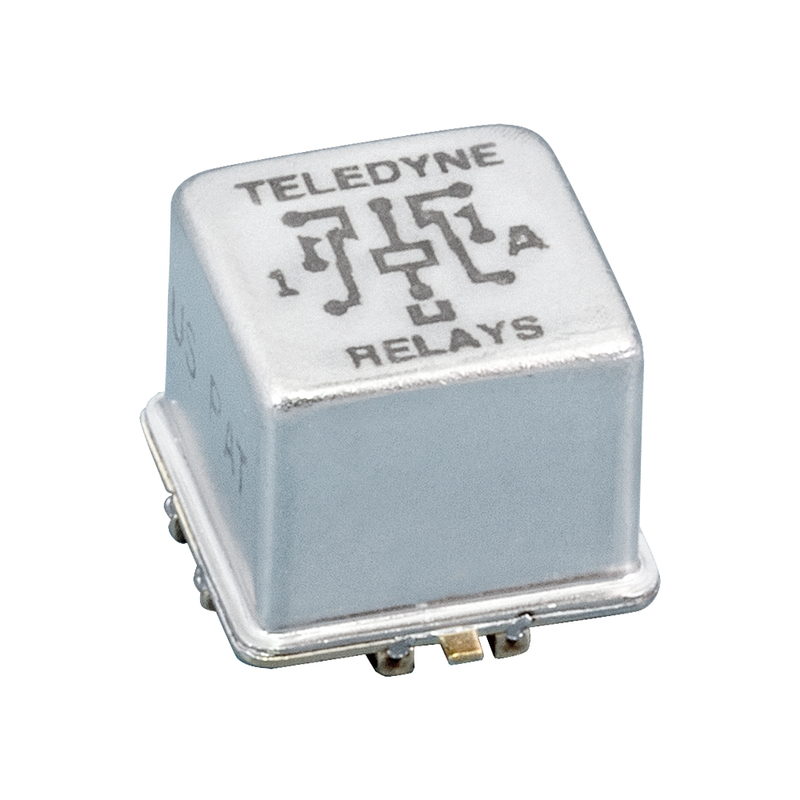 Teledyne Series HD True Output Status Feedback, Short-Circuit Protected DC SPST Solid State Relay, 60 vdc @ 2 A contacts, 5 vdc @ 14 mA, or 18 vdc @ 1 mA + Control of 5 vdc @ 250 µA Actuator, Through-Hole 6 pin, 0.273" (6.93 mm) long leads Hermetically Sealed DIP Case, 0.89 L x 0.53 W x 0.19 H (22.6 x 13.5 x 4.83 mm), -55°C to +105°C. Alt. P/N: 88062-004. 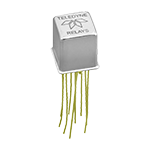 Tyco Magnetic Latching High-Performance Relay DPDT 28 vdc @ 2 A Contacts 0-1 GHz (0.1 dB loss @ 100 Mhz / 0.6 dB loss @ 1GHz), 38 - 45 db Isolation (38 db @ 100 Mhz / 45 db @ 1 GHz), 2.0 ms max bounce, 26.5 vdc nominal coil 1000 ohm, Through hole PCB mount, Continuous Duty. Alt. 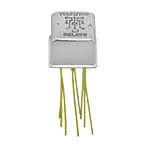 P/Ns: M39016/45, MIL-R-39016/45. 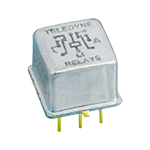 Teledyne Series LA Optically Isolated AC SPST Solid State Relay, 250 VAC @ 7.5 A RMS contacts, 3.8-32 vdc @ 15 mA, or 3.8-32 vdc @ 16 mA + Control of 5 vdc @ 250 µA Actuator, Through-Hole 6 pin, 0.475" (6.93 mm) long leads Hermetically Sealed DIP Case, 1.375 L x 0.8 W x 0.295 H (34.925 x 20.345 x 7.49 mm), -55°C to +110°C. 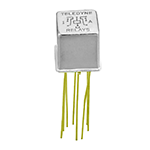 Tyco DPDT 28 vdc 500mA contacts, 12 V DC 375 ohm coil, Continuous Duty. 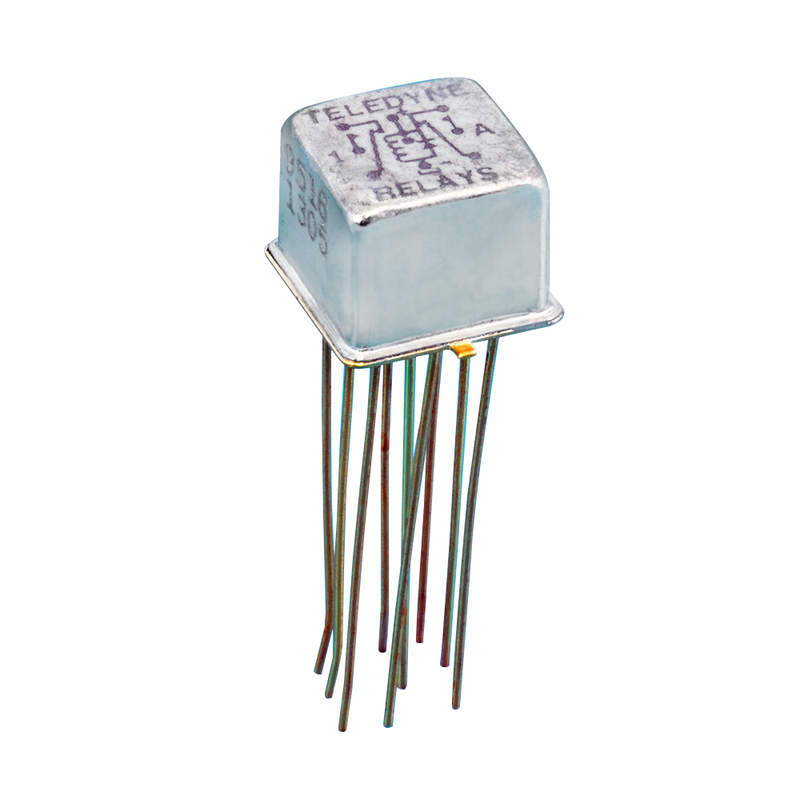 NSN: 5945-01-329-1145.